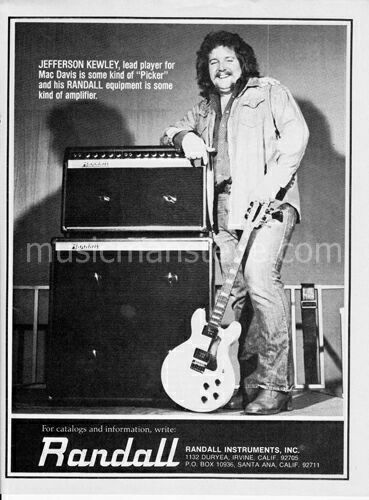 1978 ACOUSTIC AMPS PRINT AD shown in the photo. 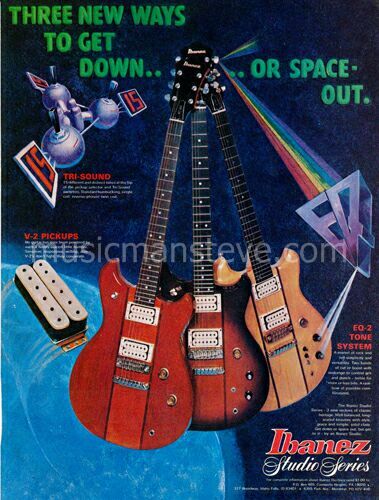 This is an original print ad from a 1978 magazine that measures approximately 8" x 10 3/4" and is suitable for framing. 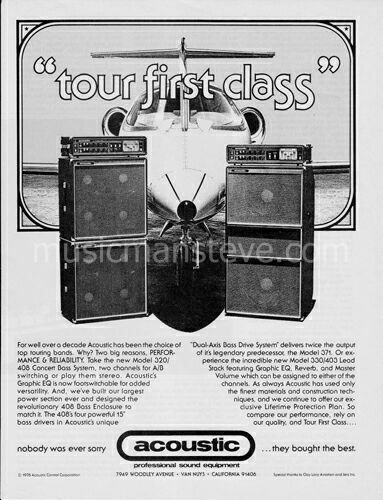 This is a cool early ad for ACOUSTIC AMPS and it's by-line is " TOUR FIRST CLASS" shows two amps. 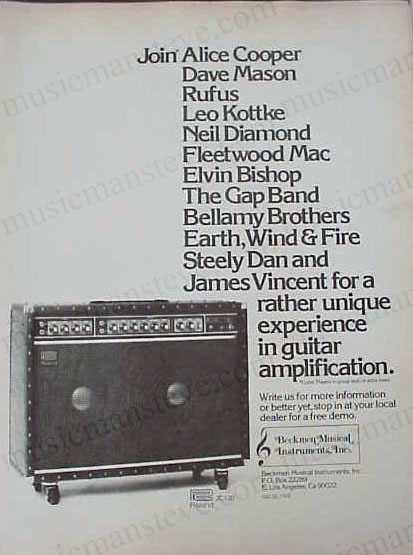 ..
1978 ACOUSTIC AMPS PRINT AD shown in the photo. 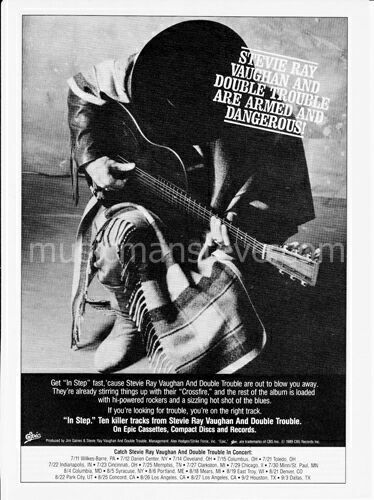 This is an original print ad from a 1978 magazine that measures approximately 8" x 10 3/4" and is suitable for framing. 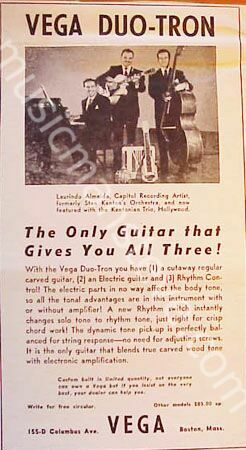 This is a cool early ad for ACOUSTIC AMPS and it's by-line is "QUICK, What Company Makes The Most Efficient P.A. 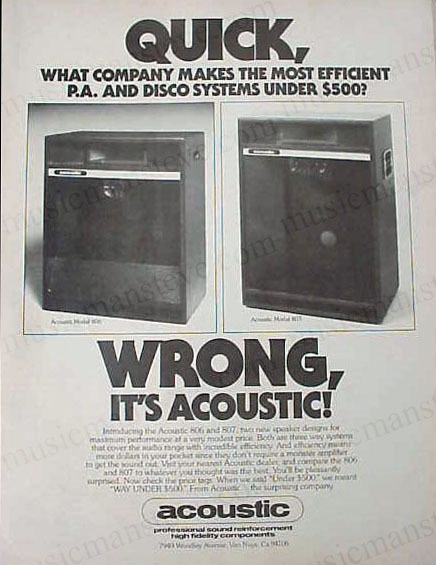 and Disco Systems Under $500?" 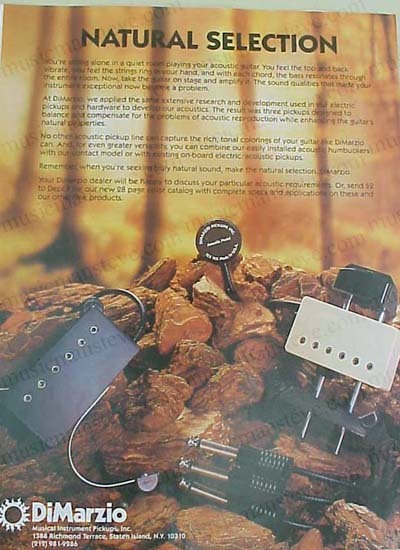 shows Acoustic models 806 & 807 amps. 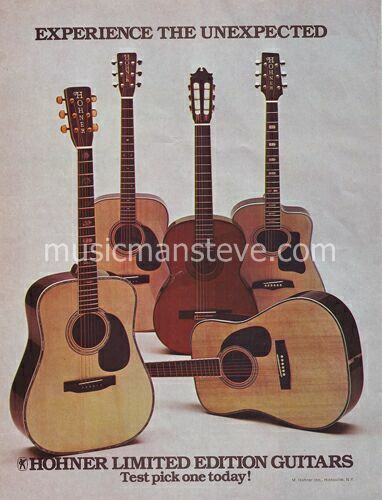 ..
1970s ACOUSTIC AMPS PRINT AD shown in the photo is an original print ad from a 1970s magazine that measures approximately 8" x 10 3/4" and is suitable for framing. 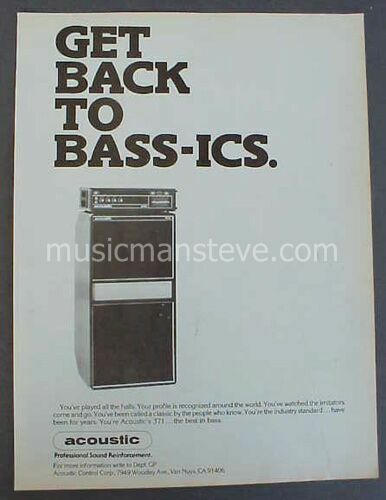 This is a cool early ad for ACOUSTIC AMPS and it's by-line is "GET BACK TO BASS-ICS" shows the Acoustic 371 bass amp. 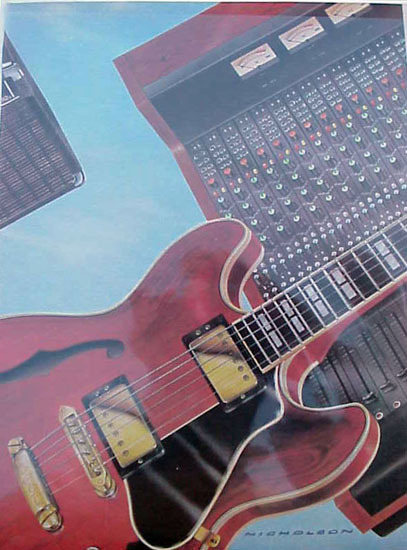 ..
1970s ACOUSTIC MIXER PRINT AD shown in the photo is an original print ad from a 1970s magazine that measures approximately 8" x 10 3/4" and is suitable for framing. 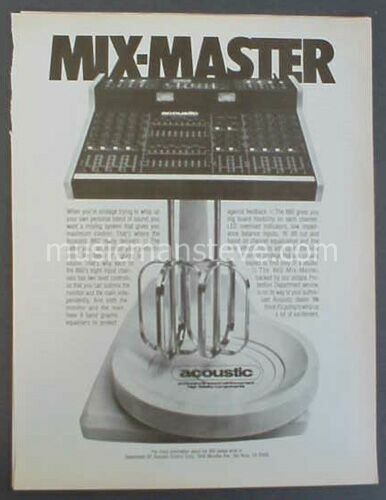 This is a cool early ad for ACOUSTIC and it's by-line is "MIX-MASTER" showS the Acoustic 860 mixer. 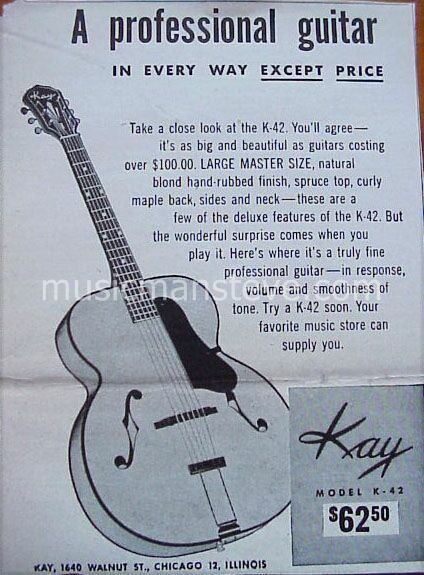 ..
1975 ALVAREZ by K.YAIRI GUITARS PRINT AD shown in the photo is an original print ad from a 1975 magazine that measures approximately 8" x 11" and is suitable for framing. 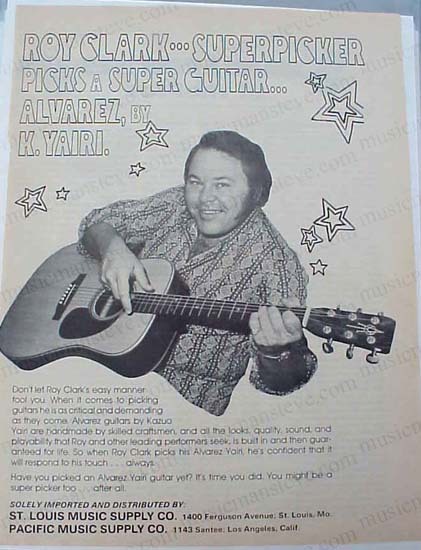 This is a cool early ad for ALVAREZ by K.YAIRI GUITARS (St Louis Music Supply) showing ROY CLARK picking guitar...byline is "Roy Clark Superpicker Picks a Super Guitar.."
1982 ALVAREZ YAIRI GUITAR PRINT AD shown in the photo is an original print ad from a 1982 magazine that measures approximately 8" x 11" ..endorser the late great MERLE TRAVIS "I Love Alvarez"...good one to frame. 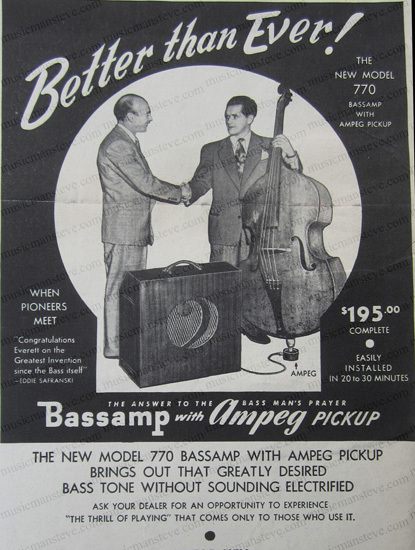 1947 AMPEG BASSAMP with PICKUP PRINT AD shown in the photo is an original print ad from a 1947 magazine that measures approximately 6 1/2" x 10" and is suitable for framing. 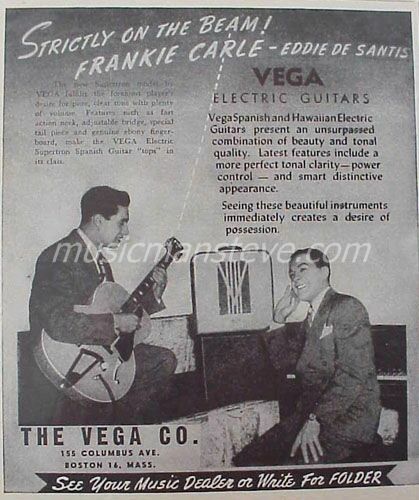 This is a cool early ad for AMPEG showing EDDIE SAFRANSKI and the NEW MODEL 770 BASSAMP WITH AMPEG PICKUP congratulating the inventor of this Bassamp microphone setup and byline is "Better Than Ever.."
1946 AMPEG BASSAMP with PICKUP PRINT AD shown in the photo is an original print ad from a 1946 magazine that measures approximately 6 1/2" x 10 1/2" and is suitable for framing. 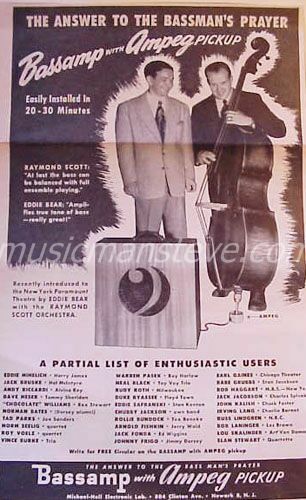 This is a cool early ad for AMPEG showing EDDIE BEAR playing upright bass with the Bassamp microphone setup and byline is "The Answer to the Bassman's Prayer.." ..
1951 AMPEG BASSAMP CO PRINT AD shown in the photo is an original print ad from a 1951 magazine that measures approximately 2" x 6 1/2" and is suitable for framing. 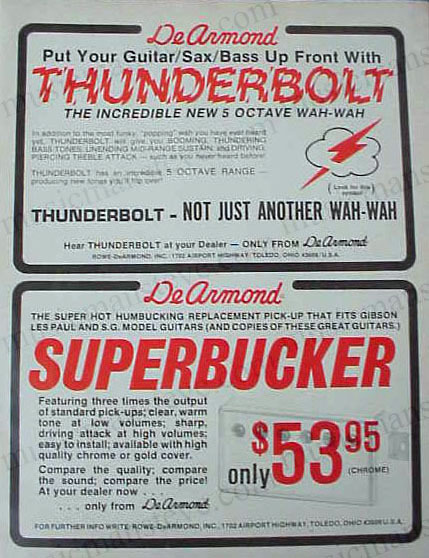 This is a cool early ad for AMPEG promoting the Ampeg Bass Amp..."announcing the new Super 815 with 15" speaker". 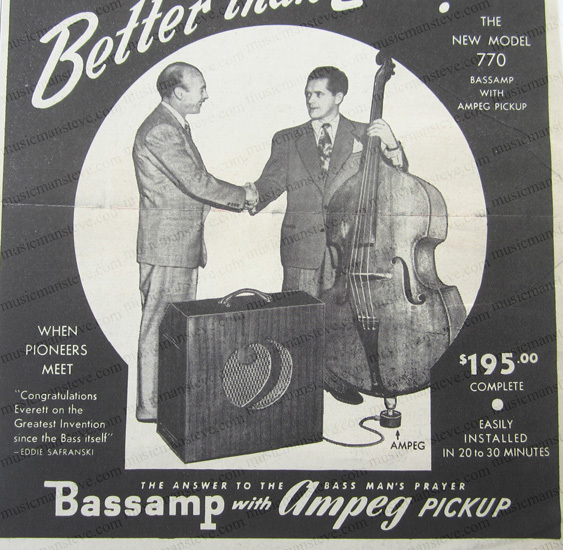 ..
1950 AMPEG BASSAMP CO PRINT AD shown in the photo is an original print ad from a 1950 magazine that measures approximately 3" x 4" and is suitable for framing. 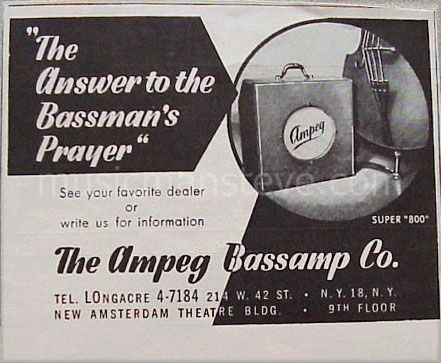 This is a cool early ad for AMPEG promoting the Ampeg Bass Amp..."The Answer to the Bassman's Prayer". 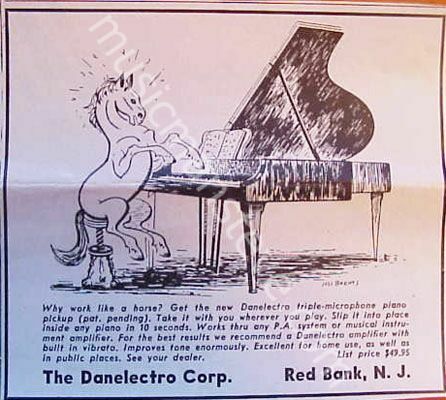 ..
1950 AMPERITE MICROPHONES PRINT AD shown in the photo is an original print ad from a 1950 magazine that measures approximately 4" x 4 1/4" and is suitable for framing. 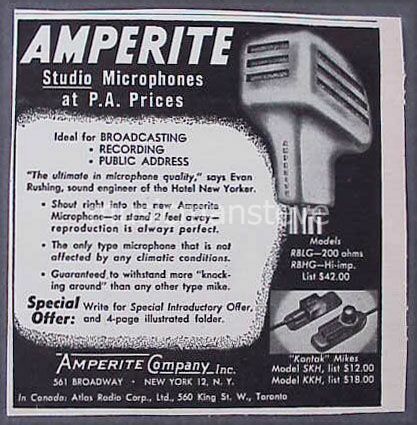 This is a cool early ad for AMPERITE showing a microphone and byline is "Studio Microphones at P.A. 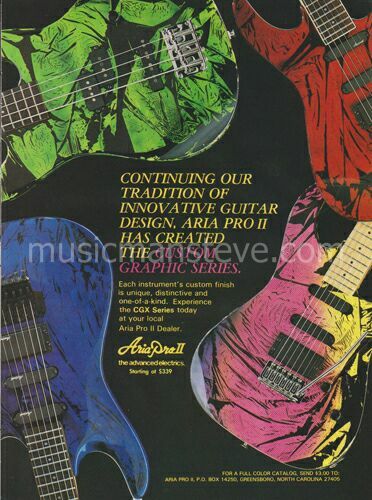 Prices.." ..
1979 ARIA PRO II PRINT AD shown in the photo is an original print ad from a 1979 magazine that measures approximately 8 1/2" x 11" and is suitable for framing. 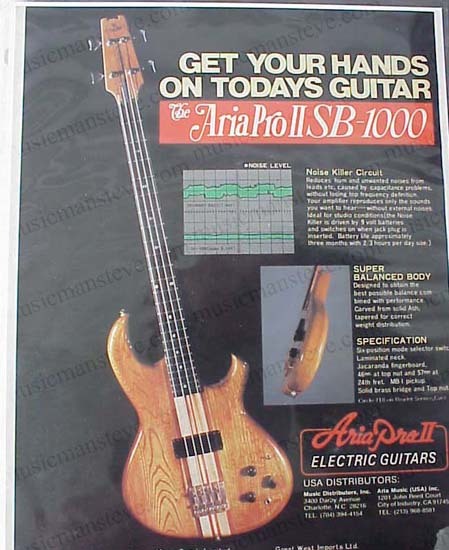 This is a cool early ad for ARIA PRO II SB-1000 guitar... the byline "Get Your Hands On Today's Guitar.."
1982 ARIA PRO II PE-R80 GUITAR AD & REVIEW shown in the photo. 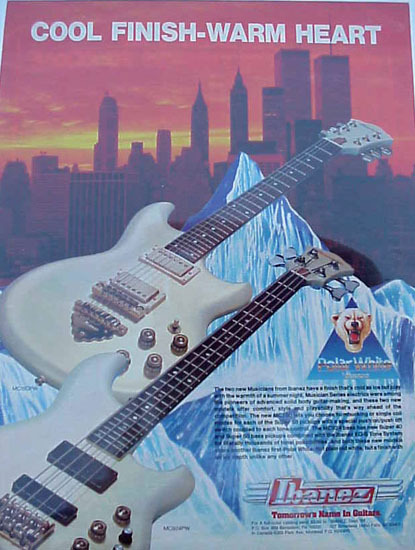 This is an original print ad from a 1982 magazine that measures approximately 8 1/4" x 11" and is suitable for framing. 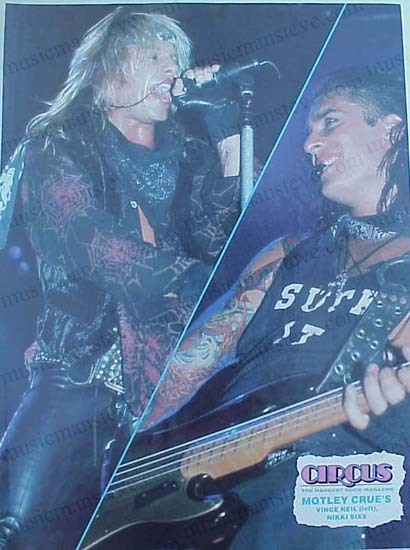 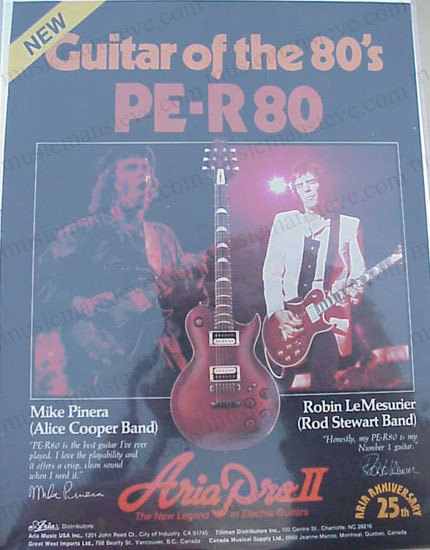 This is a cool vintage ad for ARIA featuring MIKE PINERA (Alice Cooper Band) and ROBIN LeMESURIER (Rod Stewart Band). 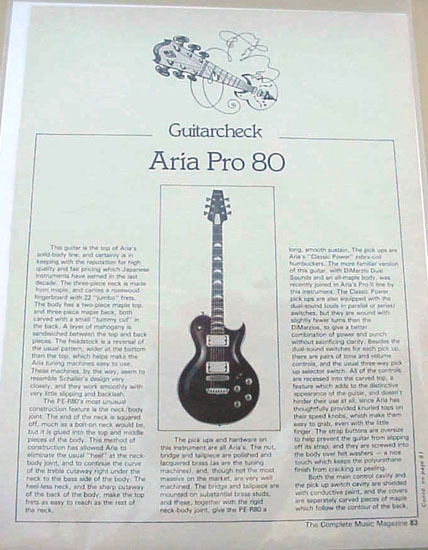 Also included is a second page with "Guitarcheck" review for the Aria Pro80 guitar..
1979 ARP OMNI-2 PRINT AD shown in the photo is an original print ad from a 1979 magazine that measures approximately 8 1/2" x 11" and is suitable for framing. 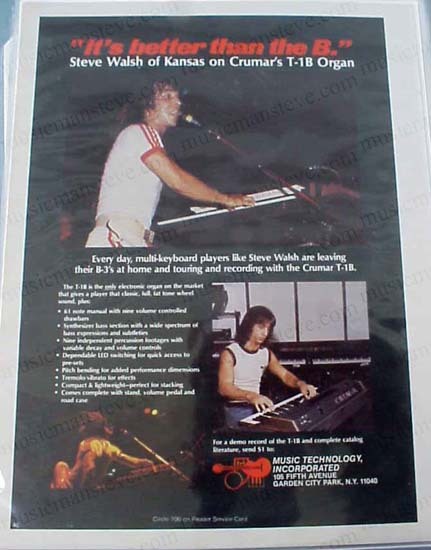 This is a cool early ad for ARP featuring their OMNI-2... the byline "Few professional keyboards stack up to the ARP Omni-2.."
1979 CRUMAR's T-1B Organ print AD featuring Steve Walsh of Kansas shown in the photo is an original print ad from a 1979 magazine that measures approximately 8 1/2" x 11" and is suitable for framing. 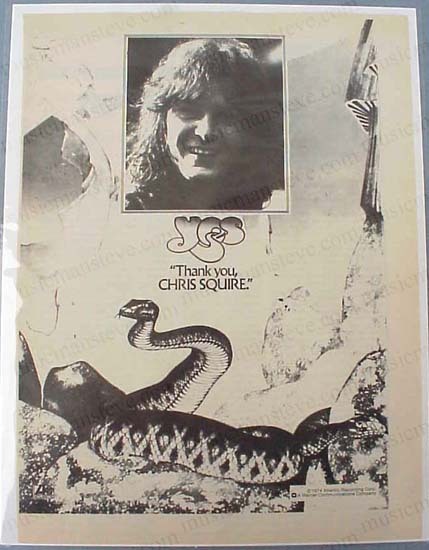 1975 ATLANTIC RECORDING THANK YOU CHRIS SQUIRE shown is an original cool print ad from a 1975 trade magazine that measures approximately 8" x 11" and is suitable for framing.. 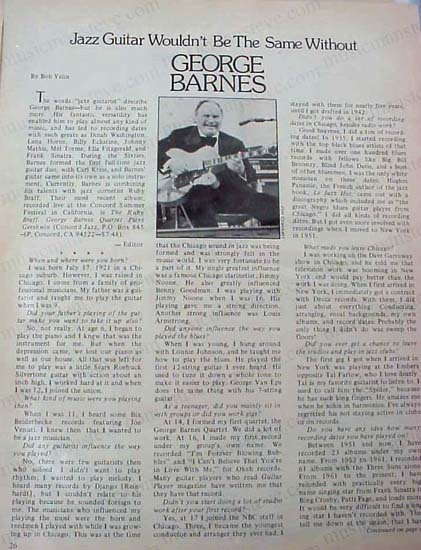 This is a cool early excerpt with Chris Squire's photo... "YES, Thank You Chris Squire.."
1975 GEORGE BARNES Jazz Guitar complete 3 pg article shown is an original excerpt from a 1975 trade magazine that measures approximately 8" x 11" and is suitable for framing.. 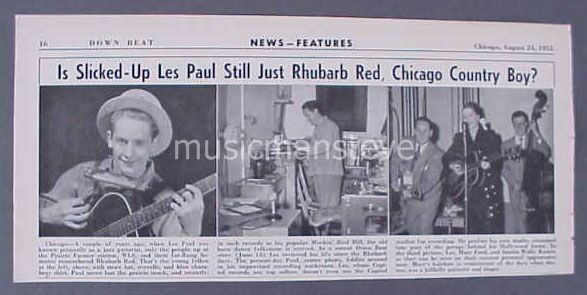 This is a cool early excerpt with George's photo and complete interview..multiple pages..
1951 BILLY BAUER & MARY OSBORNE news photo shown is an original excerpt from a 1951 magazine that measures approximately 4" x 4 1/4" and is suitable for framing. 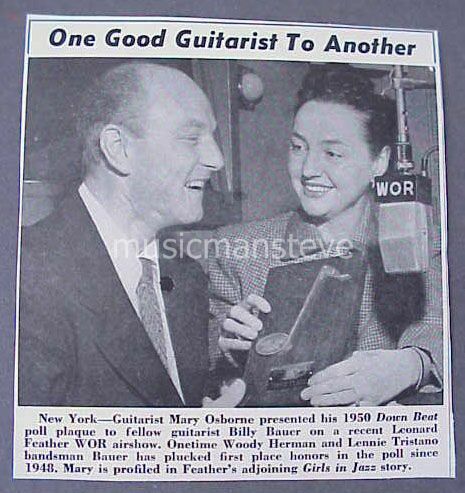 This is a cool early newsprint photo showing Mary Osborne presenting an award to Billy Bauer.....byline is "One Good Guitarist To Another"
1978 BC RICH PRINT AD shown in the photo. 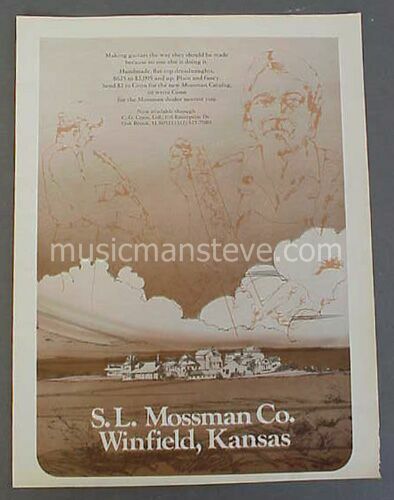 This is an original print ad from a 1978 magazine that measures approximately 8" x 10 3/4" and is suitable for framing. 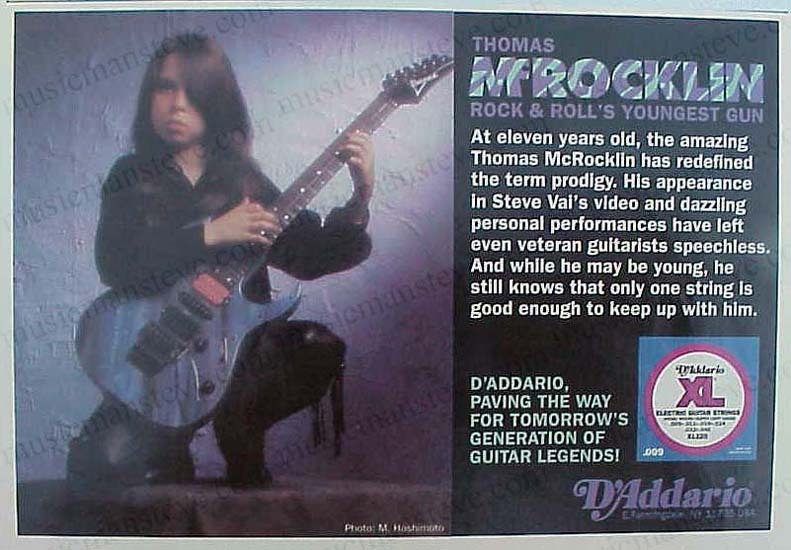 This is a cool early ad showing RICK DERRINGER playing a BC RICH MOCKINGBIRD guitar. .
1979 B.C. 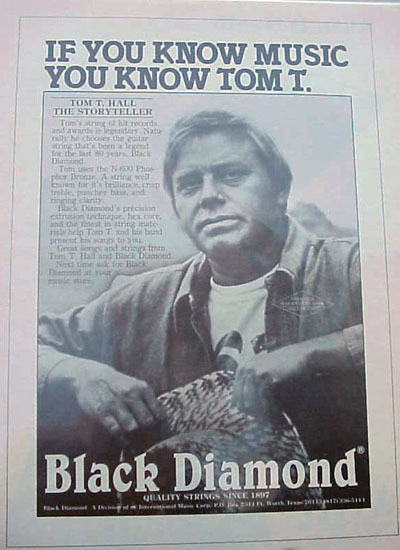 RICH PRINT AD shown in the photo is an original print ad from a 1979 magazine that measures approximately 8 1/2" x 11" and is suitable for framing. 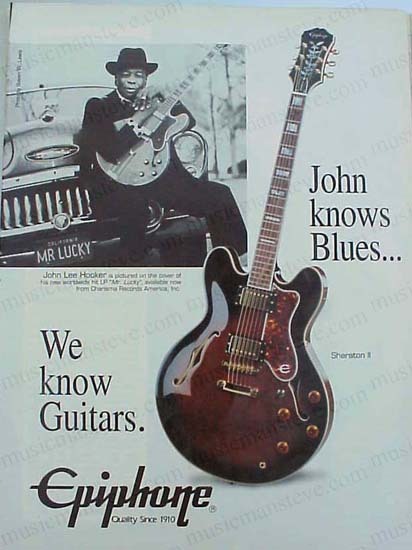 This is a cool early ad for B.C. 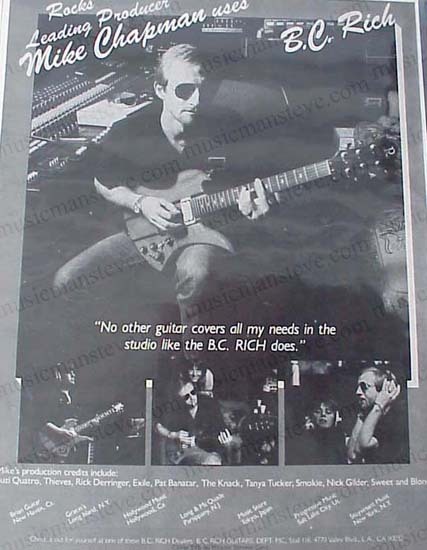 RICH featuring Mike Chapman playing a RICH guitar with the byline "No Other guitar covers all my needs in the studio like the B.C. 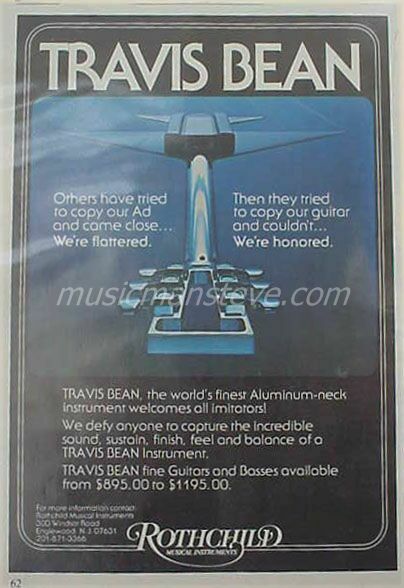 RICH does..."
1970s TRAVIS BEAN PRINT AD shown in the photo is an original print ad from a 1970s magazine that measures approximately 5" x 7" and is suitable for framing. 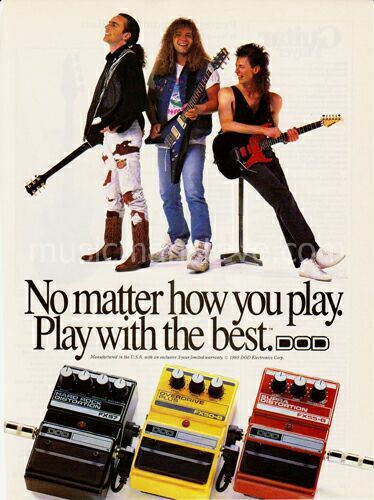 This is a cool early ad for TRAVIS BEAN guitars (Rothchild Musical Instruments) with the by-line "Others have tried to copy our Ad and come close....we're flattered...."
1982 BOSS PEDAL PRINT AD shown in the photo is an original print ad from a 1982 magazine that measures approximately 8" x 11" ..shows guitar pedals..flanger, chorus, delay. 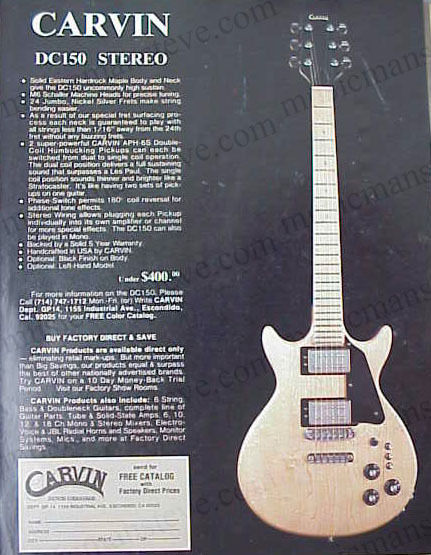 1978 CARVIN GUITAR PRINT AD shown in the photo. 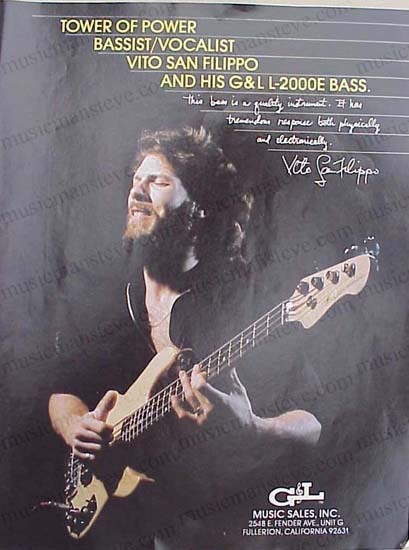 This is an original print ad from a 1978 magazine that measures approximately 8" x 10 3/4" and is suitable for framing. 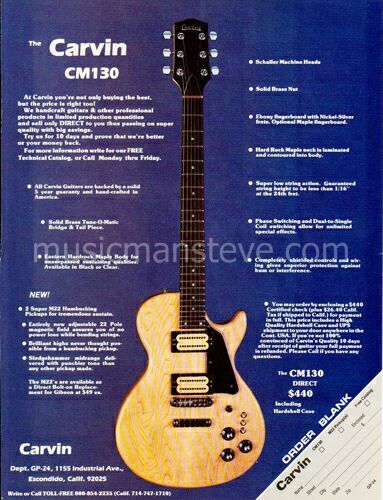 This is a cool early ad for Carvin guitars and it shows the CM130 solid body electric guitar. 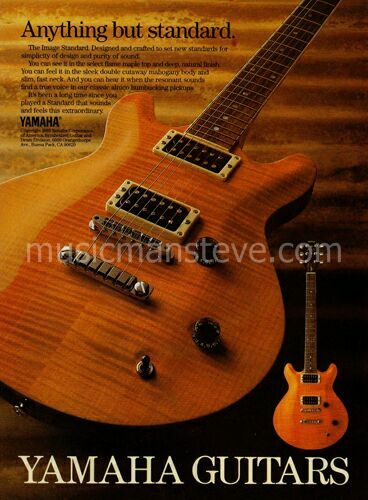 1982 CARVIN GUITARS PRINT AD shown in the photo. 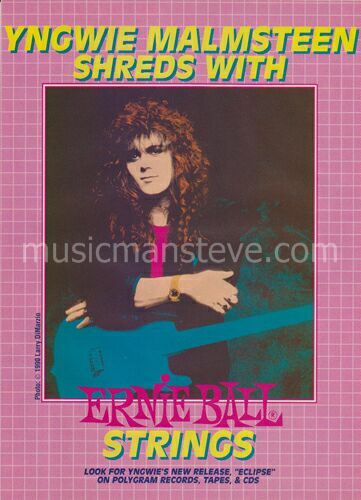 This is an original print ad from a 1982 magazine that measures approximately 8 1/4" x 11" and is suitable for framing. 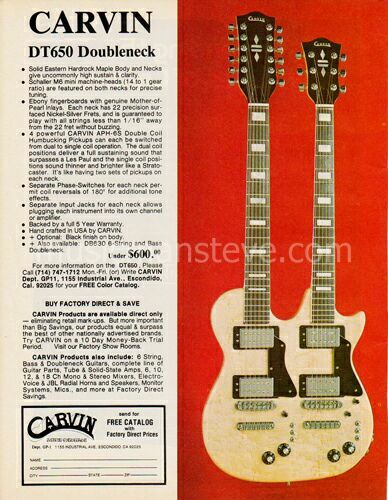 This is a cool vintage ad for CARVIN GUITARS featuring guitars, amps and electronics. 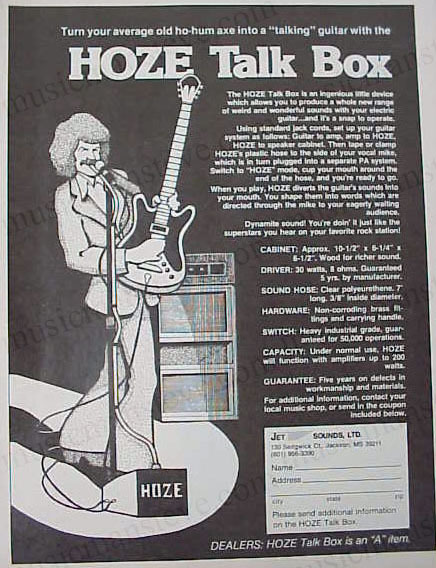 1982 CARVIN X AMP PRINT AD shown in the photo is an original print ad from a 1982 magazine that measures approximately 8" x 11" ..with FRANK ZAPPA. 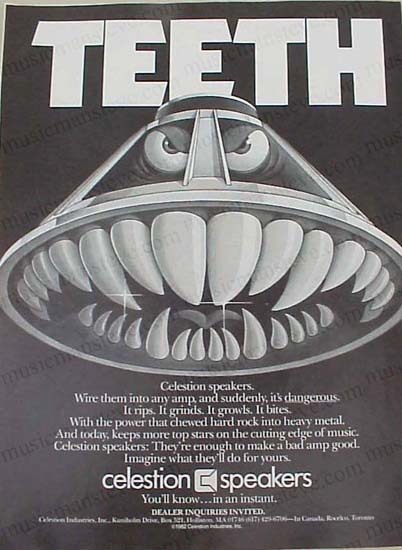 1982 CELESTION SPEAKERS PRINT AD shown in the photo is an original print ad from a 1982 magazine that measures approximately 8" x 11" .."TEETH"...IT RIPS, IT GROWLS, IT BITES ...good one to frame. 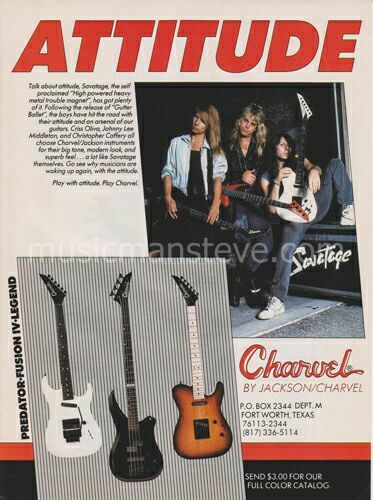 1978 CHARVEL GUITAR PARTS AD shown in the photo is an original print ad from a 1978 magazine that measures approximately 8" x 10 3/4" and is suitable for framing. 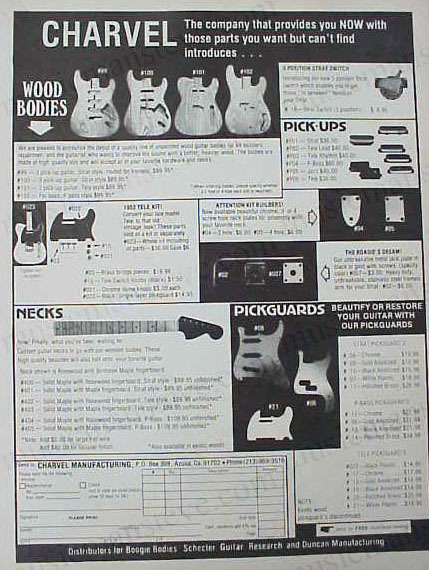 This is a cool early ad for Charvel guitar parts & accessories and it shows solid bodies, pickups and pickguards. 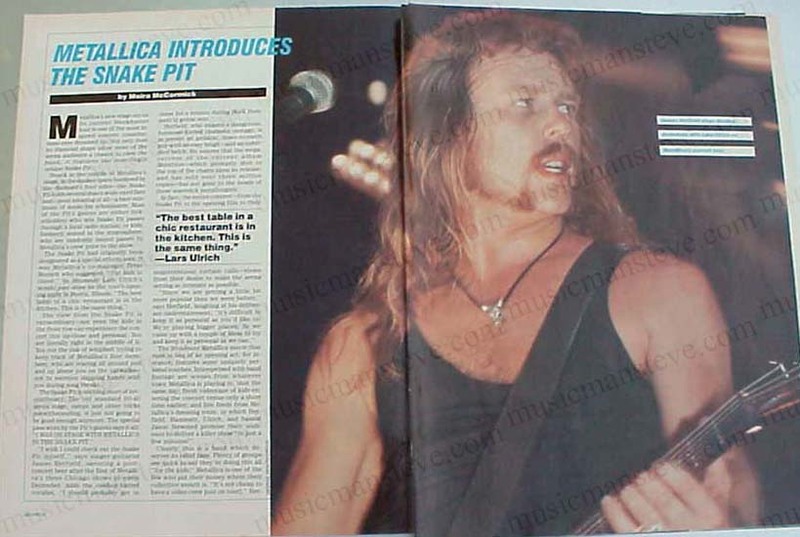 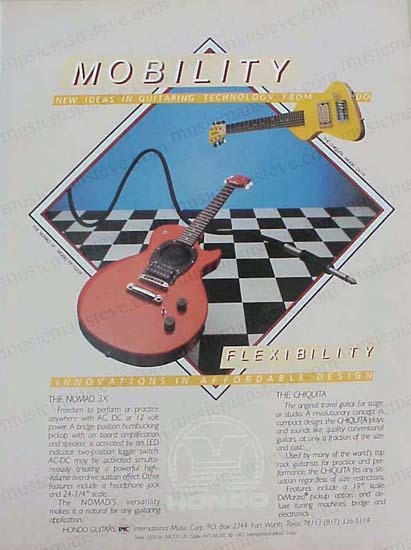 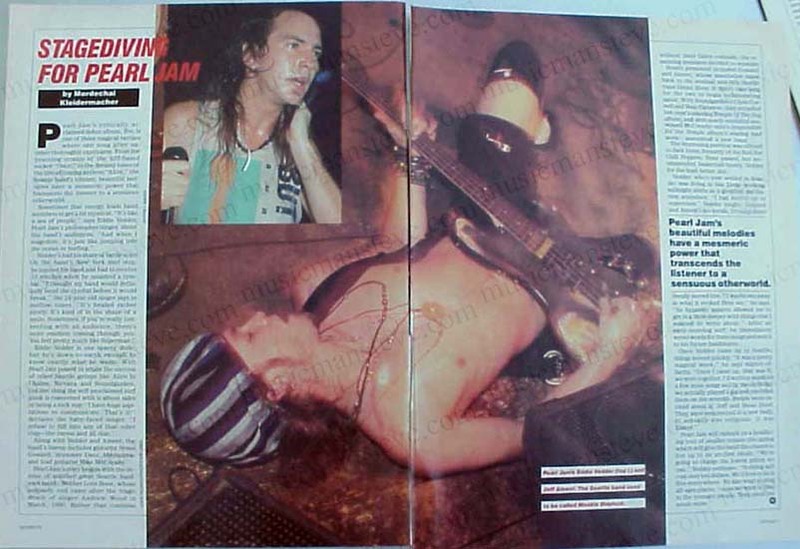 1990 CHARVEL GUITAR PRINT AD shown in the photo. 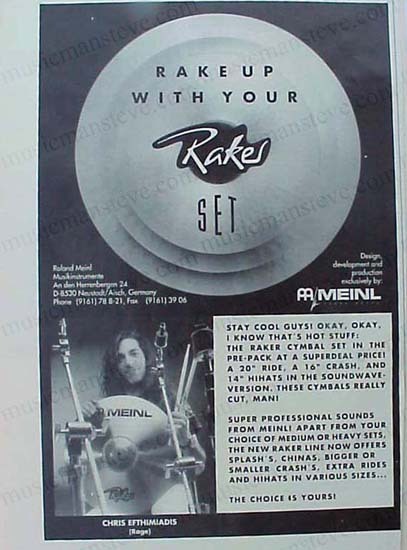 This is an original print ad from a 1990 magazine that measures approximately 8" x 10 3/4" and is suitable for framing. 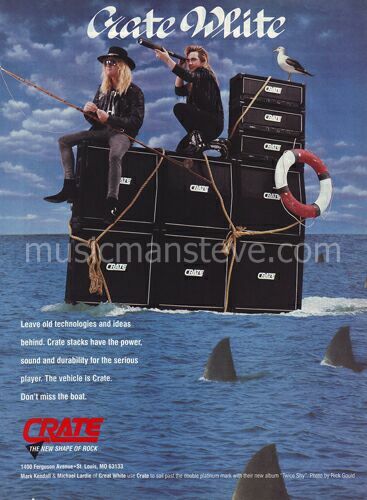 This is a cool early ad promoting the Predator, Fusion IV and Legend Charvels with Heavy Metal endorsers SAVATAGE..
1997 CRATE AMPS PRINT AD shown in the photo is an original print ad excerpted from a 1997 magazine that measures approximately 8" x 11" ..DUAL TRIODE SERIES Amps. 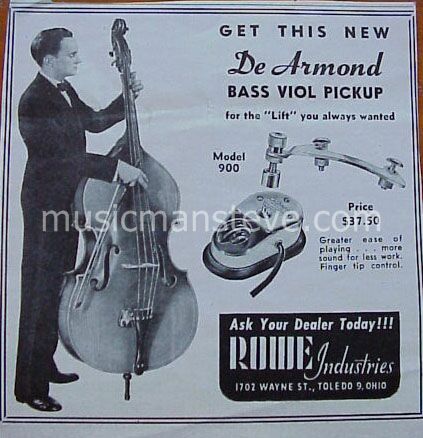 1951 DeARMOND (ROWE INDUSTRIES) PRINT AD shown in the photo is an original print ad from a 1951 magazine that measures approximately 4" x 6" and is suitable for framing. 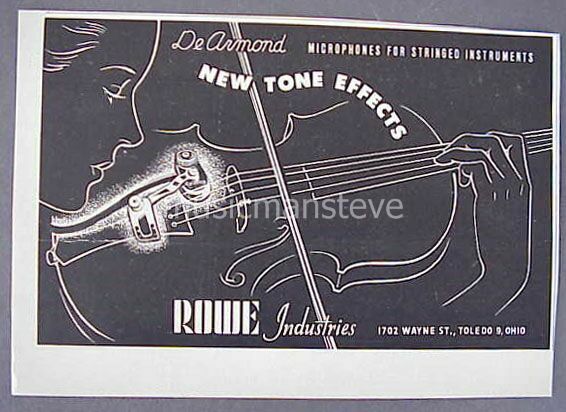 This is a cool early ad featuring a drawing of a violin with a DeArmond pickup installed..
1978 DeARMOND (ROWE-DeARMOND,INC) PRINT AD shown in the photo is an original print ad from a 1970s magazine that measures approximately 8 1/2" x 11" and is suitable for framing. 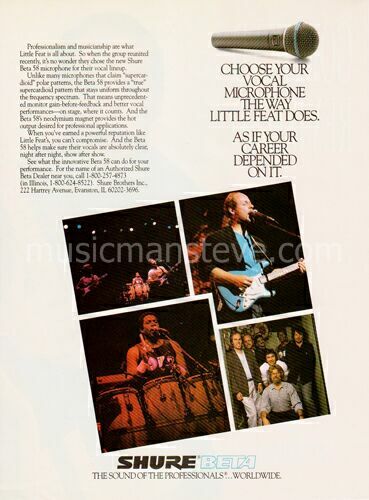 This is an interesting ad featuring the Humbucking guitar pickups offered (2200, 2300, 2400 series)..
1977 DIMARZIO PICKUPS AD 1977 featuring ROY BUCHANAN shown in the photo. 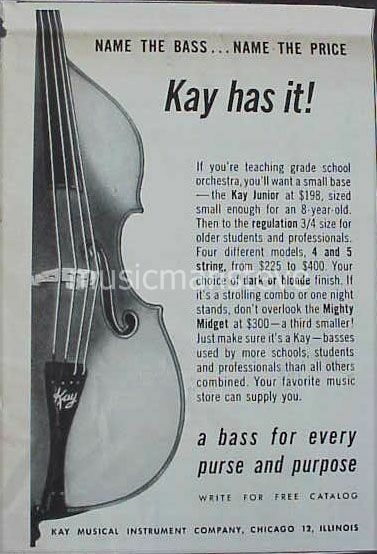 This is an original print ad from a 1977 magazine that measures approximately 8" x 10 1/2" and is suitable for framing. 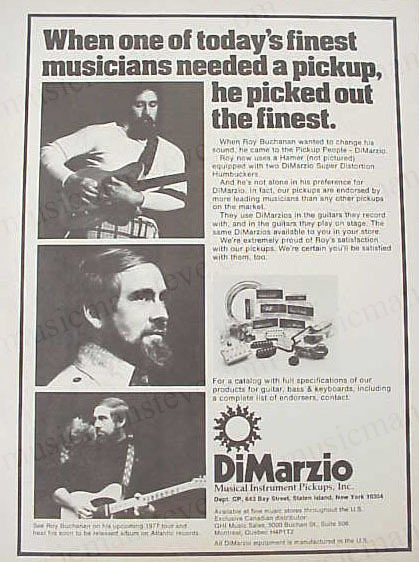 Features ROY BUCHANAN with his Tele describes the Hamer Roy was using at the time (not shown) with DiMarzio pickups.... byline is "When one of today's finest musicians needed a pickup, he picked out the finest"..... ..
1978 DIMARZIO PICKUPS PRINT AD shown in the photo. 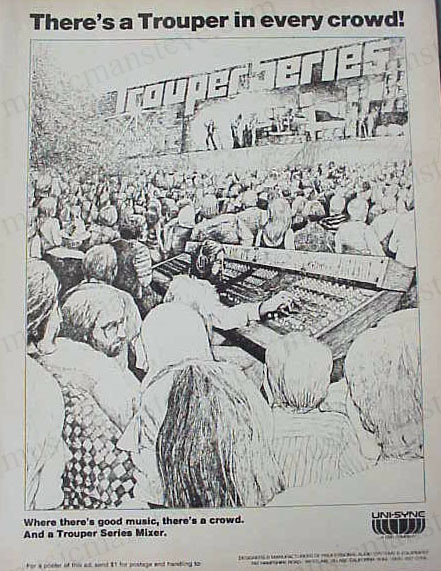 This is an original print ad from a 1978 magazine that measures approximately 8" x 10 3/4" and is suitable for framing. 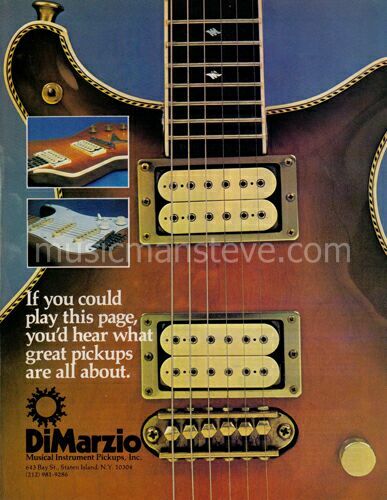 This is a cool early ad featuring a custom solid body electric guitar with DiMarzio humbuckers..
1982 DiMARZIO PICKUPS PRINT AD shown in the photo is an original print ad from a 1982 magazine that measures approximately 8" x 11" .."Natural Selection"...pin-up to frame. 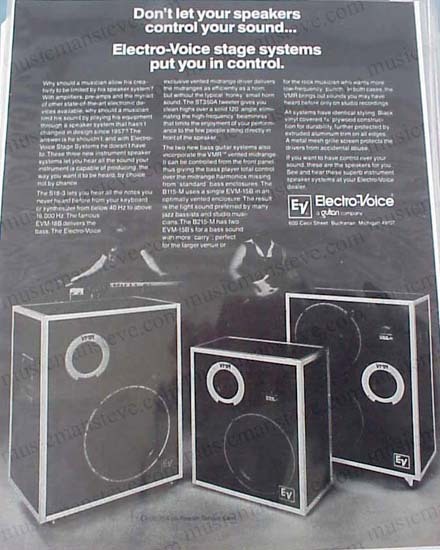 1979 DOD ELECTRONICS PRINT AD shown in the photo is an original black and white print ad from a 1979 magazine that measures approximately 8 1/2" x 11" and is suitable for framing. 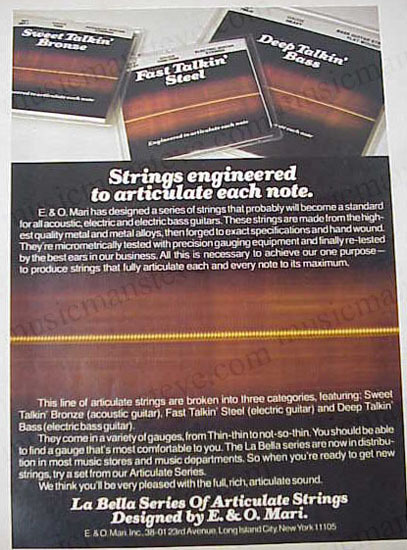 This is a cool early ad for DOD ELECTRONICS featuring several products available at this time..byline is "Take Your Pick.."
1997 DR STRINGS PRINT AD shown in the photo is an original print ad excerpted from a 1997 magazine that measures approximately 8" x 11" .."THE Handmade String" endorser Dimebag Darrel with Washburn guitar. 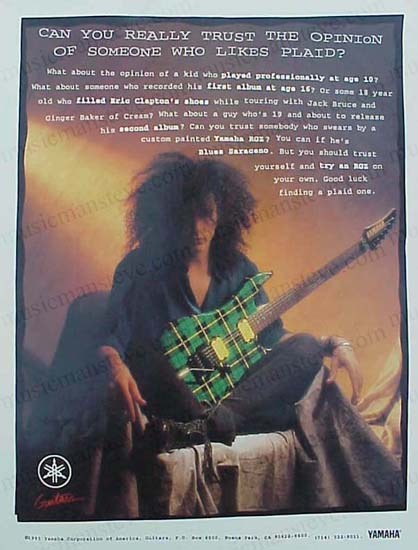 1997 SEYMOUR DUNCAN PRINT AD shown in the photo is an original print ad excerpted from a 1997 magazine that measures approximately 8" x 11" .."So Long Seth"..tribute to inventor of the Humbucker pickup..
1976 ELECTRA solid body guitar PRINT AD with Peter Frampton shown in the photo. 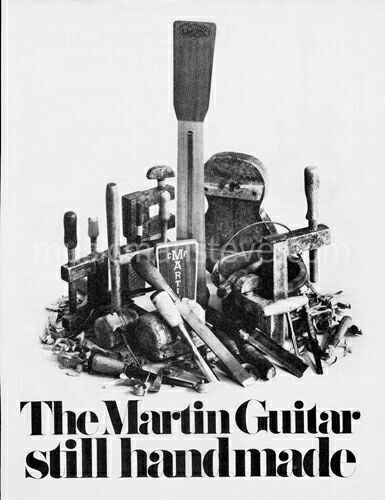 This is an original print ad from a 1976 magazine that measures approximately 8" x 10 1/2" and is suitable for framing. 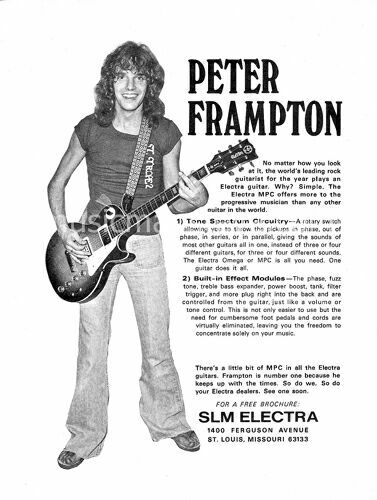 Shows the Electra Les Paul knockoff being played by Peter Frampton back in the day. 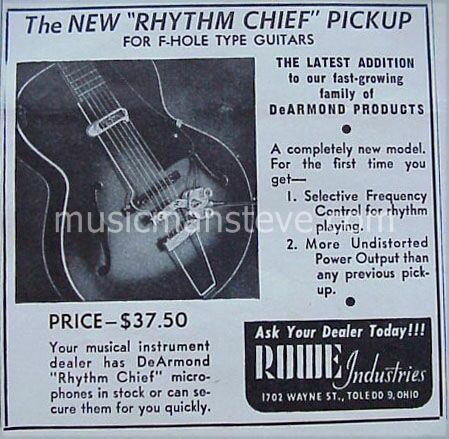 Describes the Circuitry and built-in effect modules the Electra guitars had at the time. 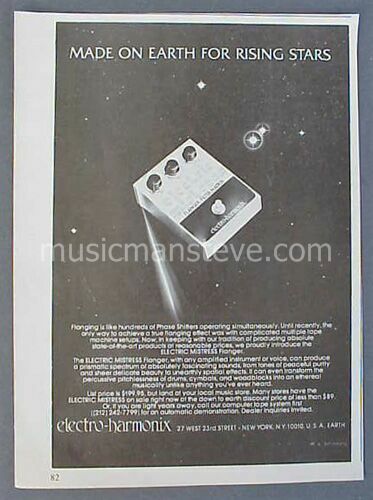 1977 ELECTRO HARMONIX "GOLDEN THROAT" AD shown in the photo. 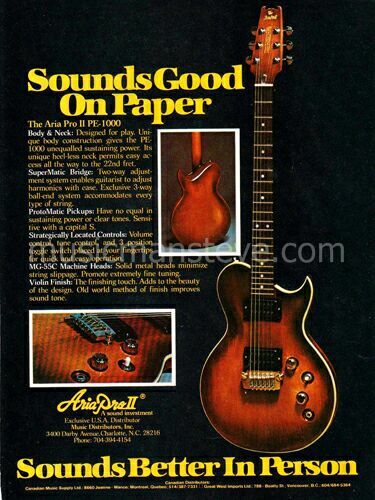 This is an original print ad from a 1977 magazine that measures approximately 8" x 10 1/2" and is suitable for framing. 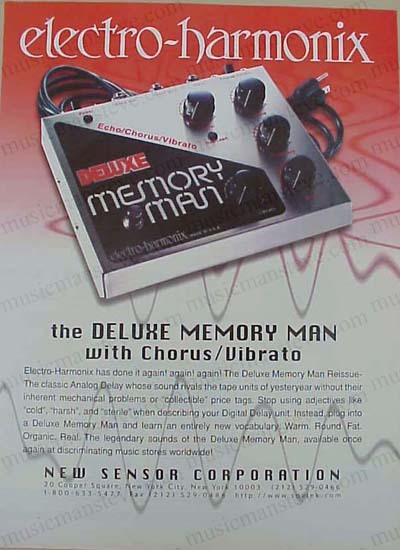 Shows the "GOLDEN THROAT" mouth tube offered by ELECTRO HARMONIX at this time..some very cool artwork..byline is "GOLDEN THROAT Mouth Tube will let you sing your axe off"..... ..
1977 ELECTRO HARMONIX "MEMORY MAN" AD shown in the photo. 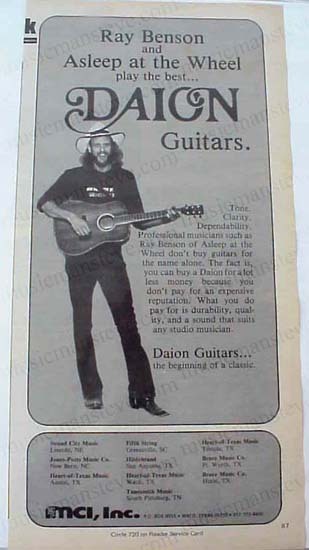 This is an original print ad from a 1977 magazine that measures approximately 8" x 10 1/2" and is suitable for framing. 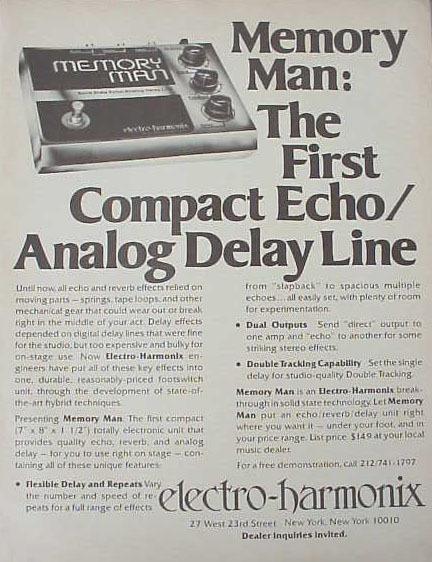 Shows the "MEMORY MAN" effect pedal offered by ELECTRO HARMONIX at this time...byline is "Memory Man: The First" Compact Echo/Analog Delay Line"..... ..
1977 ELECTRO HARMONIX "FLANGER/FILTER MATRIX" AD shown in the photo is an original print ad from a 1977 magazine that measures approximately 8" x 10 1/2" and is suitable for framing. 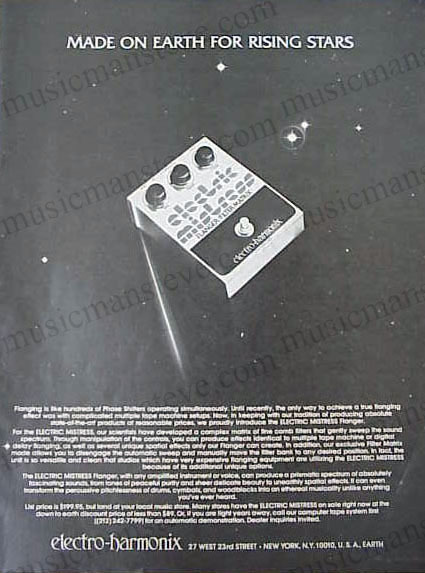 Shows the "FLANGER/FILTER MATRIX" offered by ELECTRO HARMONIX at this time..some very cool artwork..byline is "Made On Earth For Rising Stars"..... ..
1978 ELECTRO HARMONIX PRINT AD shown in the photo. 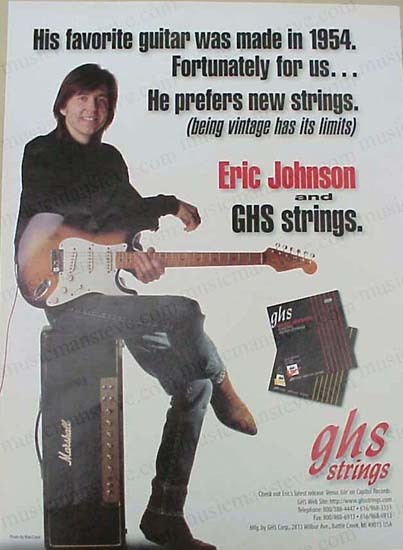 This is an original print ad from a 1978 magazine that measures approximately 8" x 10 3/4" and is suitable for framing. 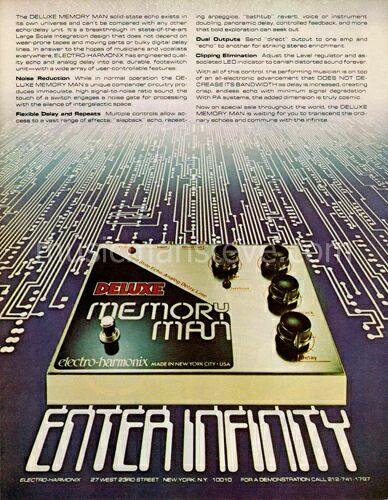 This is a cool early ad featuring the DELUXE MEMORY MAN with ad line "Enter Infinity". 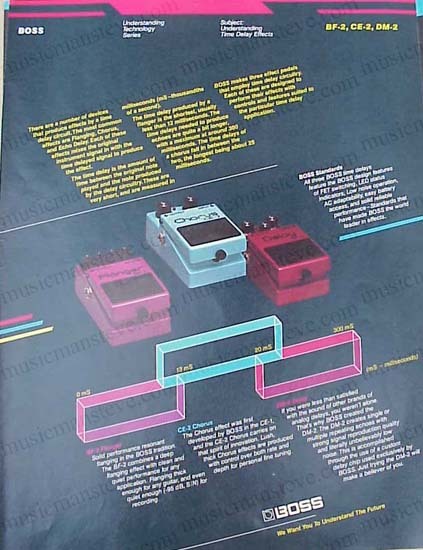 1979 ELECTRO HARMONIX PRINT AD shown in the photo is an original print ad from a 1979 magazine that measures approximately 8 1/2" x 11" and is suitable for framing. 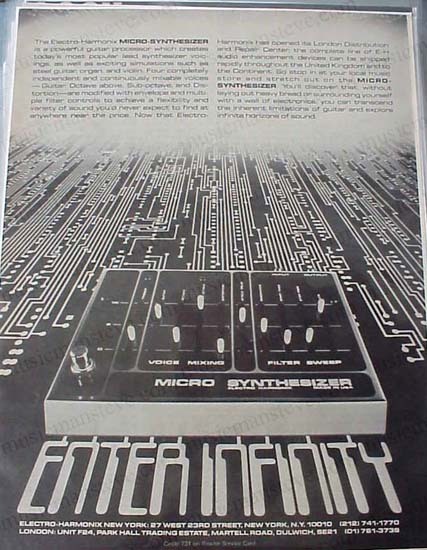 This is a cool early ad for ELECTRO HARMONIX featuring their micro synthesizer with the byline "ENTER INFINITY..."
1997 ELECTRO-HARMONIX PRINT AD shown in the photo is an original print ad excerpted from a 1997 magazine that measures approximately 8" x 11" ..Deluxe Memory Man with Chorus/Vibrato..
1979 ELECTRO-VOICE PRINT AD shown in the photo is an original black and white print ad from a 1979 magazine that measures approximately 8 1/2" x 11" and is suitable for framing. 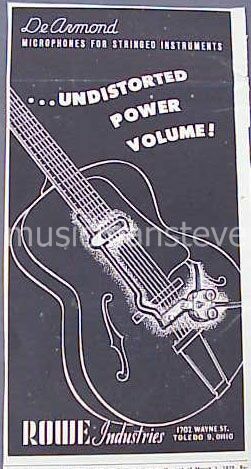 This is a cool early ad for ELECTRO-VOICE showing their speakers with the byline "Electro-Voice stage systems put you in control..."
1955 EMENEE MUSICAL TOYS AD. 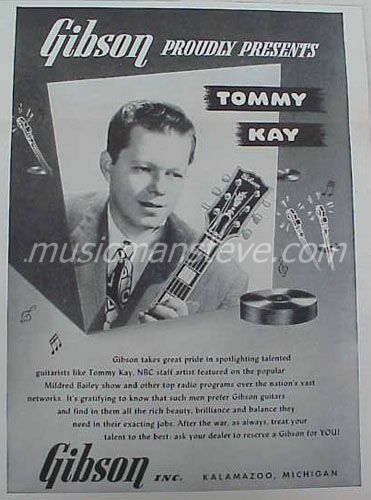 This is an original print ad from a 1955 magazine that measures approximately 8 1/2" x 11 1/2" and is suitable for framing. 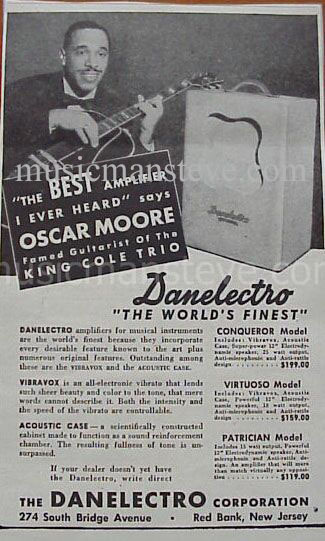 This is a cool early ad showing many of the cool vintage Emenee musical items. 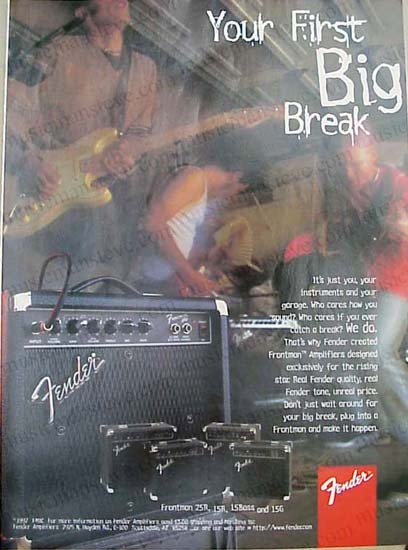 1997 FENDER AMP PRINT AD shown in the photo is an original print ad excerpted from a 1997 magazine that measures approximately 8" x 11" .."Your First BIG break..." Fender's Frontman Amps. 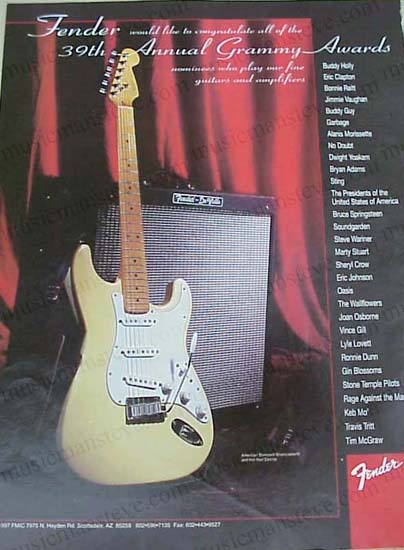 1997 FENDER AMPS PRINT AD shown in the photo is an original print ad excerpted from a 1997 magazine that measures approximately 8" x 11" .."They're REAL!..." 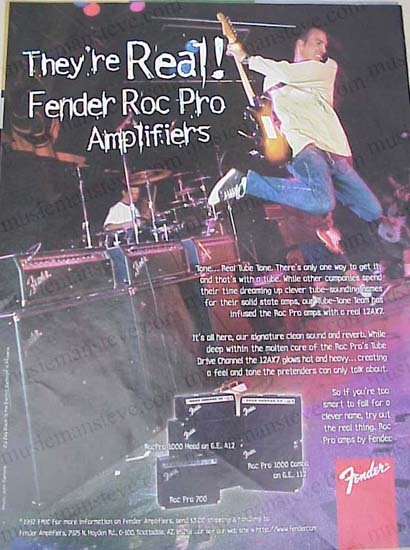 Fender Roc Pro Amps. 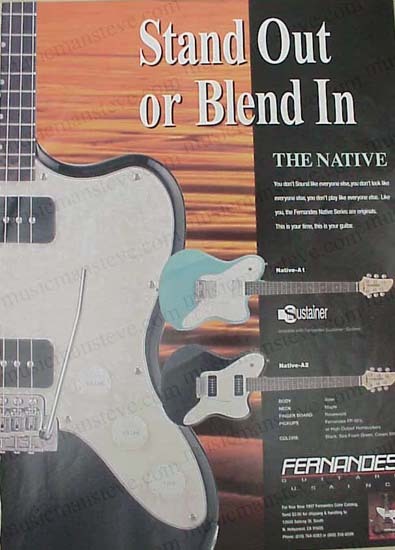 1997 FERNANDES GUITARS PRINT AD shown in the photo is an original print ad excerpted from a 1997 magazine that measures approximately 8" x 11" .."Stand Out or Blend In" The Native Series solid body guitars. 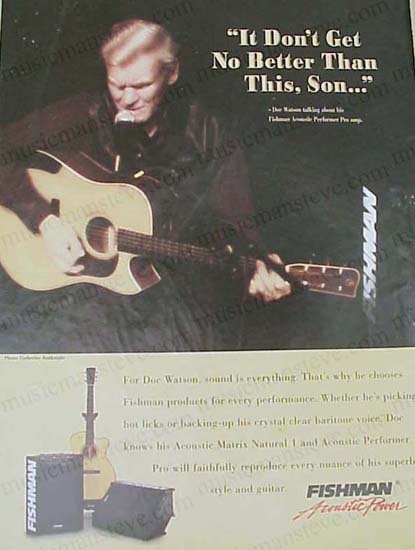 1997 FISHMAN PRO AMP PRINT AD shown in the photo is an original print ad excerpted from a 1997 magazine that measures approximately 8" x 11" ..late great Doc Watson "It Don't Get No Better Than This, Son"
1978 FRAP ACOUSTIC PICKUP PRINT AD shown in the photo. 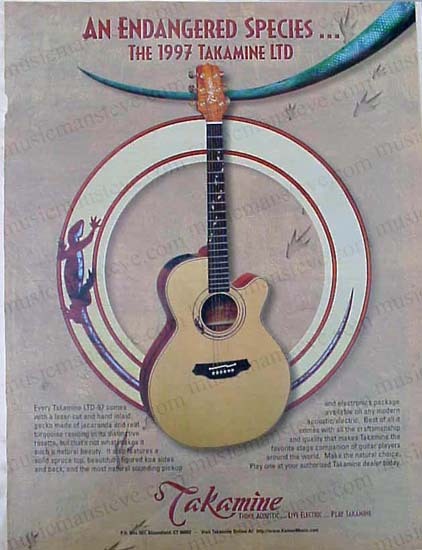 This is an original print ad from a 1978 magazine that measures approximately 8" x 10 3/4" and is suitable for framing. 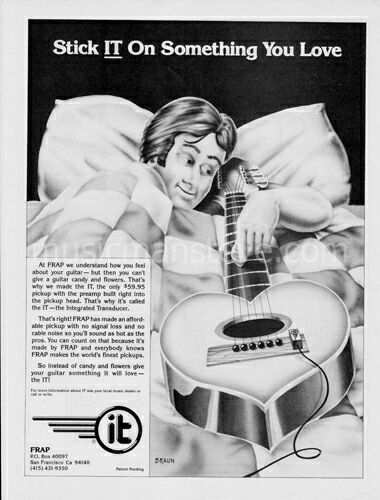 This is a cool early ad for Frap's stick on piezo pickup...with a guy in bed with his heart-shaped guitar... the ad line "Stick IT on Something You Love"
1975 FOXX FOOT PHASER PRINT AD shown is an original cool print ad from a 1975 trade magazine that measures approximately 7 1/2" x 5 1/2" and is suitable for framing.. 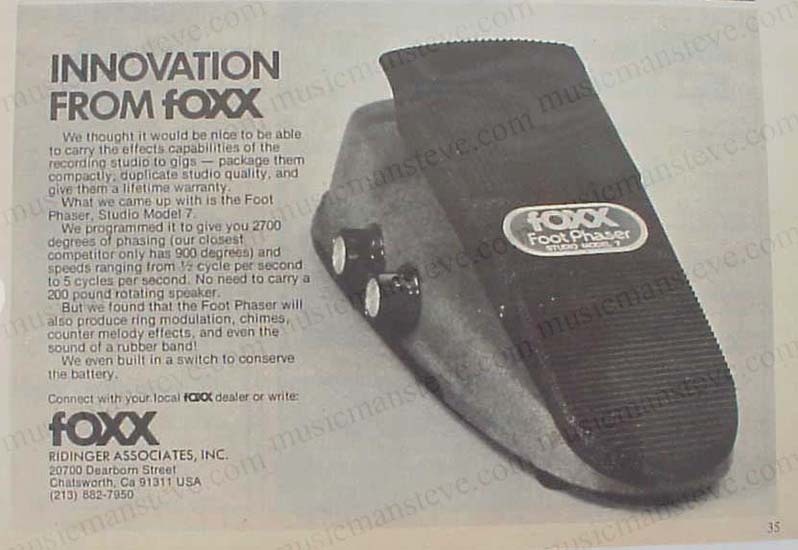 This is a cool early ad for FOXX showing the Foot Phaser...byline is "Innovation From Foxx.."
1977 FOXX ELECTRONICS FOOT PEDALS AD shown in the photo is an original print ad from a 1977 magazine that measures approximately 3" x 10 1/2" and is suitable for framing. 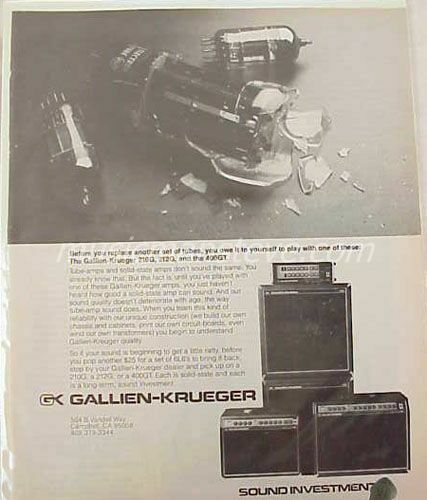 Shows Foxx Down, Foxx Foot Phaser and Foxx Wa & Volume pedals.."GET FOXXED" byline..
1970s GALLIEN-KRUEGER AMP PRINT AD shown is an original black and white print ad from a 1970s trade magazine that measures approximately 8" x 11" and is suitable for framing. 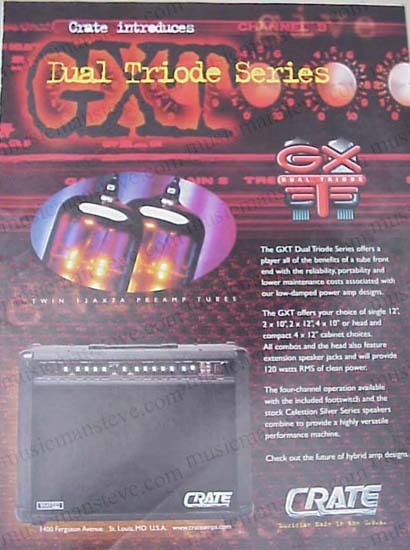 This is a cool early ad featuring the 210G, 212G and 400GT amplifiers... the byline is "Sound Investments"
1997 GHS STRINGS PRINT AD shown in the photo is an original print ad excerpted from a 1997 magazine that measures approximately 8" x 11" .."His Favorite Guitar was made in 1954..." ERIC JOHNSON with vintage Fender Stratocaster. 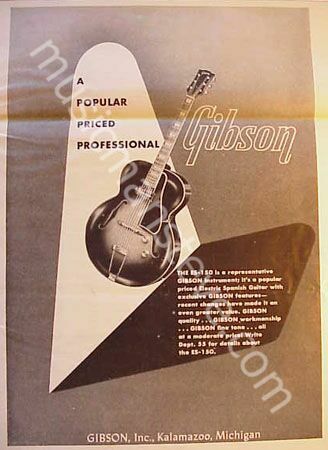 1945 GIBSON GUITAR PRINT AD shown is an original black and white print ad from a 1945 trade magazine that measures approximately 81/2" x 11" and is suitable for framing. 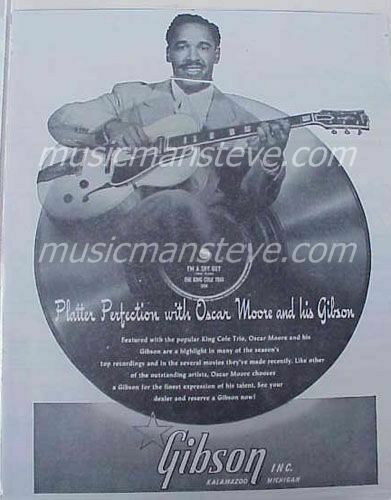 This is a cool early ad for GIBSON featuring endorser OSCAR MOORE then with King Cole Trio...playing his ES-250...byline is "Platter Perfection with Oscar Moore and his Gibson..." minor crease evident from fold in source trade paper and what appears to be a print imperfection in the form of a white line in Oscar's neck area..
1945 GIBSON GUITAR PRINT AD shown is an original black and white print ad from a 1945 trade magazine that measures approximately 8 1/2" x 11" and is suitable for framing. 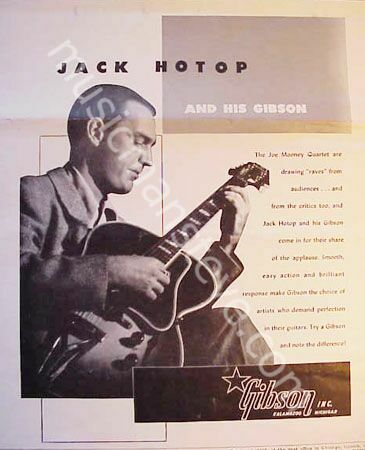 This is a cool early ad for GIBSON featuring endorser LES PAUL (then NBC radio artist)...playing his ES-250...byline is "Gibson Spotlights...Les Paul.." minor crease evident from fold in source trade paper..
1946 GIBSON GUITAR PRINT AD shown is an original black and white print ad from a 1946 trade magazine that measures approximately 7 1/2" x 10 1/2" and is suitable for framing. 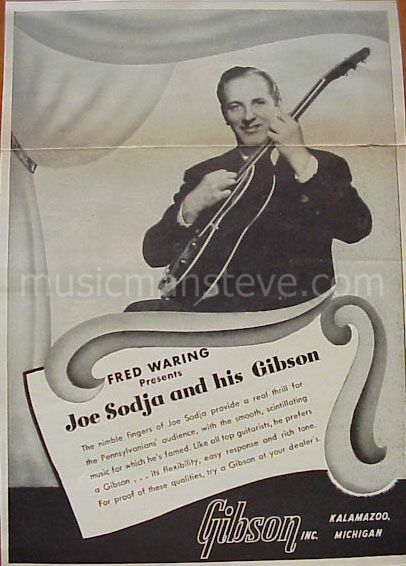 This is a cool early ad for GIBSON featuring endorser JOE SODJA (then with Fred Waring)...playing what appears to be an ES-150... minor crease evident from fold in source trade paper..
1947 GIBSON GUITAR PRINT AD shown is an original black and white print ad from a 1947 trade magazine that measures approximately 8" x 10" and is suitable for framing. 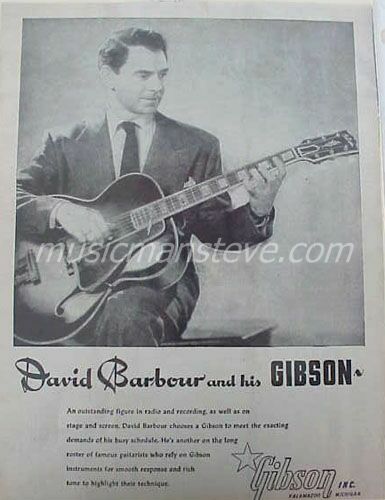 This is a cool early ad for GIBSON featuring endorser DAVID BARBOUR (radio and recording artist)...playing his Gibson (L-5 I think)...byline is "David Barbour and his Gibson.." ..
1947 GIBSON GUITAR PRINT AD shown is an original black and white print ad from a 1947 trade magazine that measures approximately 8" x 10" and is suitable for framing. 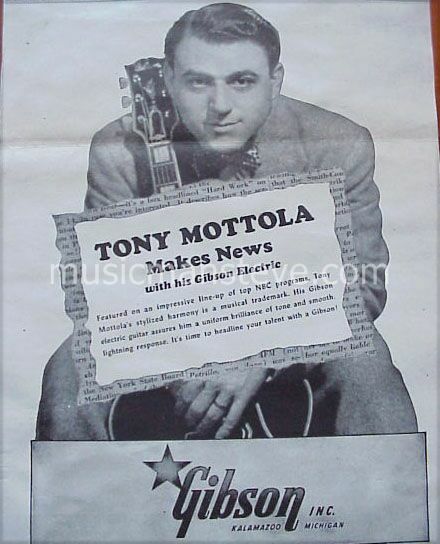 This is a cool early ad for GIBSON featuring endorser TONY MOTTOLA (radio and recording artist)...holding his Gibson (es-250 I think)...byline is "TONY MOTTOLA Makes News with his Gibson Electric.." minor crease evident from fold in source trade paper..
1947 GIBSON GUITAR PRINT AD shown in the photo is an original print ad from a 1947 magazine that measures approximately 8 1/2" x 11" and is suitable for framing. 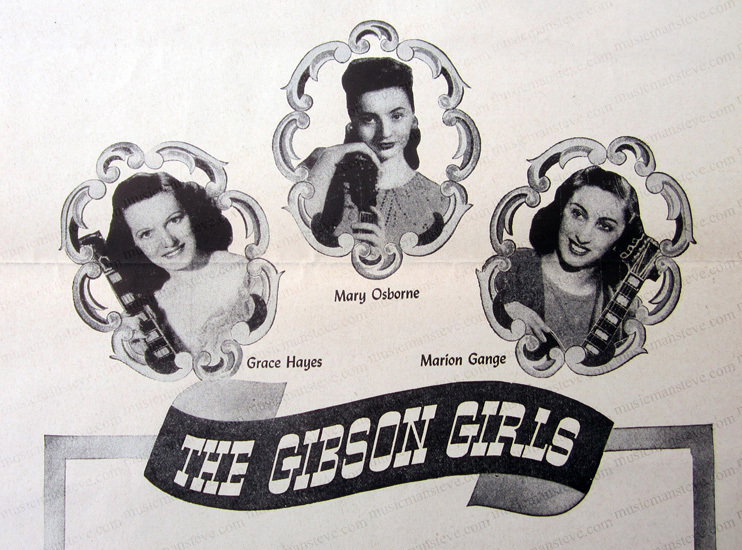 This is a cool early ad for GIBSON showing GRACE HAYES, MARY OSBORNE & MARION GANGE with their Gibsons... byline is "The Gibson Girls"
1947 GIBSON GUITAR PRINT AD shown is an original black and white (faded) print ad from a 1947 trade magazine that measures approximately 7" x 9" and is suitable for framing. 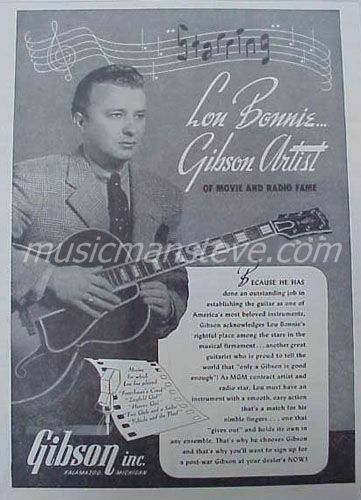 This is a cool early ad for GIBSON featuring endorser ROY SMECK ...playing his Gibson Ultratone Lap Steel...byline is "Roy Smeck Records with the Ultratone.." ..
1948 GIBSON GUITAR PRINT AD shown is an original black and white print ad from a 1948 trade magazine that measures approximately 8" x 10" and is suitable for framing. 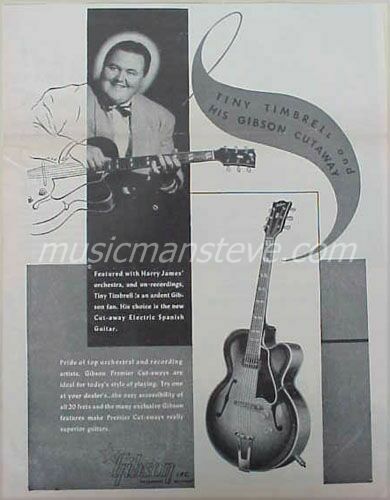 This is a cool early ad for GIBSON featuring endorser TINY TIMBRELL (then with Harry James Orchestra..)...playing his Gibson Cutaway (ES-350 possibly..)...byline is "Tiny Timbrell and his Gibson Cutaway.." ..
1950 GIBSON CF-100 GUITAR PRINT AD shown is an original black and white print ad from a 1950 trade magazine that measures approximately 7 1/2" x 10 1/2" and is suitable for framing. 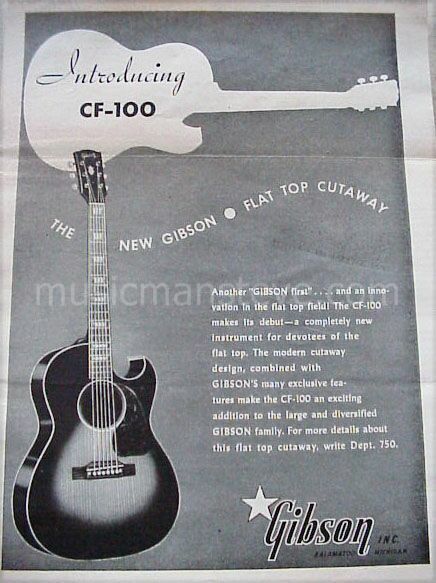 This is a cool early ad for GIBSON introducing the New Gibson Flat Top Cutaway model...byline is "Introducing CF-100" minor crease evident from fold in source trade paper..
1951 GIBSON GUITAR PRINT AD shown is an original black and white print ad from a 1951 trade magazine that measures approximately 8" x 10 1/2" and is suitable for framing. 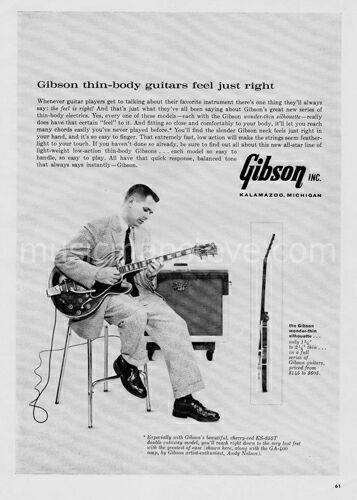 This is a cool early ad for GIBSON introducing the new ES-175 model...byline is "Gibson designed for perfect performance..."
1959 GIBSON GUITAR PRINT AD featuring Andy Nelson with his Gibson ES-355t through a GA-400 tube amp. 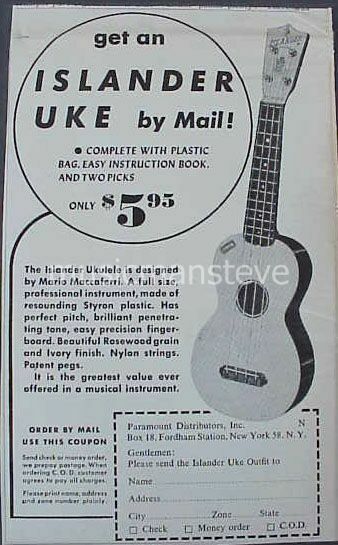 This is an original print ad from a 1959 magazine that measures approximately 8 1/2" x 10 1/2" and is suitable for framing. 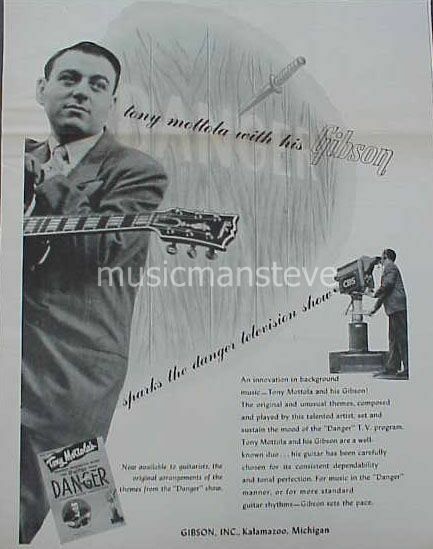 This is a cool early ad showing Gibson artist-enthusiast Andy Nelson in 1959 holding a Gibson ES-355t guitar. 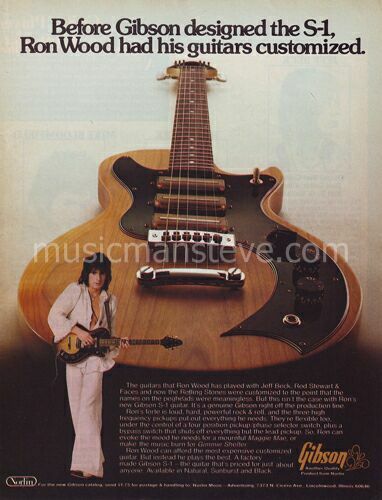 The ad line is "Gibson thin-body guitars feel just right"..
1976 GIBSON S-1 solid body guitar PRINT AD featuring RON WOOD shown in the photo. 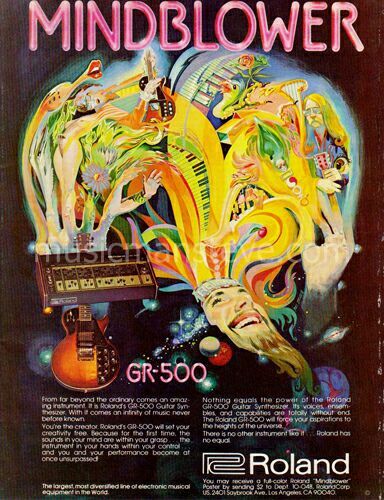 This is an original print ad from a 1976 magazine that measures approximately 8 1/4" x 10 3/4" and is suitable for framing. 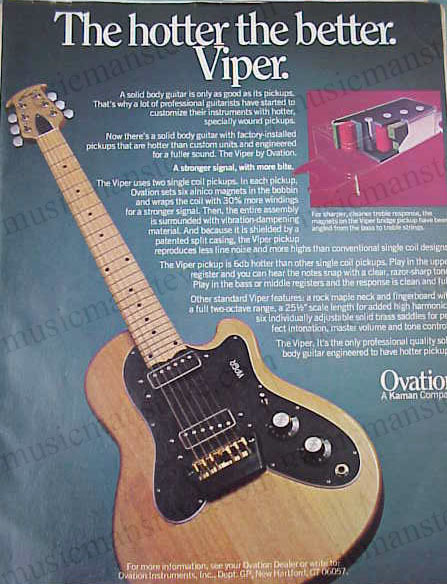 Shows the Gibson solid body S-1 electric guitar being played by Ron Wood back in the day. 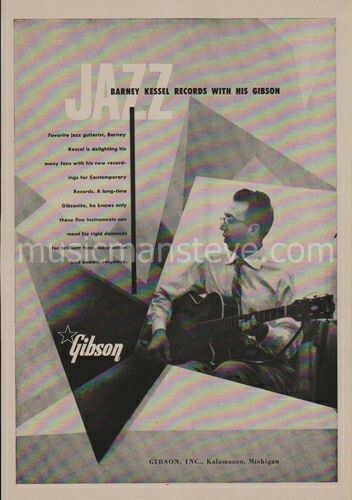 1955 GIBSON GUITAR PRINT AD featuring BARNEY KESSEL with his Gibson. 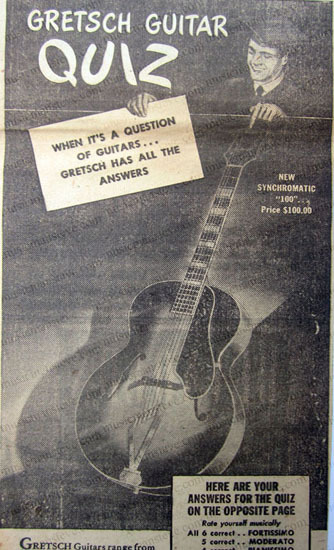 This is an original print ad from a 1955 magazine that measures approximately 7 1/2" x 10 1/2" and is suitable for framing. 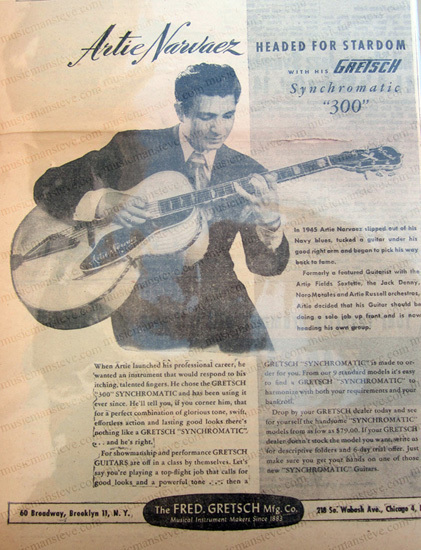 This is a cool early ad showing Gibson endorser Barney Kessel in 1955 holding a Gibson cutaway archtop guitar. 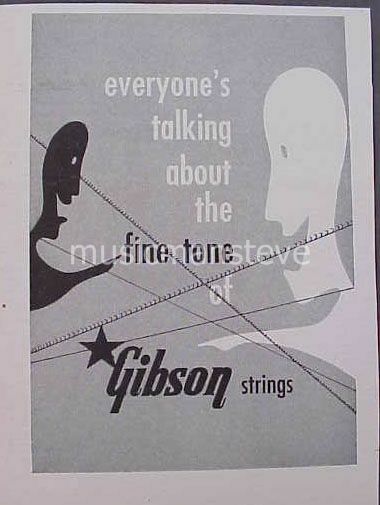 The ad line is "JAZZ- Barney Kessel Records with His Gibson"
1982 GIBSON EQUA BASS STRINGS shown in the photo is an original print ad from a 1982 magazine that measures approximately 8" x 11" and is suitable for framing. 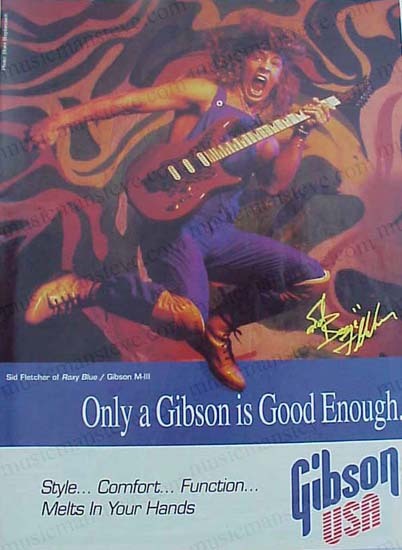 1982 GIBSON VICTORY MV X GUITAR PRINT AD shown in the photo is an original print ad from a 1982 magazine that measures approximately 8" x 11" .."Sounds like..all of 'em" byline. 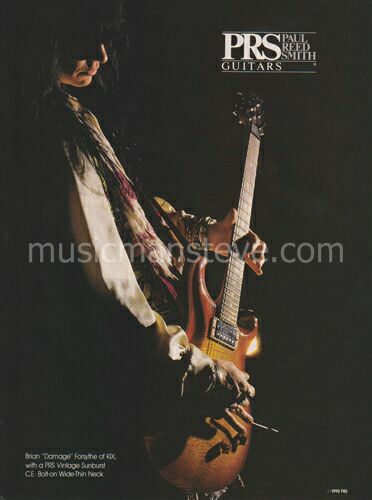 1997 GIBSON GUITAR & ACE FREHLEY PIN-UP shown in the photo is an original print excerpted from a 1997 magazine that measures approximately 8" x 11" ..ACE FREHLEY WITH his signature Les Paul. 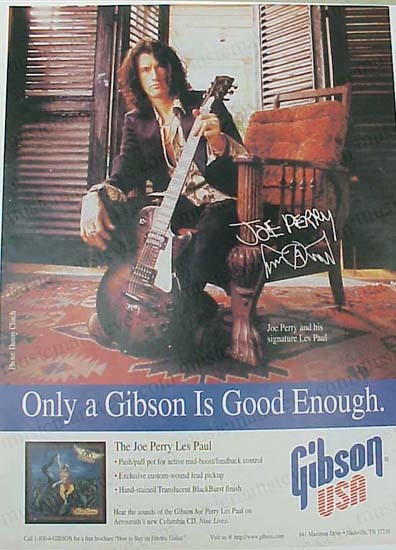 1997 GIBSON GUITAR PRINT AD shown in the photo is an original print ad excerpted from a 1997 magazine that measures approximately 8" x 11" .."Only a Gibson is good enough" with JOE PERRY. 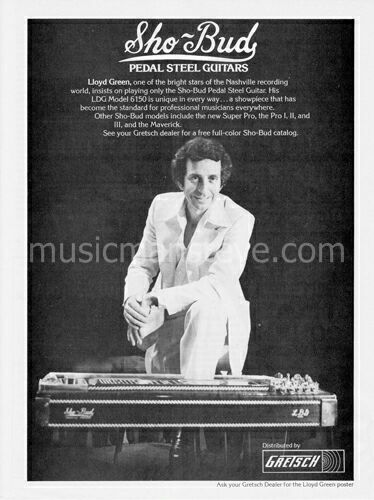 1978 GRETSCH SHO-BUD PEDAL STEEL GUITARS PRINT AD shown in the photo. 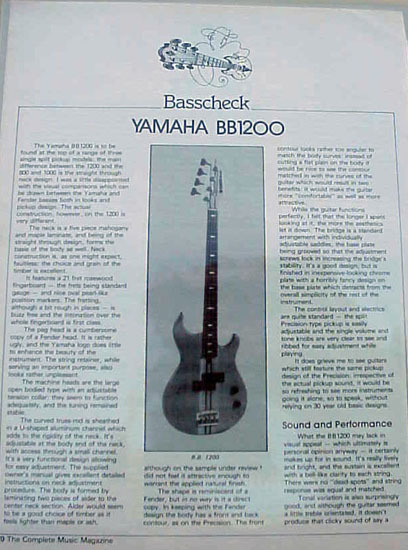 This is an original print ad from a 1978 magazine that measures approximately 8" x 10 3/4" and is suitable for framing. 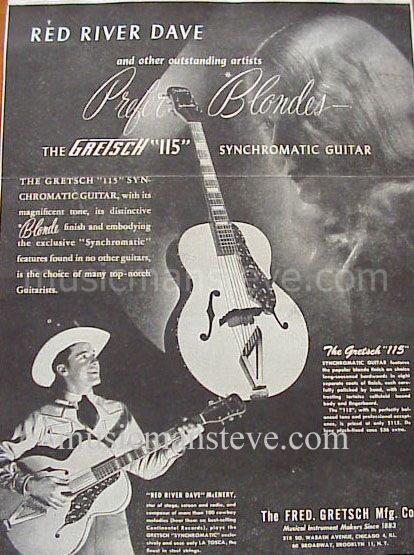 This is a cool early ad for Gretsch Sho-Bud Pedal Steel Guitars featuring LLOYD GREEN. 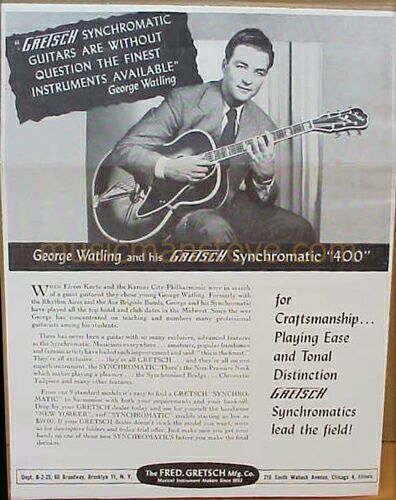 1979 GRETSCH PRINT AD shown in the photo is an original print ad from a 1979 magazine that measures approximately 8 1/2" x 11" and is suitable for framing. 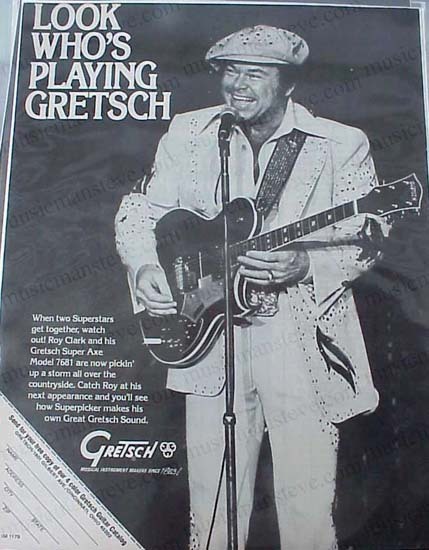 This is a cool early ad for GRETSCH featuring ROY CLARK with a GRETSCH SUPER AXE model 7681 guitar... the byline "LOOK WHO'S PLAYING GRETSCH..."
1978 GRETSCH GUITAR PRINT AD shown in the photo. 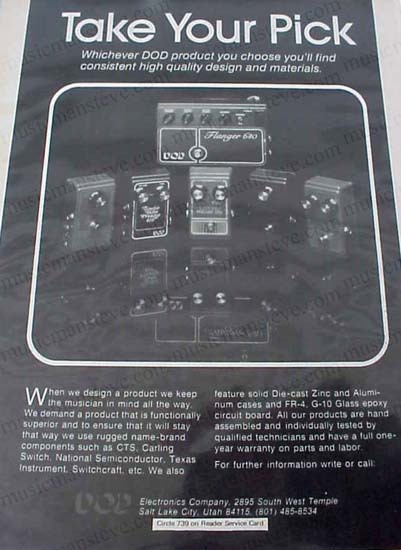 This is an original print ad from a 1978 magazine that measures approximately 8" x 10 3/4" and is suitable for framing. 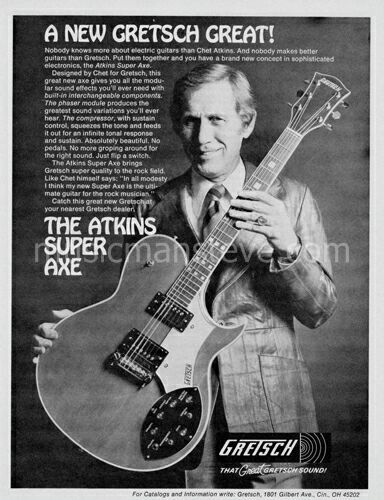 This is a cool early black and white ad showing CHET ATKINS HOLDING THE ATKINS SUPER AXE BY GRETSCH. .
1997 GRETSCH GUITARS PRINT AD shown in the photo is an original print ad excerpted from a 1997 magazine that measures approximately 8" x 11" ..endorser Brian Setzer with Gretsch Signature Model 6120 guitar. 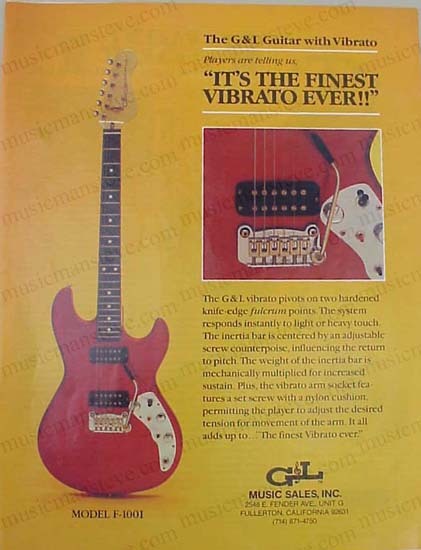 1982 G & L GUITAR PRINT AD shown in the photo is an original print ad from a 1982 magazine that measures approximately 8" x 11" ..Vito San Filippo & L-2000E G&L Bass. 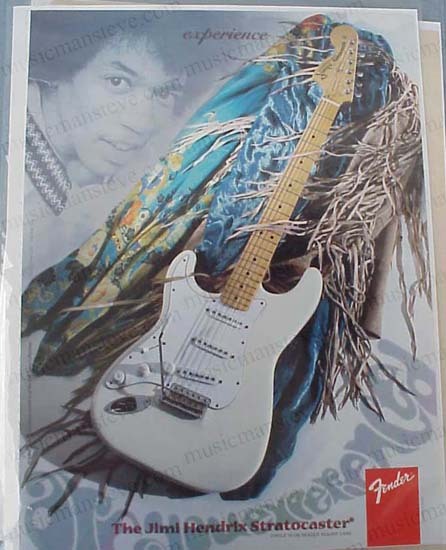 1982 G & L GUITAR PRINT AD shown in the photo is an original print ad from a 1982 magazine that measures approximately 8" x 11" ..features Model F-1001 guitar with vibrato. 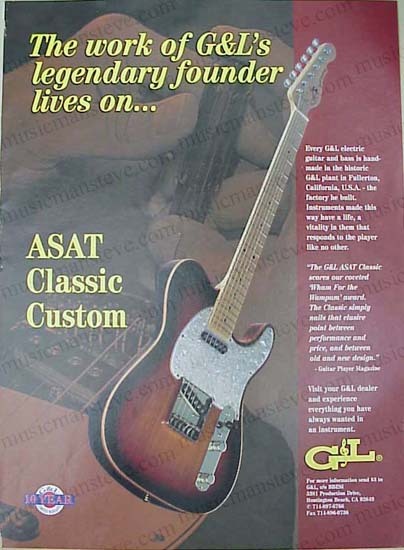 1997 G & L GUITAR PRINT AD shown in the photo is an original print ad excerpted from a 1997 magazine that measures approximately 8" x 11" .."The Work of G&L's legendary founder lives on..." ASAT Classic Custom guitar. 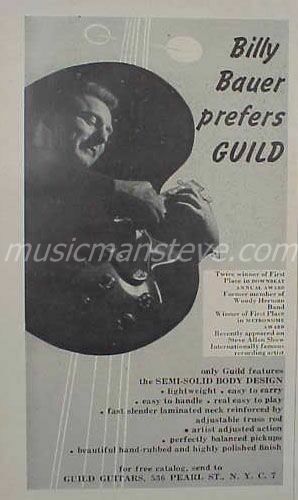 1950s GUILD GUITARS PRINT AD shown in the photo is an original print ad from a 1950s magazine that measures approximately 4 1/2" x 8 1/2" and is suitable for framing. 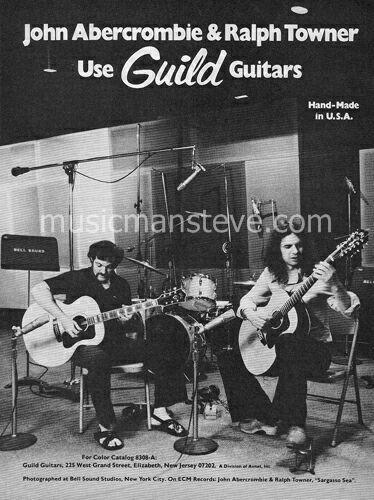 This is a cool early ad for Guild from the Pearl St. New York days with endorser Billy Bauer holding a Guild guitar... byline is "Billy Bauer prefers GUILD"
1975 GUILD COPICAT PRINT AD shown is an original cool print ad from a 1975 trade magazine that measures approximately 7 1/2" x 5 1/2" and is suitable for framing.. 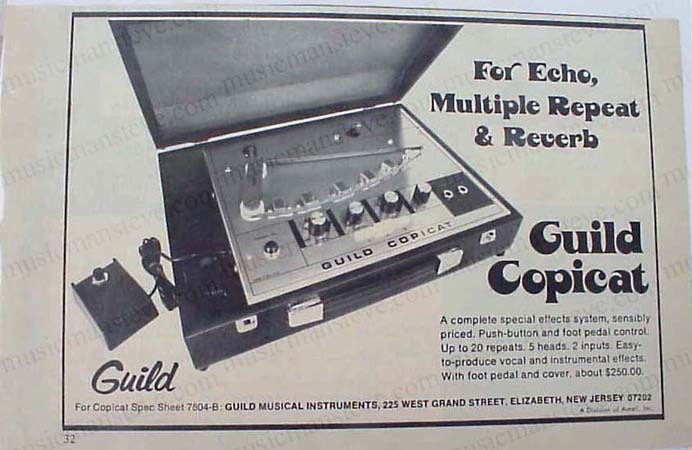 This is a cool early ad showing the classic COPICAT...byline is "For Echo, Multiple Repeat & Reverb.."
1976 GUILD GUITARS PRINT AD with John Abercrombie & Ralph Towner shown in the photo. 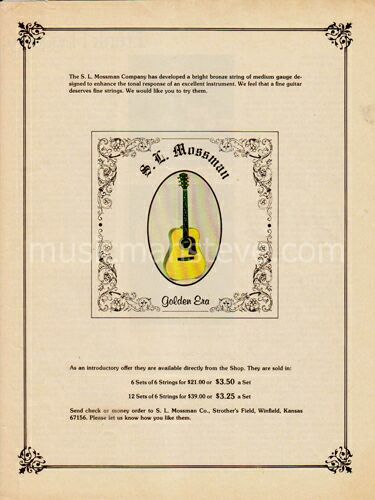 This is an original print ad from a 1976 magazine that measures approximately 8" x 10 1/2" and is suitable for framing. 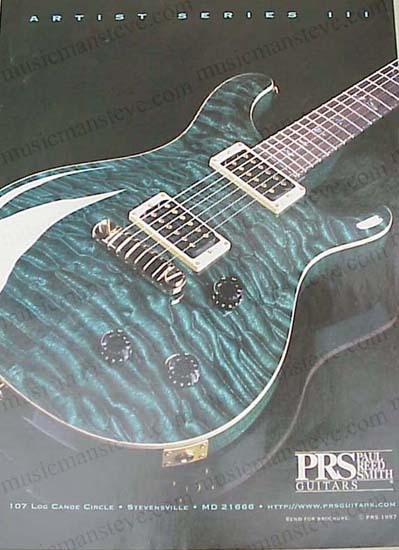 NOT a reproduction. 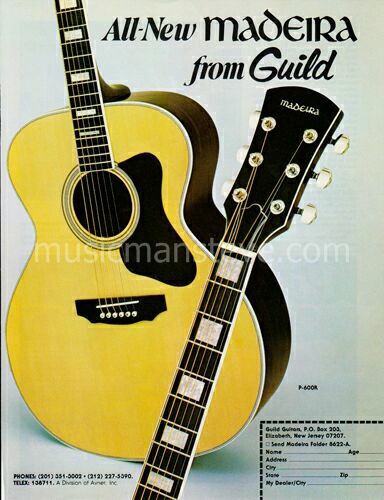 Shows the two guitarists playing one Guild 6 string (looks like an F-50R) and one Guild 12 string (possibly an F-212 or the like)....neat acoustics produced by Guild in the USA at the time. 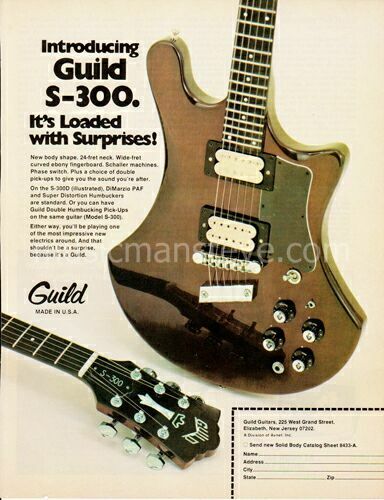 1978 GUILD GUITAR PRINT AD shown in the photo. 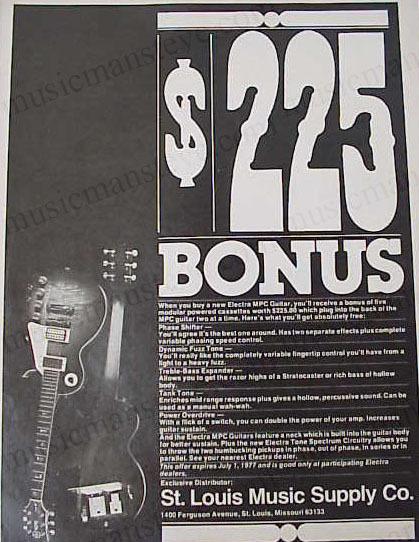 This is an original print ad from a 1978 magazine that measures approximately 8" x 10 3/4" and is suitable for framing. 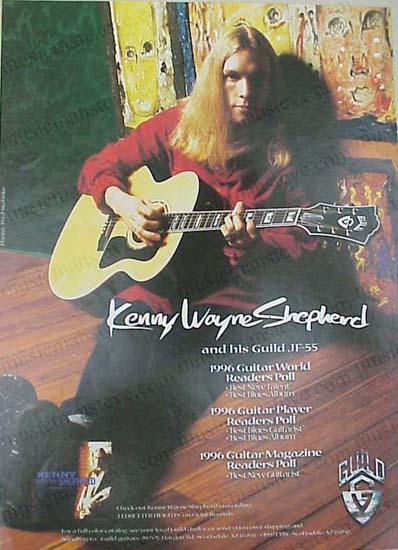 This is a cool early ad introducing the Guild S-300 model solid body electric guitar..
1997 GUILD GUITARS PRINT AD shown in the photo is an original print ad excerpted from a 1997 magazine that measures approximately 8" x 11" ..endorser KENNY WAYNE SHEPHERD with his Guild JF-55 guitar. 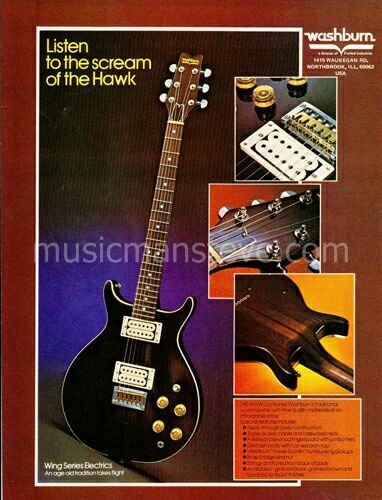 1978 HAMER GUITARS PRINT AD shown in the photo. 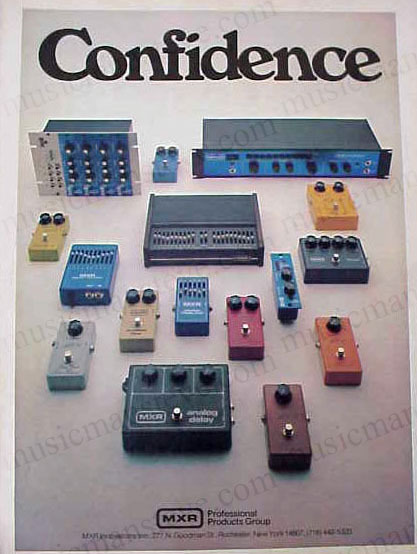 This is an original print ad from a 1978 magazine that measures approximately 8" x 10 3/4" and is suitable for framing. 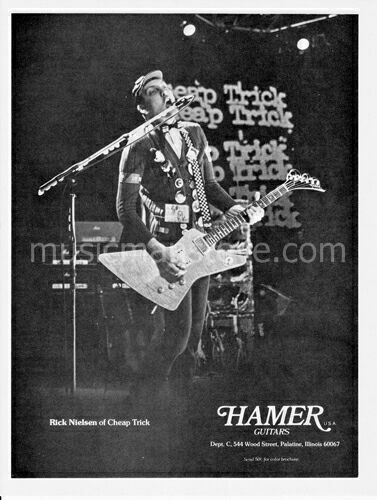 This is a cool early ad for Hamer Guitars featuring Rick Nielsen of Cheap Trick. 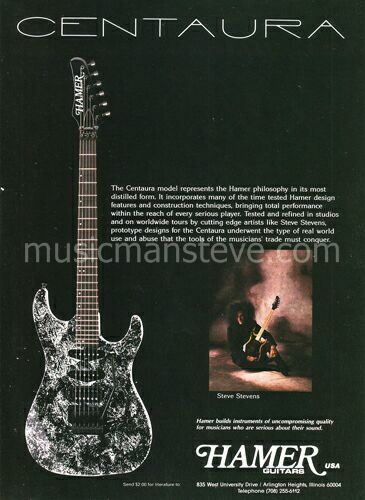 1990 HAMER CENTAURA GUITAR PRINT AD with STEVE STEVENS shown in the photo. 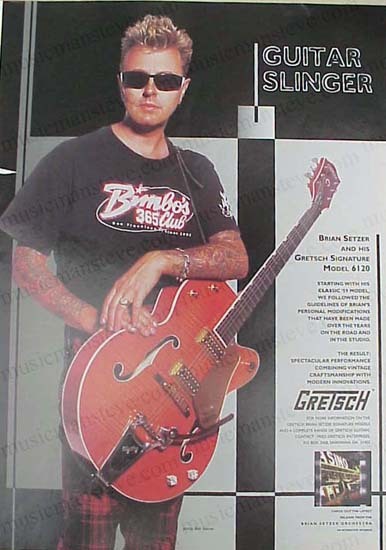 This is an original print ad from a 1990 magazine that measures approximately 8" x 10 3/4" and is suitable for framing. 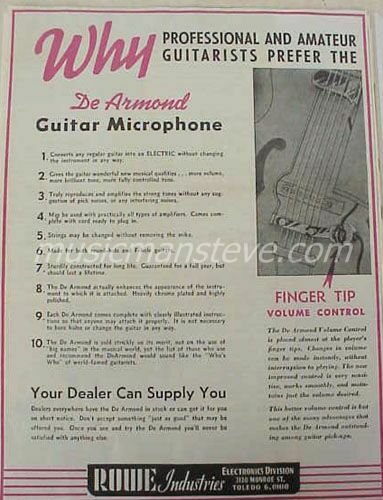 This is a cool early ad showing the Centaura along with a small insert of Steve Stevens holding a Hamer guitar. 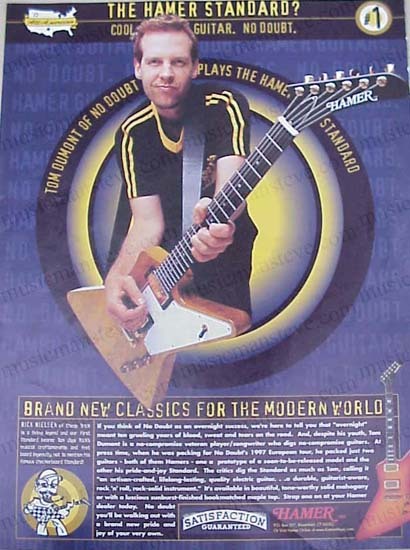 1997 HAMER GUITARS PRINT AD shown in the photo is an original print ad excerpted from a 1997 magazine that measures approximately 8" x 11" ..features TOM DUMONT of NO DOUBT playing Hamer Standard..
1950 HISE MANUFACTURING CO PRINT AD shown in the photo is an original small format print ad from a 1950 magazine that measures only 2" x 6" and is suitable for framing. 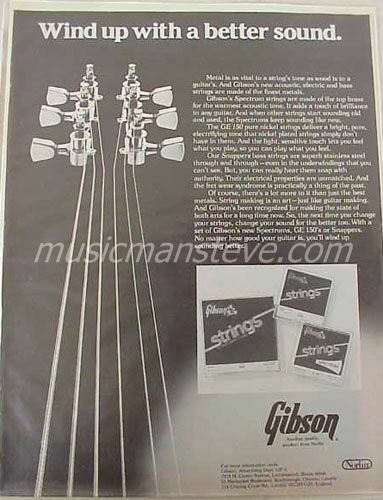 This is a cool early ad shows and describes their New Simplicity Triple Tuning Changer for the Steel Guitar...byline is "Attention: Steel Guitarists"
1979 HIWATT PRINT AD shown in the photo is an original print ad from a 1979 magazine that measures approximately 8 1/2" x 11" and is suitable for framing. 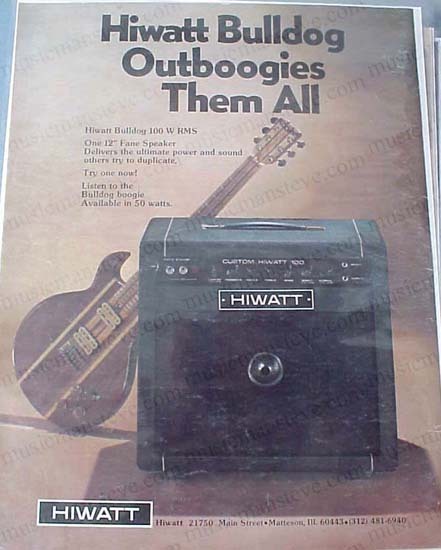 This is a cool early ad for HIWATT showing their Bulldog 100 amp (and a Curlee guitar) with the byline "Bulldog Outboogies Them All..."
1977 HOHNER AMPLIFIERS AD shown in the photo. 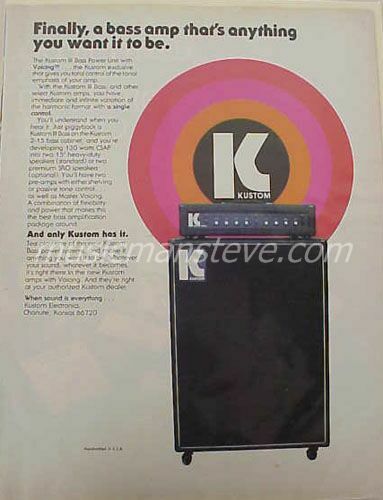 This is an original print ad from a 1977 magazine that measures approximately 8" x 10 1/2" and is suitable for framing. 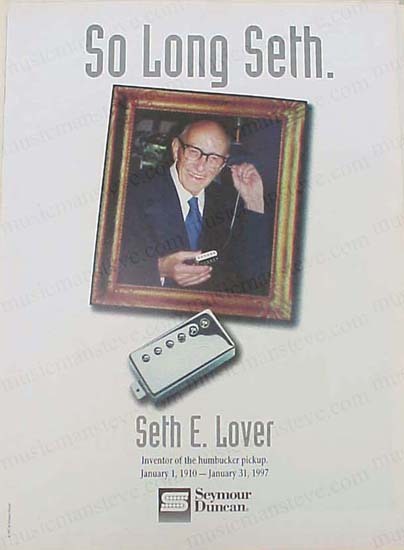 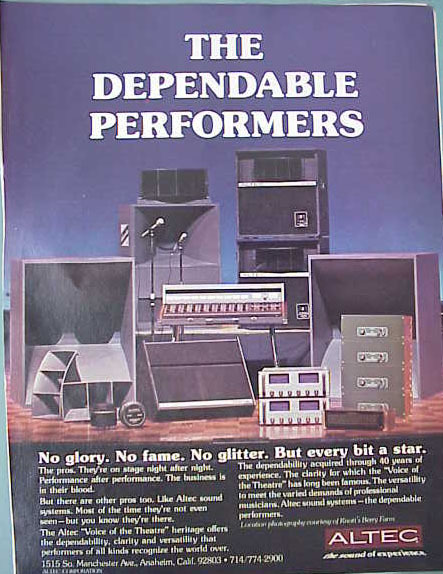 Shows the many amplifiers offered by Hohner at this time..byline is "Hohner. 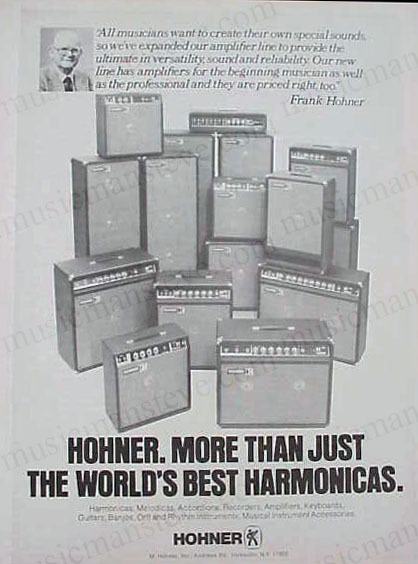 More Than Just The World's Best Harmonicas"..... ..
1976 HOHNER Guitar PRINT AD.. shown in the photo. 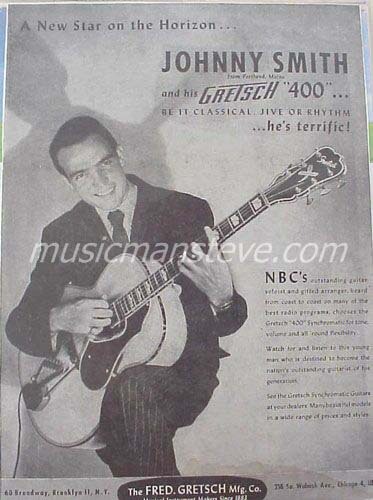 This is an original print ad from an old magazine that measures approximately 8" x 10 1/2" and is suitable for framing. 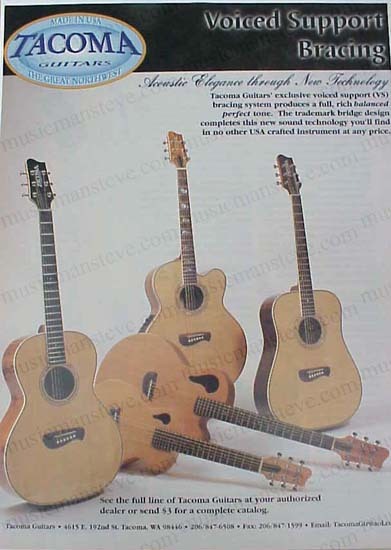 Shows the Hohner Limited Edition Acoustic Guitars . 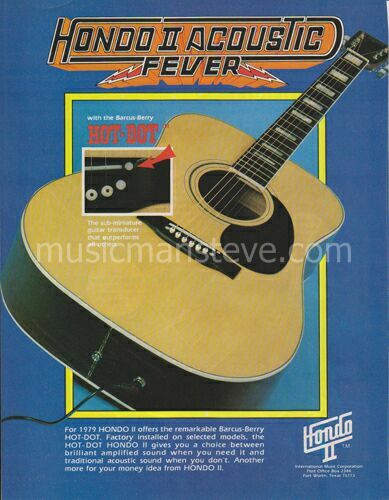 1982 HONDO GUITARS PRINT AD shown in the photo is an original print ad from a 1982 magazine that measures approximately 8" x 11" ..shows NOMAD 3X and THE CHIQUITA. 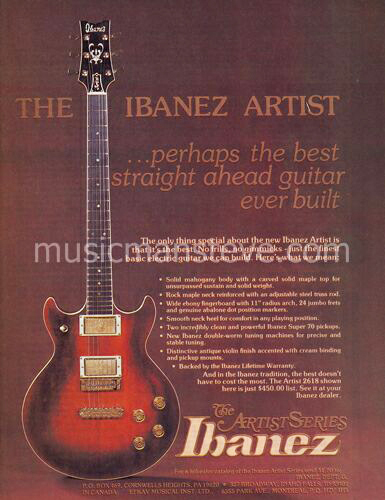 1976 IBANEZ ARTIST PRINT AD shown in the photo. 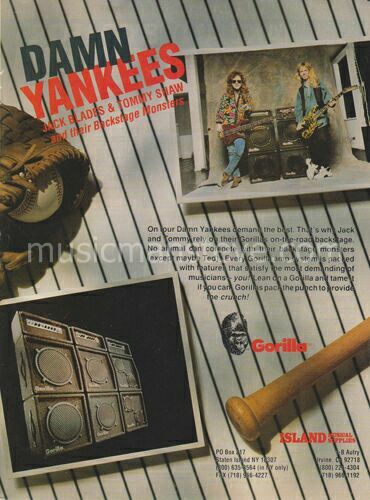 This is an original print ad from a 1976 magazine that measures approximately 8 1/4" x 10 3/4" and is suitable for framing. 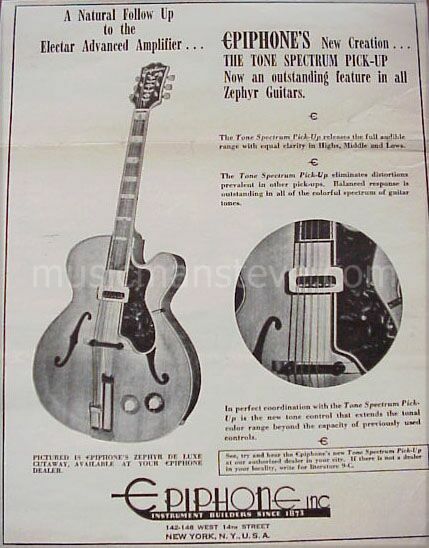 This is a cool early ad showing the double cutaway solid body Ibanez Artist electric guitar back in the day. 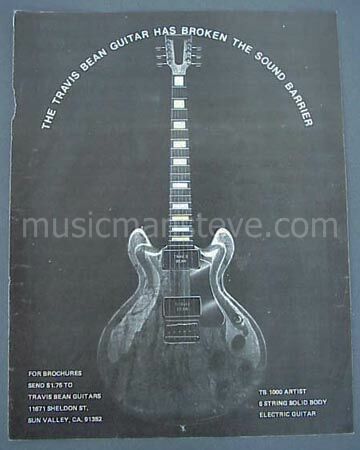 1979 IBANEZ GUITAR PRINT AD shown in the photo is an original print ad from a 1979 magazine that measures approximately 8 1/2" x 11" and is suitable for framing. 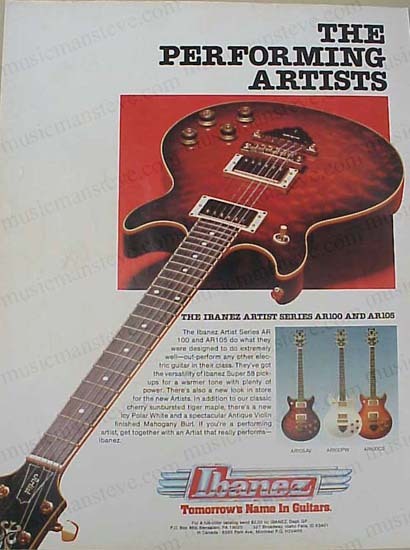 This is a cool early 2-PAGE ad for IBANEZ GUITAR featuring both electric and acoustic guitars...the byline "Treat Your Hands and Ears to an Ibanez.."
1982 IBANEZ ARTIST SERIES GUITARS PRINT AD shown in the photo is an original print ad from a 1982 magazine that measures approximately 8" x 11" ..AR105AV, AR100PW, AR100CS solid bodies shown. 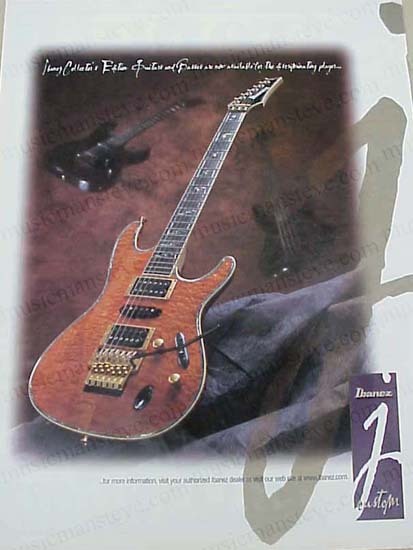 1990 IBANEZ GUITAR PRINT AD shown in the photo. 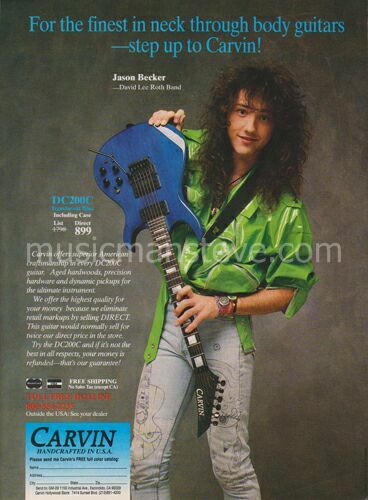 This is an original print ad from a 1990 magazine that measures approximately 8" x 10 3/4" and is suitable for framing. 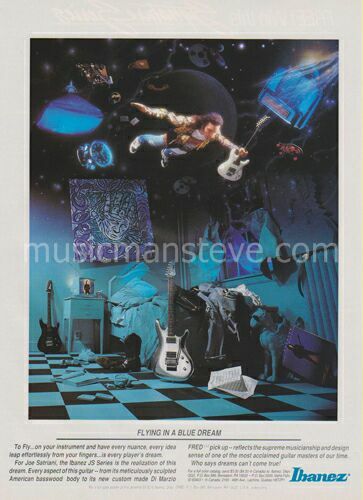 This is a cool early ad showing Joe Satriani flying in a blue dream.... promoting Ibanez JS signature series. 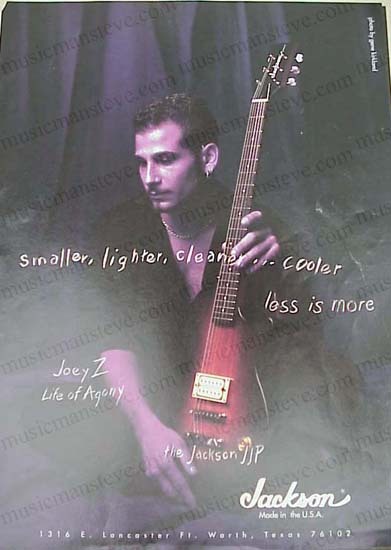 1997 JACKSON GUITARS PRINT AD shown in the photo is an original print ad excerpted from a 1997 magazine that measures approximately 8" x 11" .."smaller, lighter, cleaner...cooler..less is more" JOEY Z (Life Of Agony) with Jackson guitar. 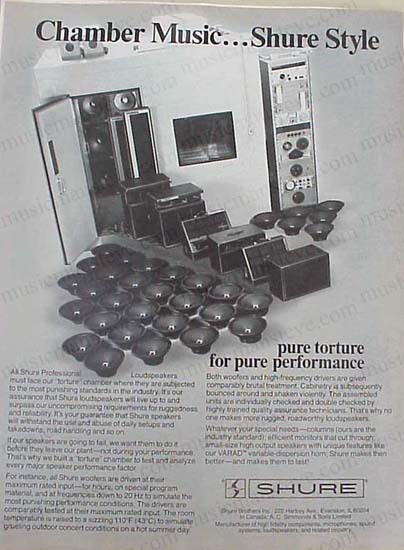 1978 JBL PRINT AD shown in the photo. 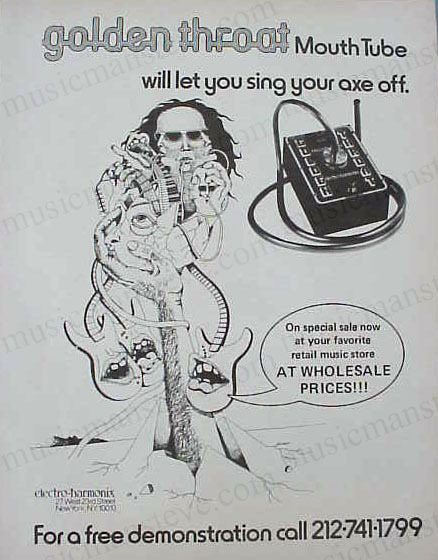 This is an original print ad from a 1978 magazine that measures approximately 8" x 10 3/4" and is suitable for framing. 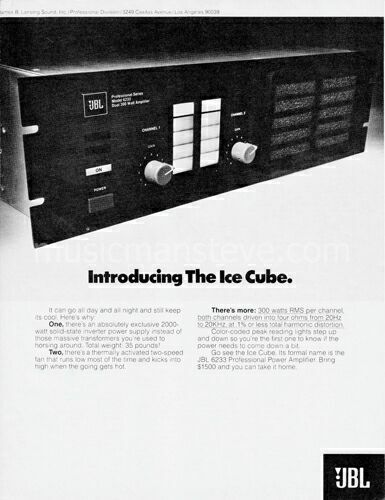 This is a cool early ad for JBL with ad-line "INTRODUCING THE CUBE"..... .
1978 JBL K SERIES PRINT AD shown in the photo. 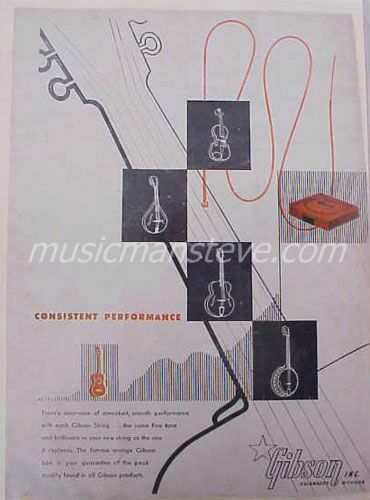 This is an original print ad from a 1978 magazine that measures approximately 8" x 10 3/4" and is suitable for framing. 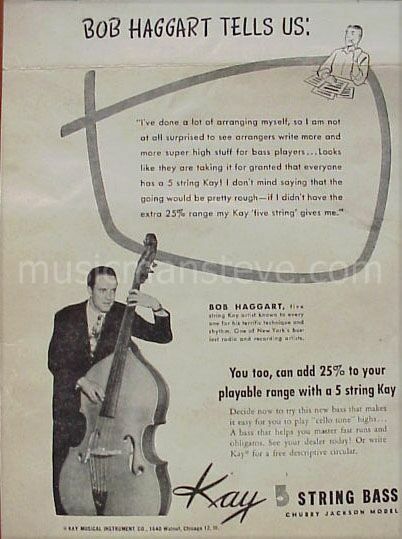 This is a cool early ad for JBL with one of the coolest bass players you're ever gonna see. 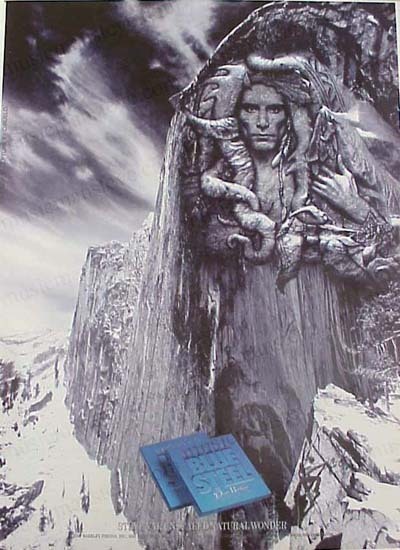 1982 KORG PRINT AD shown in the photo. 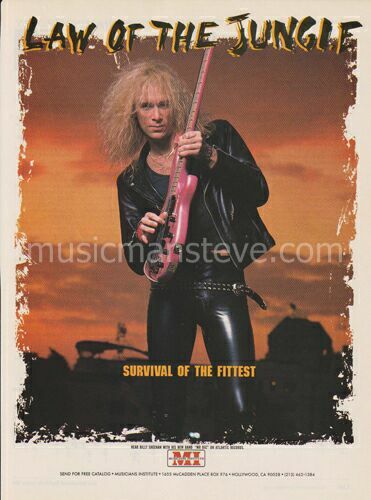 This is an original print ad from a 1982 magazine that measures approximately 8" x 11" and is suitable for framing. 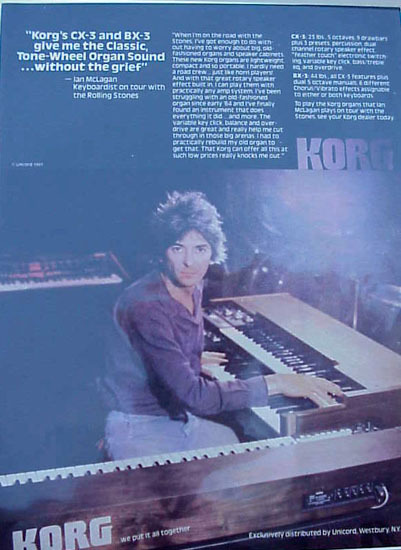 This is a cool vintage ad for KORG featuring Ian McLagan (on tour with the Rolling Stones). 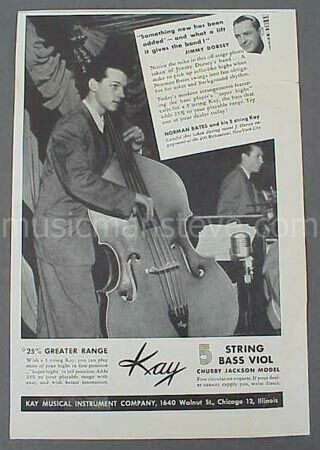 1947 KAY 5 STRING BASS PRINT AD shown in the photo is an original print ad from a 1947 magazine that measures approximately 6 1/2" x 9 1/2" and is suitable for framing. 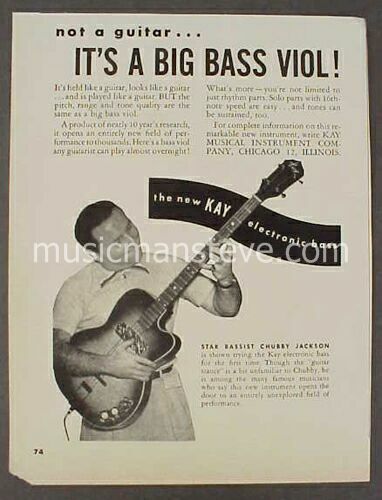 This is a cool early ad for KAY MUSICAL INSTRUMENT COMPANY showing Ray Anthony's star bass player STANLEY SLEJKO with his Kay Bass...byline is "5 String Kay Bass Viol adds 25% to your playable range"
1990 KRAMER GUITAR PRINT AD shown in the photo. 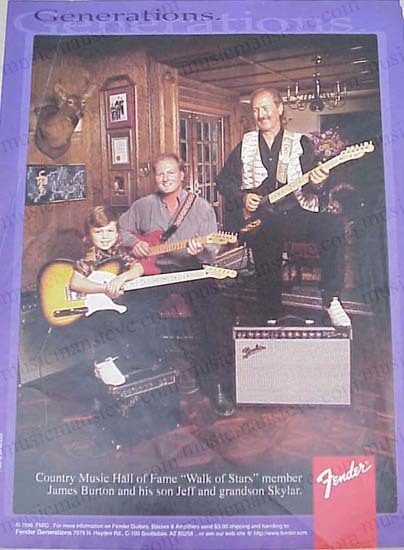 This is an original print ad from a 1990 magazine that measures approximately 8" x 10 1/2" and is suitable for framing. 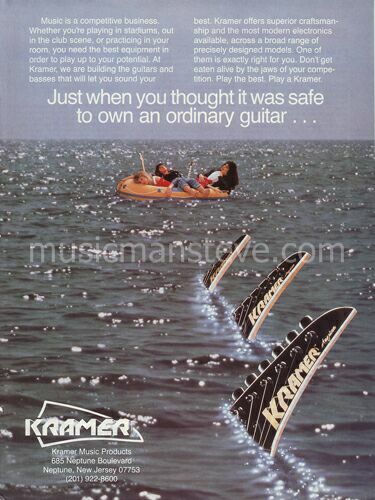 This is a cool early ad showing two guys and a girl in an inflatable boat with a few Kramer pegheads approaching like sharks in the water. 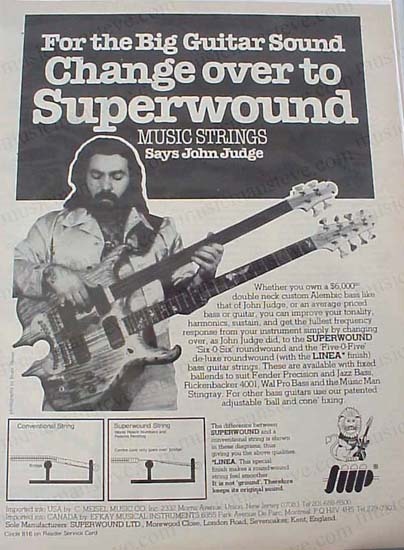 The ad line is "Just When You Thought it was safe to own an ordinary guitar"..
1976 KRAMER NECK guitar PRINT AD shown in the photo. 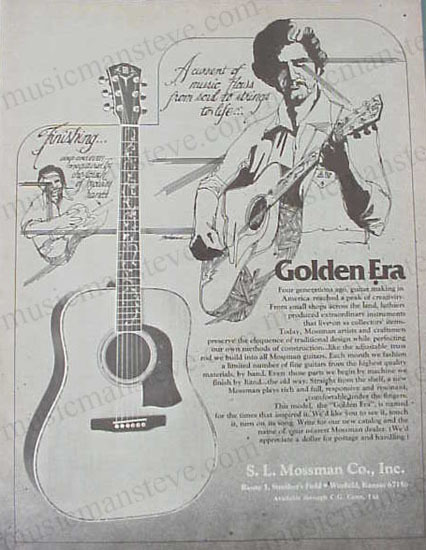 This is an original print ad from a 1976 magazine that measures approximately 8" x 10 1/2" and is suitable for framing. 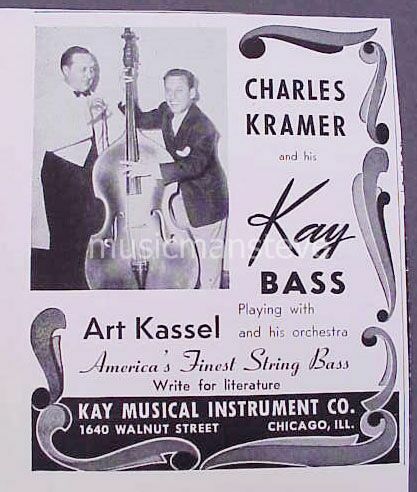 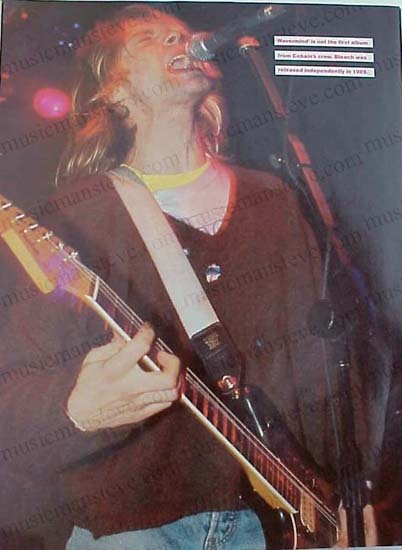 Shows the Kramer Aluminum and Wood neck design offered back in the day. 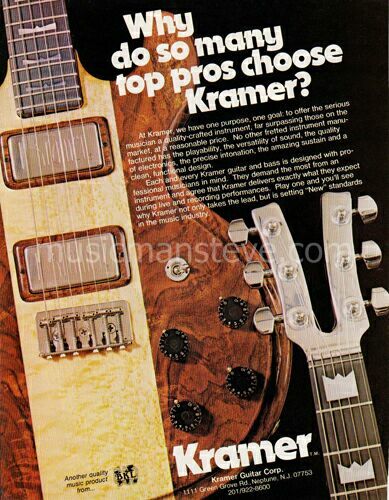 "KRAMER STICKS ITS NECK OUT"..
1978 KRAMER GUITARS PRINT AD shown in the photo. 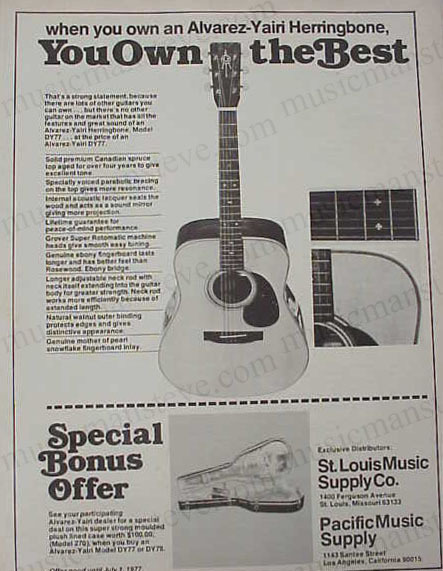 This is an original print ad from a 1978 magazine that measures approximately 8" x 10 3/4" and is suitable for framing. 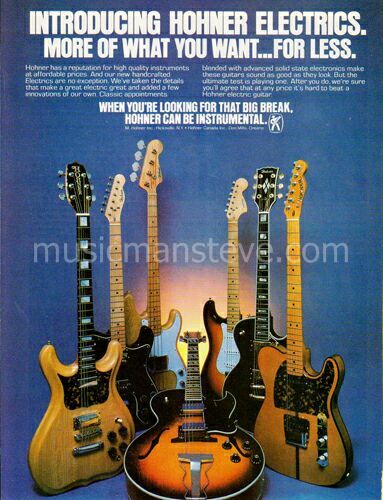 This is a cool early ad for Kramer Guitars featuring color shots of guitar body and aluminum neck. 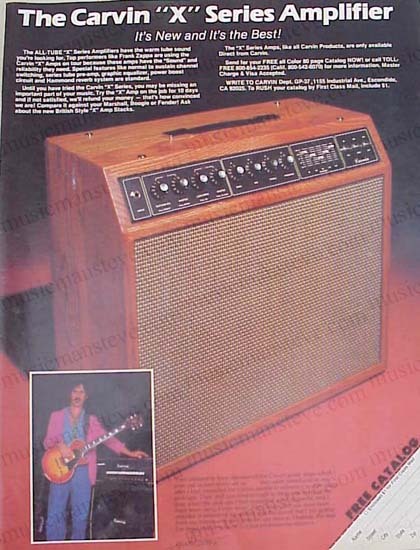 1978 KUSTOM AMPS PRINT AD shown in the photo. 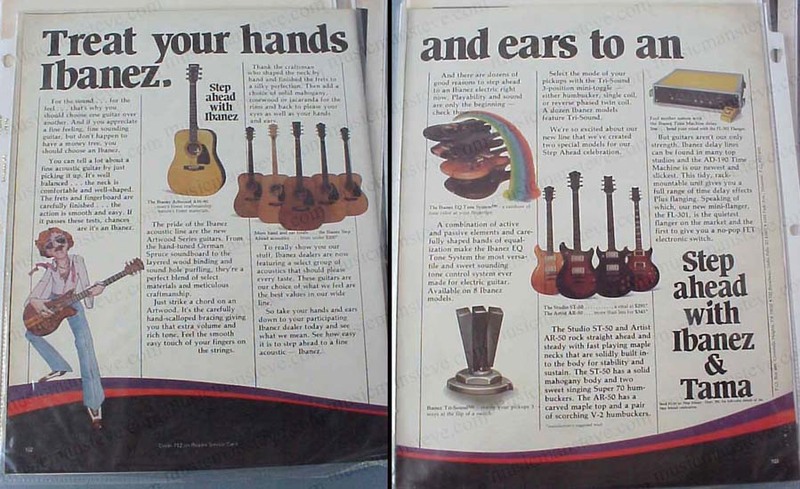 This is an original print ad from a 1978 magazine that measures approximately 8" x 10 3/4" and is suitable for framing. 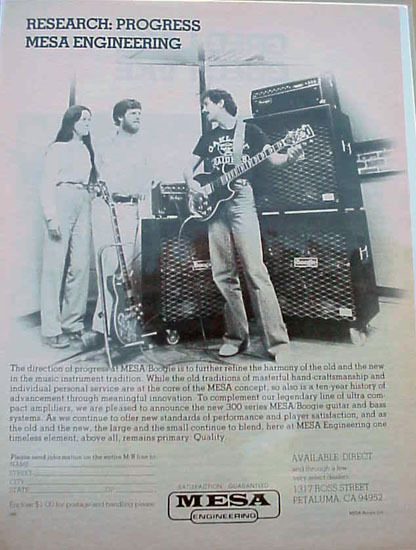 This has a color bulls-eye with K for Kustom and shows the Kustom III Bass Amp..."Finally, a bass amp that's anything you want it to be.."
1978 LaBELLA STRINGS (MARI INC) AD shown in the photo is an original print ad from a 1978 magazine that measures approximately 8" x 10 3/4" and is suitable for framing. 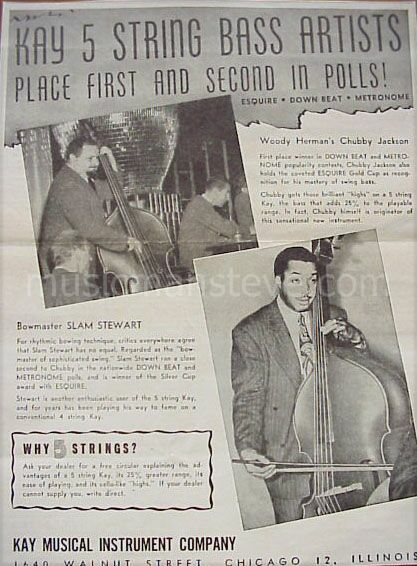 This is a cool early ad for "Sweet Talkin' Bronze" strings, "Fast Talkin' Steel" strings and "Deep Talkin' Bass" strings. 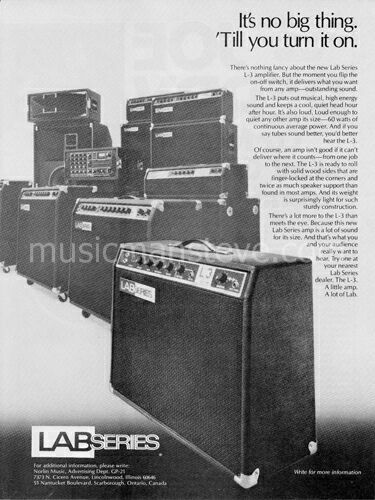 1978 LAB SERIES AMPS PRINT AD shown in the photo. 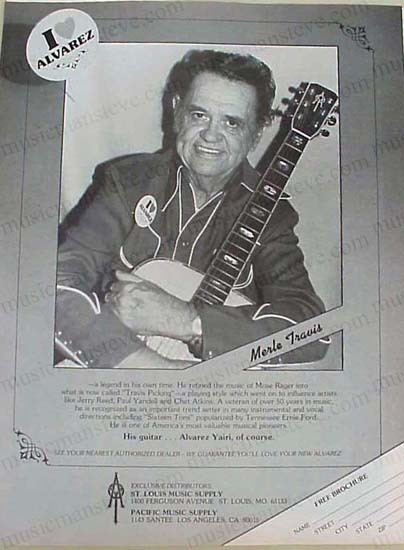 This is an original print ad from a 1978 magazine that measures approximately 8" x 10 3/4" and is suitable for framing. 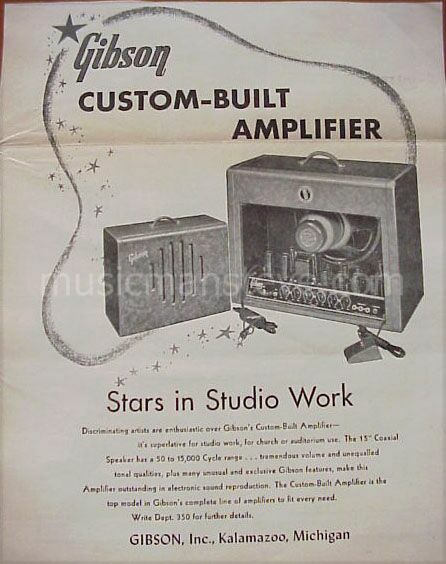 This is a cool early ad for Norlin's LAB SERIES amps. 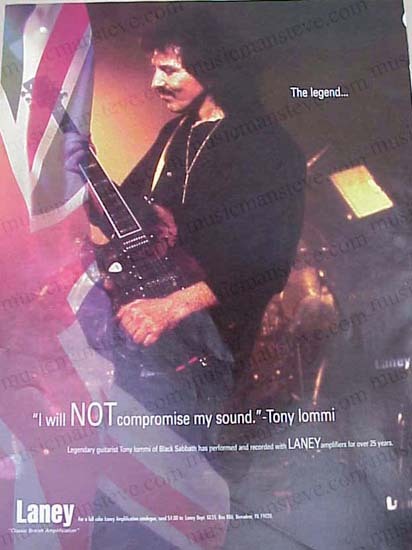 1997 LANEY AMPLIFIERS PRINT AD shown in the photo is an original print ad excerpted from a 1997 magazine that measures approximately 8" x 11" ..features TONY IOMMI.."I will NOT compromise my sound"
1978 BILL LAWRENCE PICKUPS PRINT AD shown in the photo is an original print ad from a 1978 magazine that measures approximately 8" x 10 3/4" and is suitable for framing. 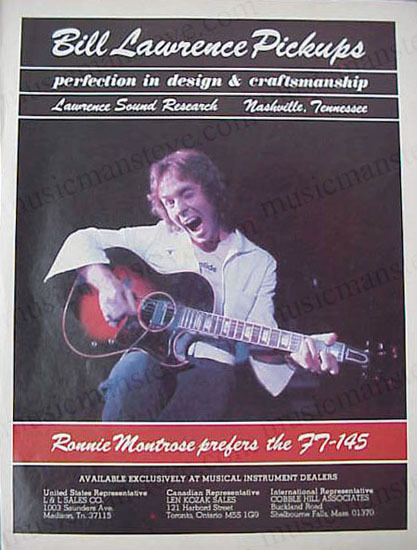 This is a cool early ad for Lawrence pickups featuring Ronnie Montrose playing a vintage Gibson CF-100 guitar fitted with a Lawrence FT-145 pickup. 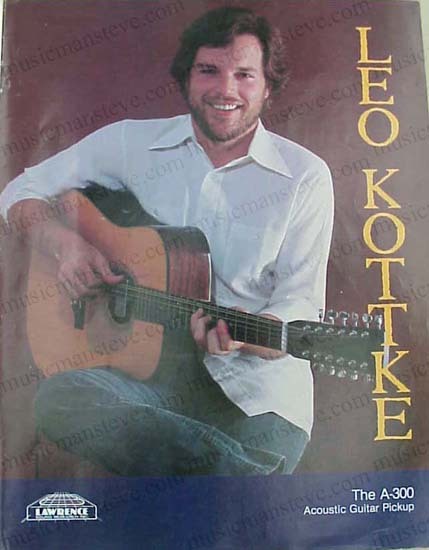 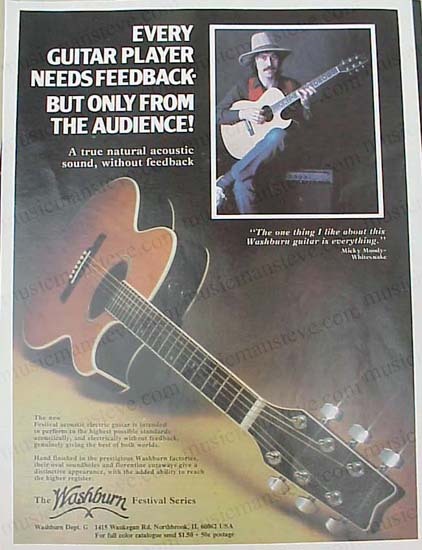 1982 LAWRENCE SOUND RESEARCH PRINT AD shown in the photo is an original print ad from a 1982 magazine that measures approximately 8" x 11" ..features LEO KOTTKE using Lawrence A-300 acoustic guitar pickup. 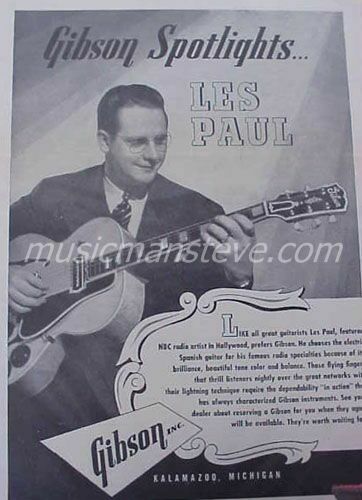 LES PAUL FEATURE 1951 - "RHUBARB RED"
1951 LIFTON CASES PRINT AD shown in the photo is an original long format print ad from a 1951 magazine that measures only 1 1/4" high x 8 1/4" long and is white letters on black backgroung. 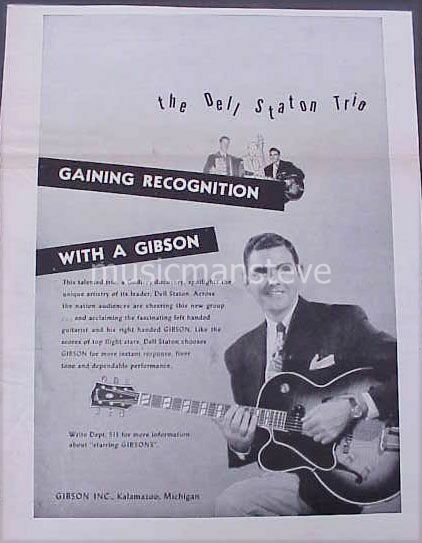 This is a cool early ad for the famous LIFTON cases showing the classic Les Paul size brown case. 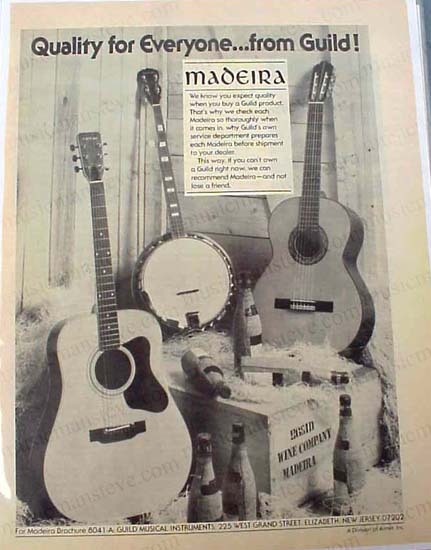 1975 MADEIRA GUITARS PRINT AD shown in the photo is an original print ad from a 1975 magazine that measures approximately 8" x 11" and is suitable for framing. 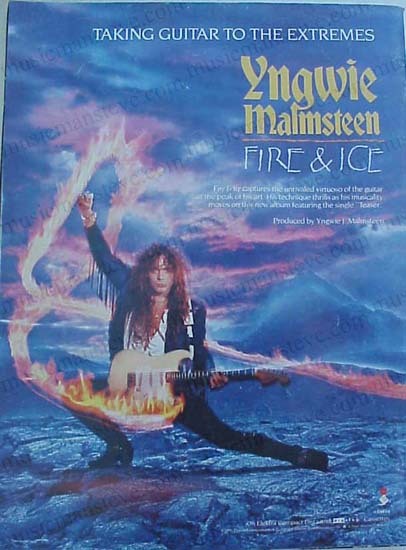 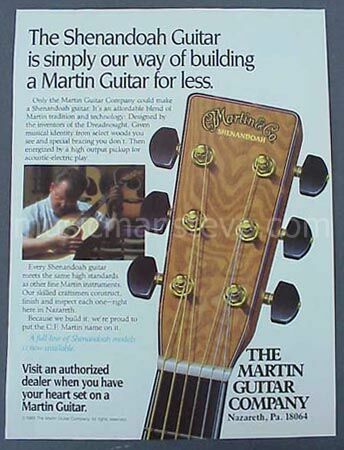 This is a cool early ad for MADEIRA showing guitars & banjo...byline is "Quality for Everyone...from Guild.."
1992 YNGWIE MALMSTEEN PRINT AD shown in the photo is an original print ad excerpted from a 1992 magazine that measures approximately 8" x 11" ..features YNGWIE with strat..."taking guitar to the extremes"
1982 MARTIN GUITAR PRINT AD shown in the photo is an original print ad from a 1982 magazine that measures approximately 8" x 11" ..shows D-28, "Martin, The Original" byline. 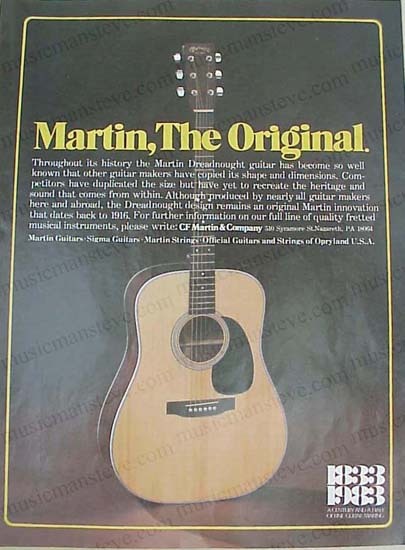 1978 MARTIN GUITAR PRINT AD shown in the photo. 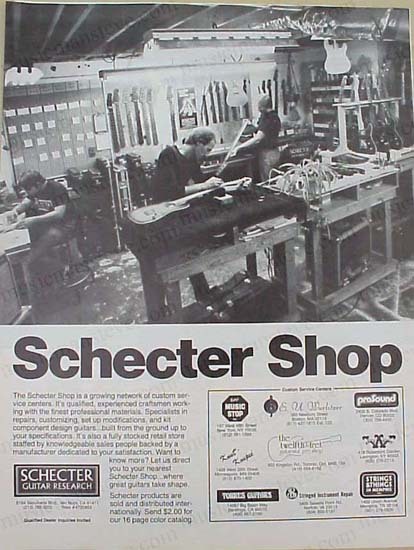 This is an original print ad from a 1978 magazine that measures approximately 8" x 10 3/4" and is suitable for framing. 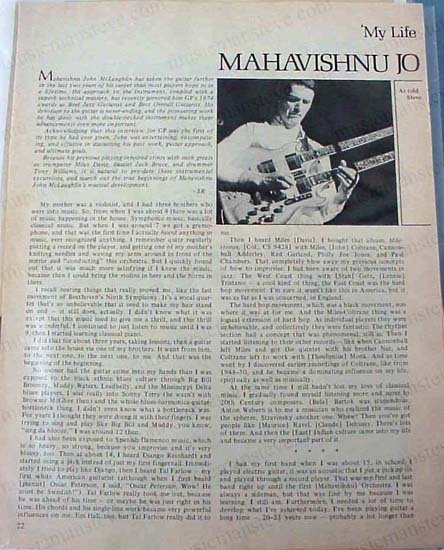 This is a cool early ad for Martin Guitars showing tools and Martin Guitar parts. .
1975 MAHAVISHNU JOHN McLAUGHLIN complete article shown is an original excerpt from a 1975 trade magazine that measures approximately 8" x 11" and is suitable for framing.. 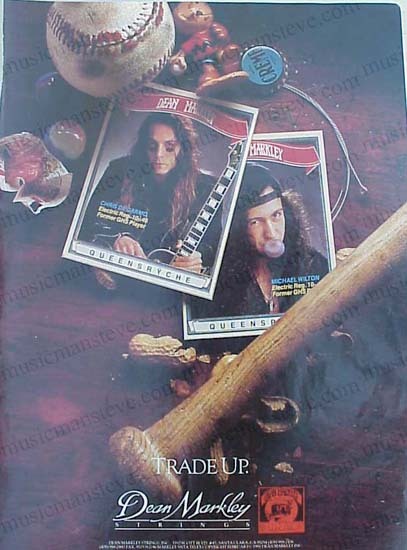 This is a cool early excerpt with McLaughlin's photo and complete interview..multiple pages..
1997 DEAN MARKLEY STRINGS PRINT AD shown in the photo is an original print ad from a 1997 magazine that measures approximately 8" x 11" ..features endorser STEVE VAI for BLUE STEEL strings. 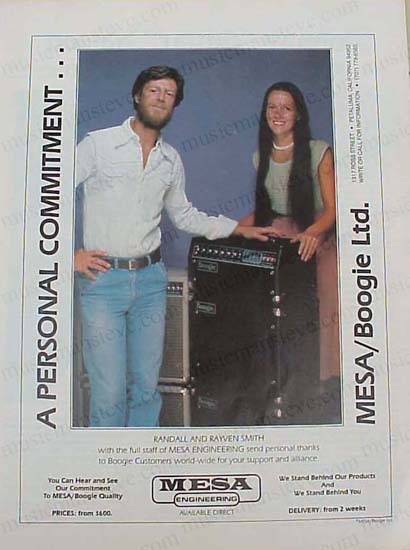 1978 MESA / BOOGIE AMP PRINT AD shown in the photo. 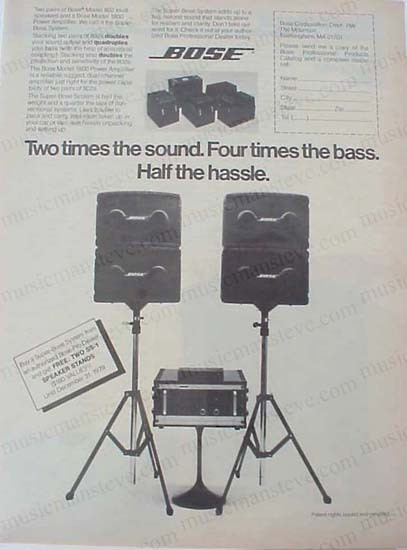 This is an original print ad from a 1978 magazine that measures approximately 8" x 10 3/4" and is suitable for framing. 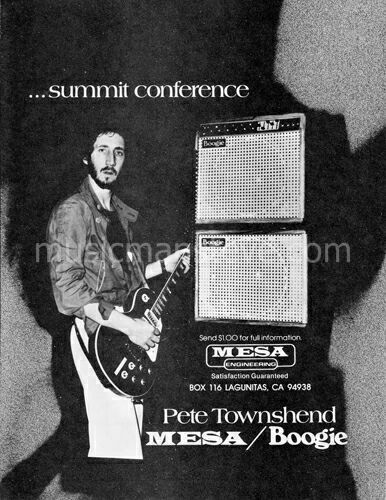 This is a cool early ad for MESA/BOOGIE showing PETE TOWNSHEND playing a Les Paul guitar through Mesa/Boogie amps..
1976 MESA / BOOGIE amp PRINT AD featuring CARLOS SANTANA playing Les Paul shown in the photo. 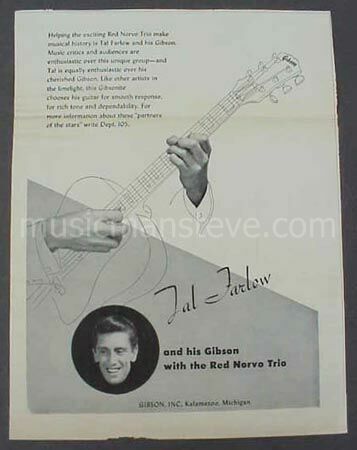 This is an original print ad from a 1976 magazine that measures approximately 8 1/4" x 10 3/4" and is suitable for framing. 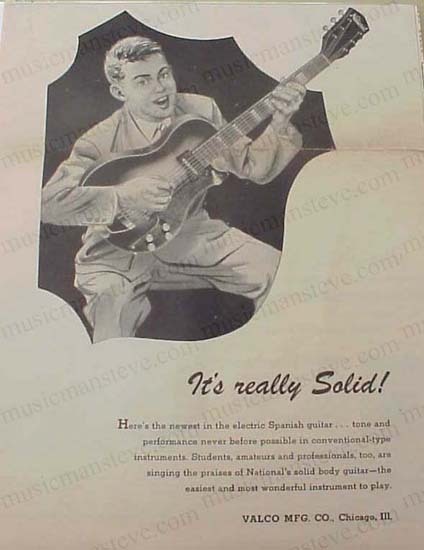 This is a cool early ad showing Carlos Santana playing his solid body Les Paul electric guitar through a MESA/BOOGIE amp back in the day. 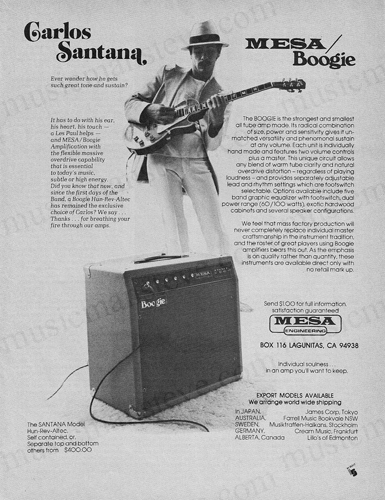 1979 MESA / BOOGIE AMP PRINT AD shown in the photo is an original print ad from a 1979 magazine that measures approximately 8 1/2" x 11" and is suitable for framing. 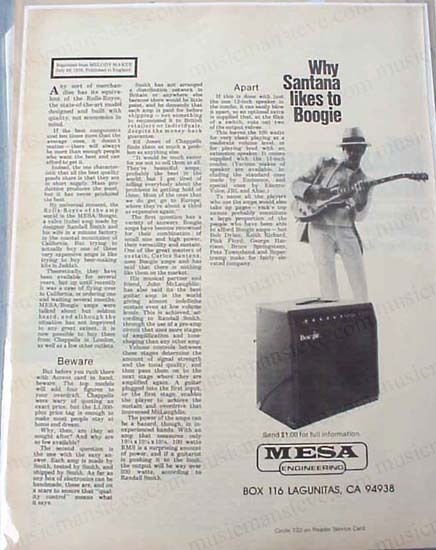 This is a cool early ad for MESA / BOOGIE AMP featuring CARLOS SANTANA... the byline "Why Santana likes to Boogie.."
1982 MESA / BOOGIE PRINT AD shown in the photo is an original print ad from a 1982 magazine that measures approximately 8" x 11" ..with Randall and Rayven Smith..our commitment. 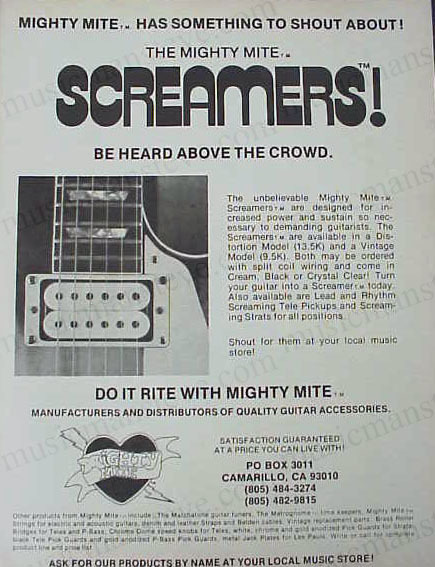 1977 MIGHTY MITE SCREAMERS PICKUP AD shown in the photo is an original print ad from a 1977 magazine that measures approximately 8 1/4" x 10 3/4" and is suitable for framing. 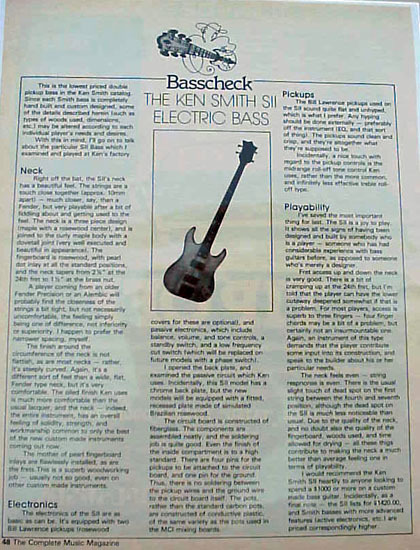 "Do It Right With Mighty Mite" byline..
1978 MITCHELL SPEAKER CO. 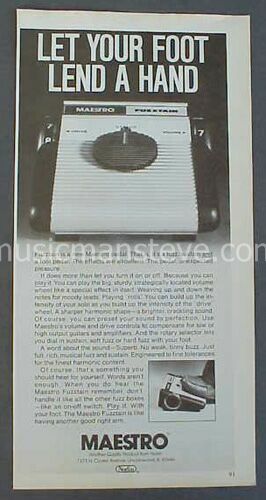 AD shown in the photo is an original print ad from a 1978 magazine that measures approximately 8 1/4" x 10 3/4" and is suitable for framing. 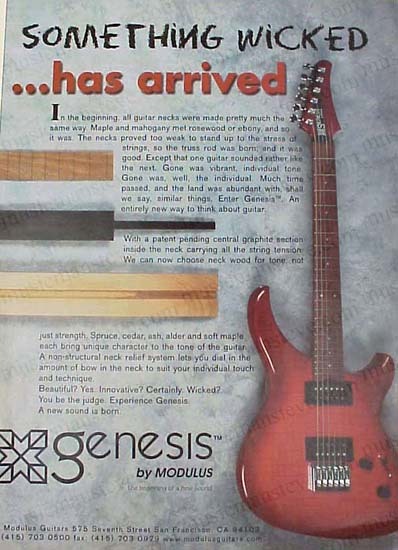 "Now You Have A Choice" byline..
1997 MODULUS GUITAR PRINT AD shown in the photo is an original print ad from a 1997 magazine that measures approximately 8" x 11" .."something Wicked has arrived"...Genesis model guitar by Modulus. 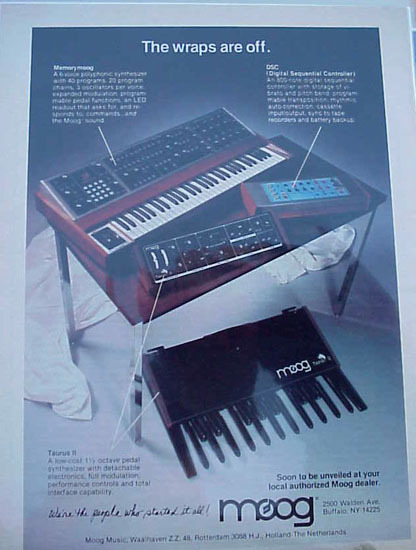 1979 MOOG PRODIGY PRINT AD shown in the photo is an original print ad from a 1979 magazine that measures approximately 8 1/2" x 11" and is suitable for framing. 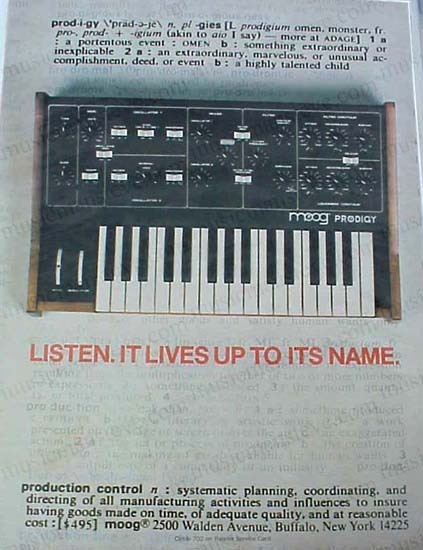 This is a cool early ad for MOOG showing their PRODIGY with the byline "Listen. 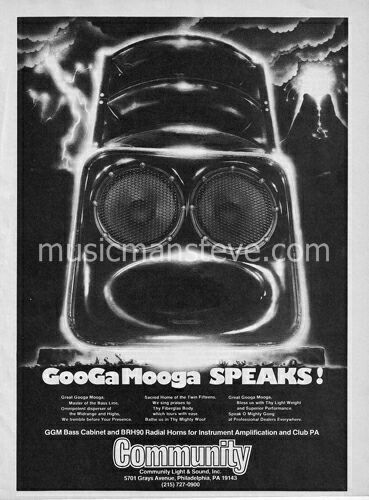 It Lives Up To Its Name..."
1982 MOOG MUSIC PRINT AD shown in the photo. 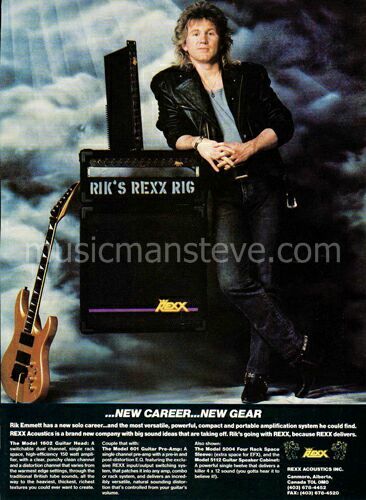 This is an original print ad from a 1982 magazine that measures approximately 8" x 11" and is suitable for framing. 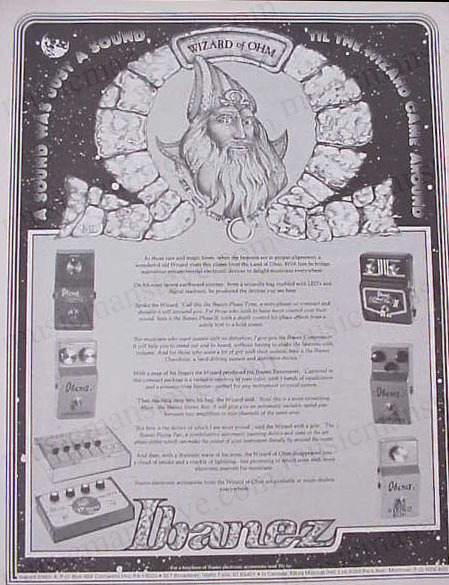 This is a cool vintage ad for MOOG MUSIC featuring Taurus II, Memory Moog & DSC Synthesizers. 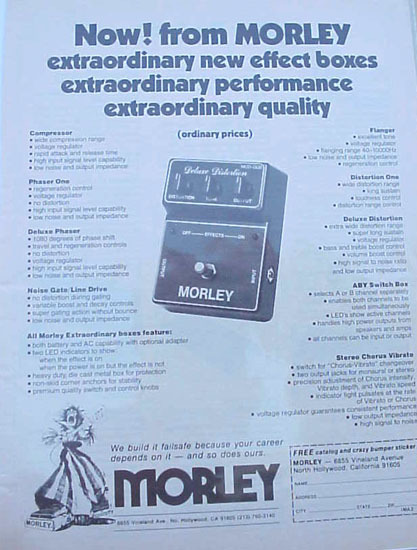 1977 MORLEY EVO PRINT AD shown in the photo is an original black and white print ad from a 1977 magazine that measures approximately 8" x 10" and is suitable for framing. 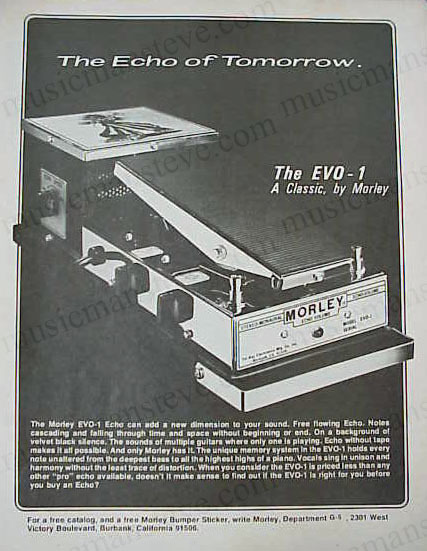 This is a cool early ad for MORLEY showing their ECHO-VOLUME footpedal (evo-1)"The Echo Of Tomorrow" byline....... ..
1997 MORLEY PEDAL PRINT AD shown in the photo is an original print ad from a 1997 magazine that measures approximately 8" x 11" ..features endorser STEVE VAI. 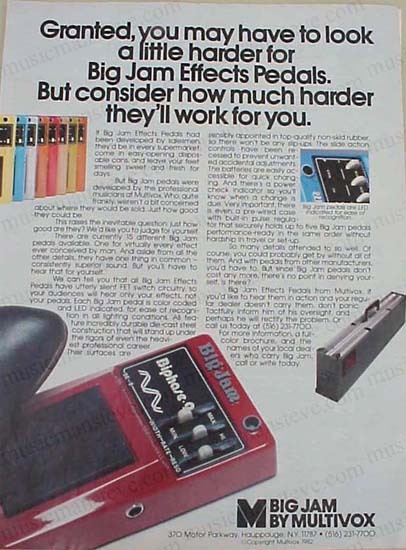 1982 BIG JAM by MULTIVOX PRINT AD shown in the photo is an original print ad from a 1982 magazine that measures approximately 8" x 11" ...nice effects pedal pin-up to frame. 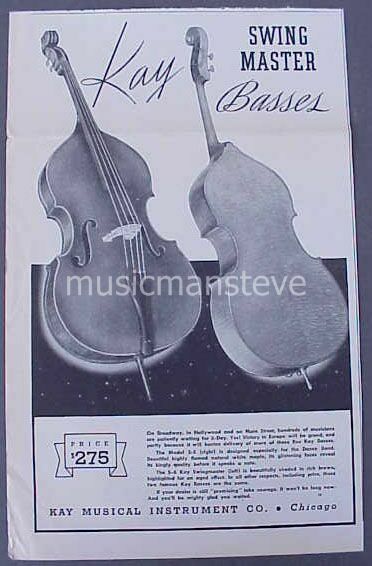 1979 MUSIC MAN PRINT AD shown in the photo is an original print ad from a 1979 magazine that measures approximately 8 1/2" x 11" and is suitable for framing. 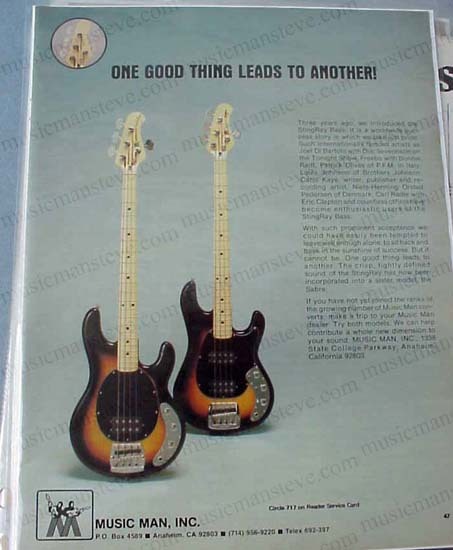 This is a cool early ad for MUSIC MAN featuring their StingRay and Sabre basses... the byline "One Good Thing Leads To Another.."
1977 MORRIS GUITARS AD shown in the photo. 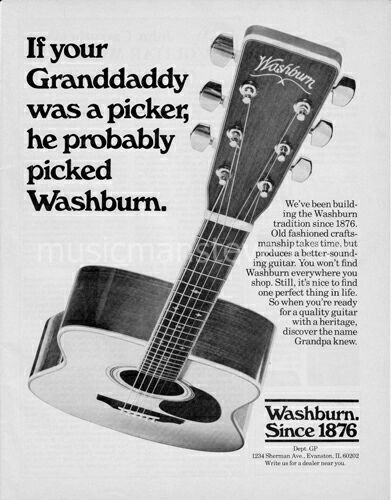 This is an original print ad from a 1976 magazine that measures approximately 8" x 10 1/2" and is suitable for framing. 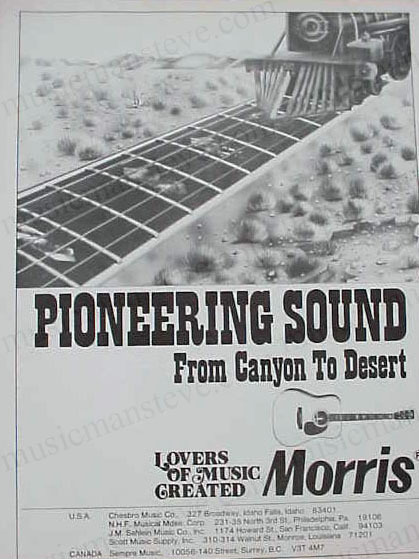 Shows the fingerboard of Morris acoustic guitar with train coming down the fretboard...."Pioneering Sound From Canyon To Desert" byline..... ..
1976 MU-TRON PHASOR II PRINT AD shown in the photo. 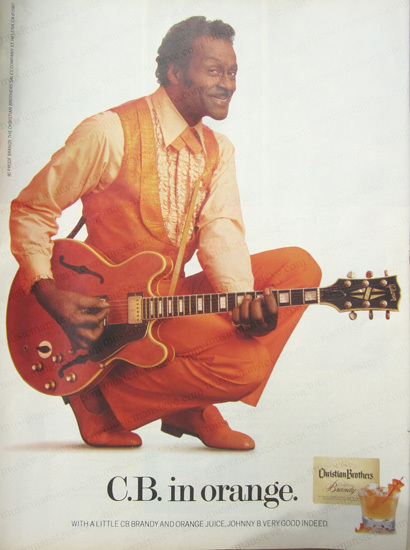 This is an original print ad from a 1976 magazine that measures approximately 8" x 10 1/2" and is suitable for framing. 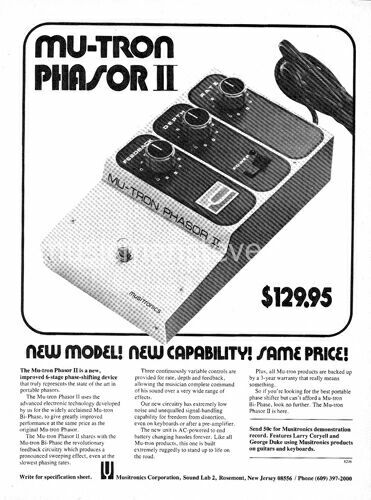 Shows the Mu-Tron II 6 stage phase-shifting device offered by Musitronics back in the day..... ..
1975 MU-TRON PHASOR PRINT AD shown in the photo is an original print ad from a 1975 magazine that measures approximately 8" x 11" and is suitable for framing. 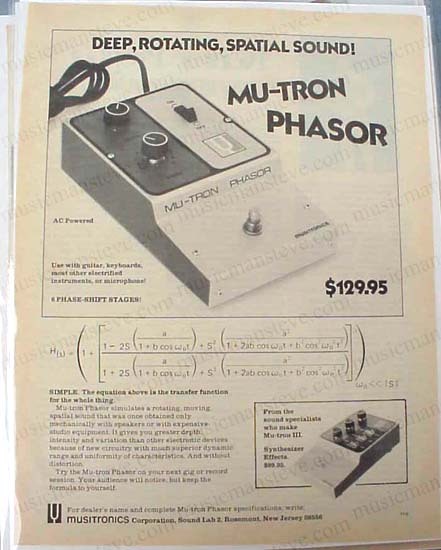 This is a cool early ad for MU-TRON PHASOR....byline is "Deep, Rotating, Spatial Sound.."
MXR EFFECTS AD 1978 "CONFIDENCE"
1978 MXR EFFECTS AD PRINT AD shown in the photo is an original print ad from a 1978 magazine that measures approximately 8" x 10 1/2" and is suitable for framing. 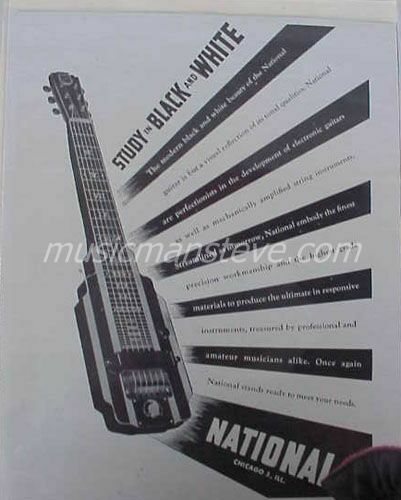 Shows the early MXR guitar effects pedals and rack mounts offered back in the day..... ..
1945 NATIONAL LAP STEEL PRINT AD shown in the photo. 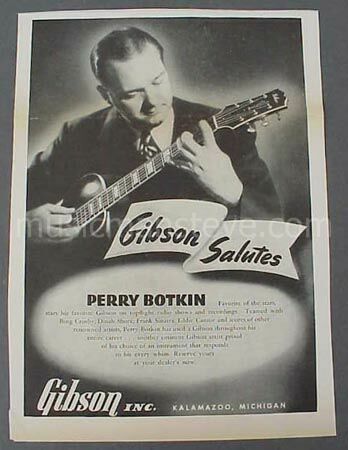 This is an original print ad from a 1945 magazine that measures approximately 7 1/2" x 10 1/4" and is suitable for framing. 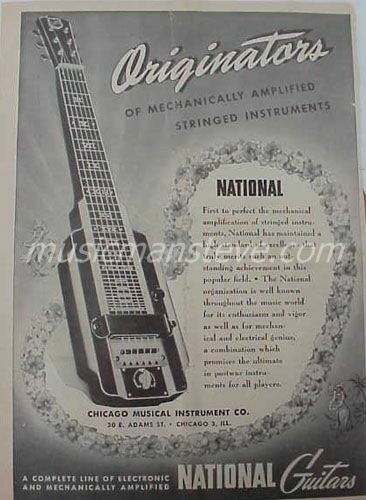 Shows National Lap Steel Guitar by line is "Originators of Mechanically Amplified Stringed Instruments".....minor crease evident from fold in source trade paper ..
1945 NATIONAL LAP STEEL PRINT AD shown in the photo. 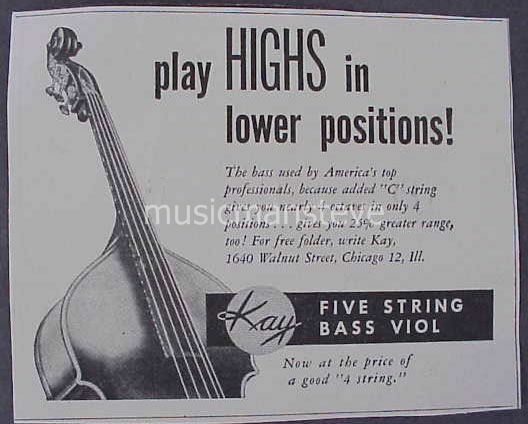 This is an original print ad from a 1945 magazine that measures approximately 8 1/2" x 10 1/2" and is suitable for framing. 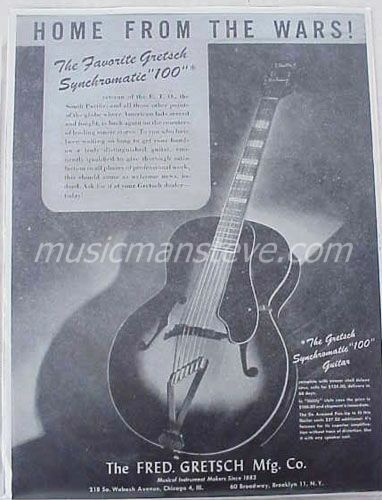 Shows a National Lap Steel Guitar by line is "STUDY IN BLACK AND WHITE".....minor crease evident from fold in source trade paper ..
1946 NATIONAL SPANISH ELECTRIC GUITAR PRINT AD shown in the photo is an original print ad from a 1946 magazine that measures approximately 8 1/4" x 10 1/2" and is suitable for framing. 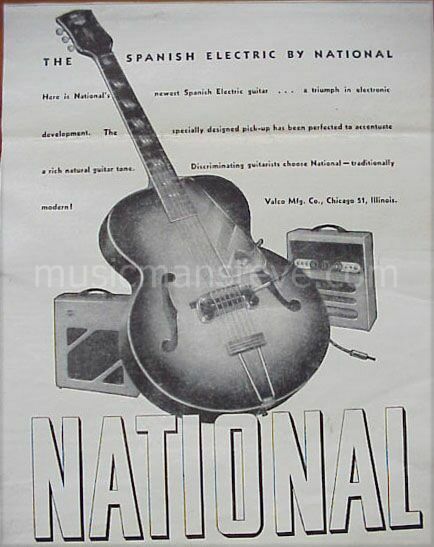 Shows the National Spanish Electric Guitar and amplifier......minor crease evident from fold in source trade paper ..
1947 NATIONAL (Valco) ELECTRIC GUITAR PRINT AD shown in the photo. 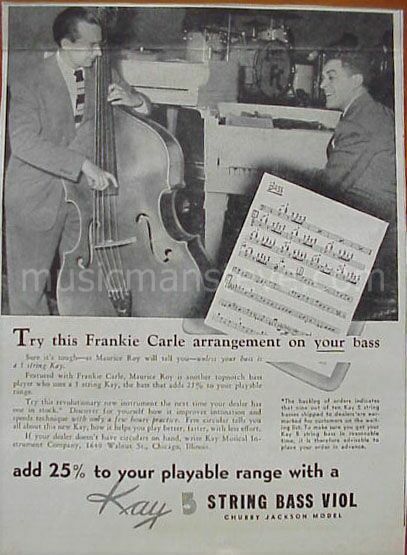 This is an original print ad from a 1947 magazine that measures approximately 8 1/2" x 11" and is suitable for framing. 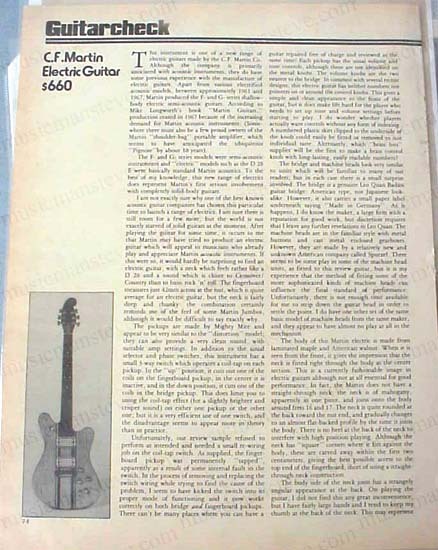 Shows early National Electric solid body guitar........crease evident from fold in source trade paper..byline is "It's really Solid!" 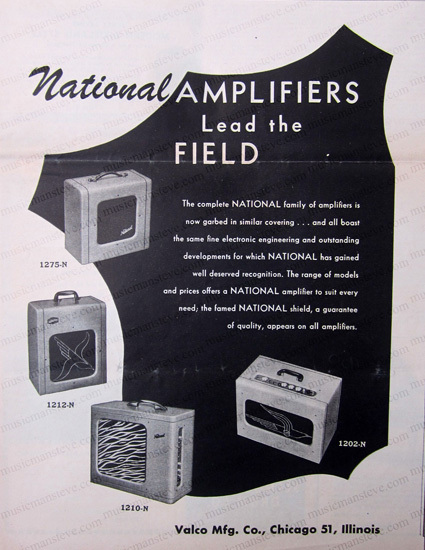 1947 NATIONAL (Valco) AMPLIFIERS PRINT AD shown in the photo is an original print ad from a 1947 magazine that measures approximately 8 1/2" x 11" and is suitable for framing. 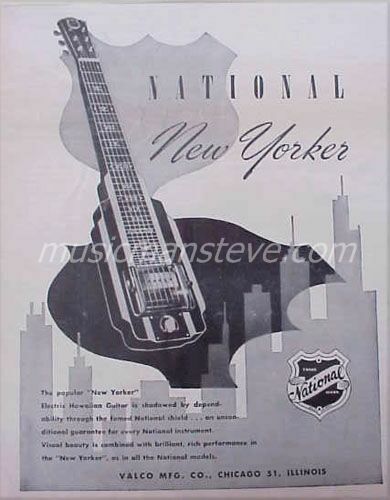 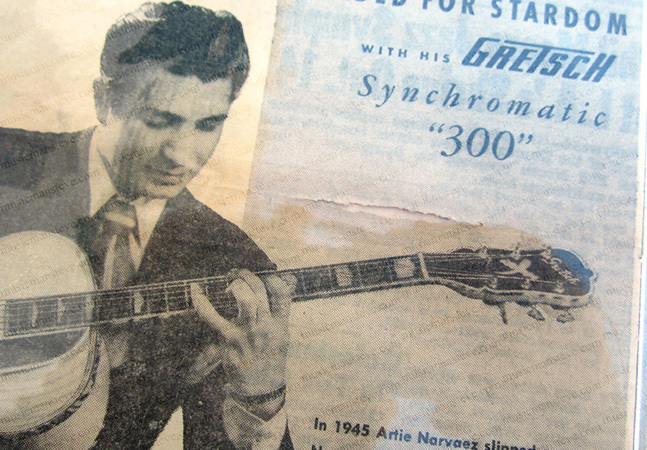 Shows early National amplifiers model 1275-N, 1212-N, 1210-N, 1202-N....byline is "National Amplifiers Lead the Field"....crease evident from fold in source trade paper..
1948 NATIONAL (Valco) LAP STEEL PRINT AD shown in the photo. 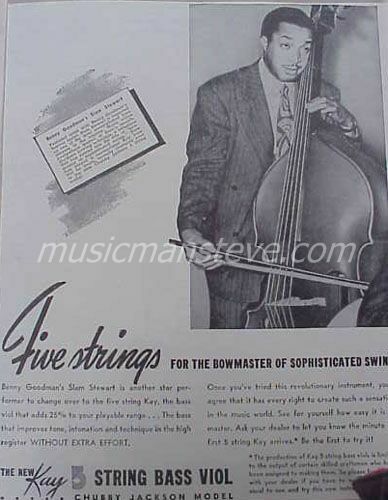 This is an original print ad from a 1948 magazine that measures approximately 8" x 10 3/4" and is suitable for framing. 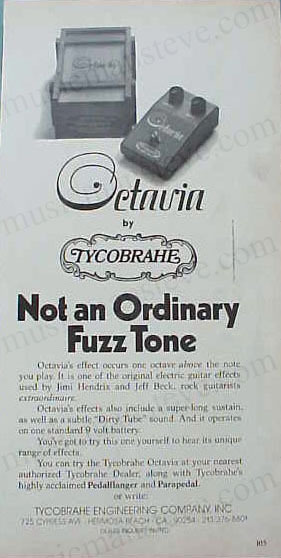 Shows National New Yorker Lap Steel Guitar........minor crease evident from fold in source trade paper ..
1977 OCTAVIA by TYCOBRAHE ENGINEERING FUZZ TONE AD shown in the photo is an original print ad from a 1977 magazine that measures approximately 5 1/2" x 10 1/2" and is suitable for framing. 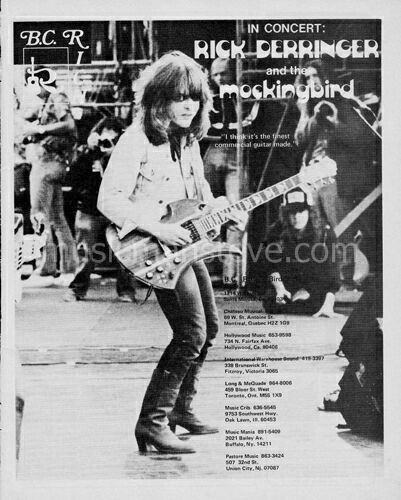 Shows Octavia foot pedal.."Not an Ordinary Fuzz Tone" byline..
1978 OUTLAW MPC BASS Guitar PRINT AD shown in the photo. 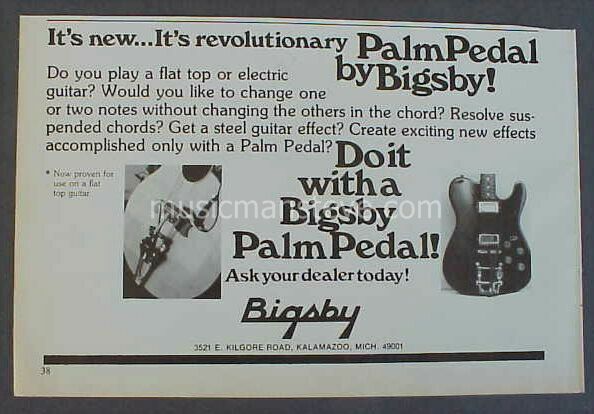 This is an original print ad from a 1978 magazine that measures approximately 8" x 10 3/4" and is suitable for framing. 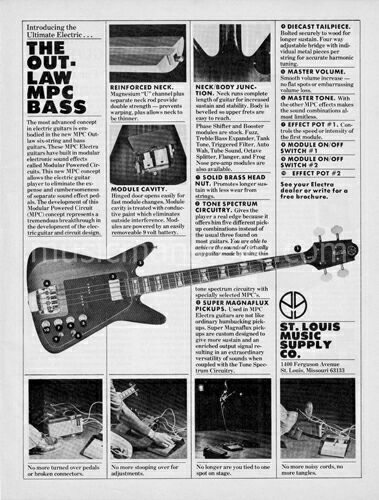 This is a cool early ad for a very rare OUTLAW MPC BASS guitar by St. Louis Music Supply Co..
1976 OVATION DEACON solid body guitar PRINT AD shown in the photo. 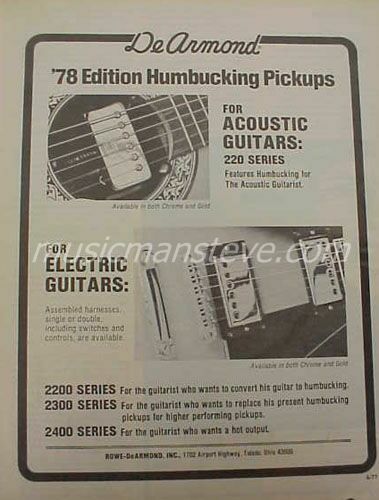 This is an original print ad from a 1976 magazine that measures approximately 8" x 10 1/2" and is suitable for framing. 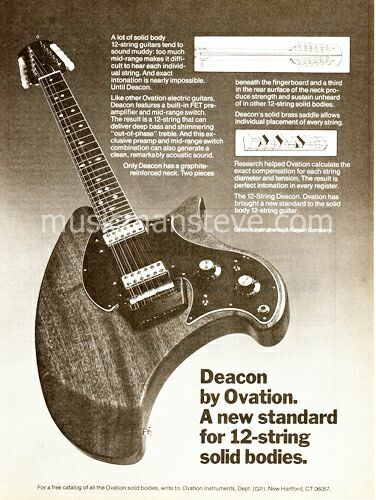 Shows the rare and interesting DEACON 12 string solid body produced by Ovation at the time. 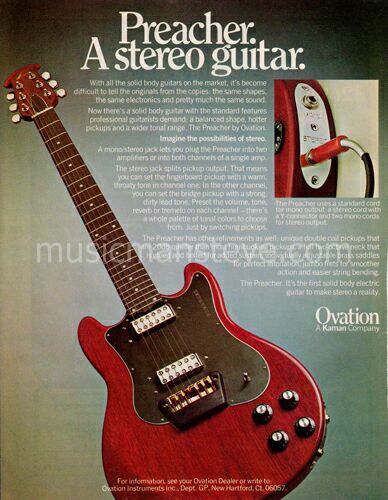 1976 OVATION PRINT AD - FULL COLOR ad shown in the photo. 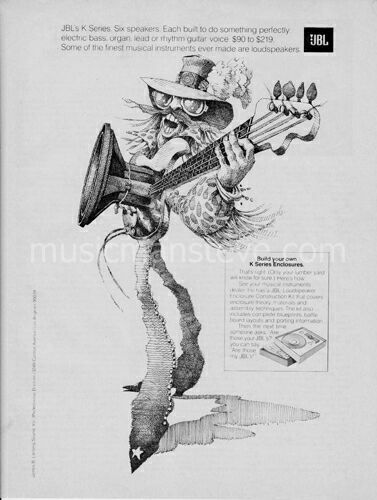 This is an original print ad from a 1976 magazine that measures approximately 8 1/4" x 10 3/4" and is suitable for framing. 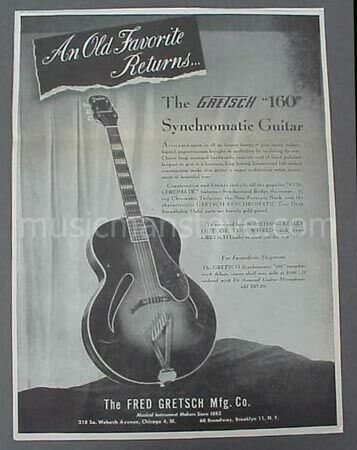 This is a cool early ad showing an early Ovation acoustic-electric guitar back in the day. 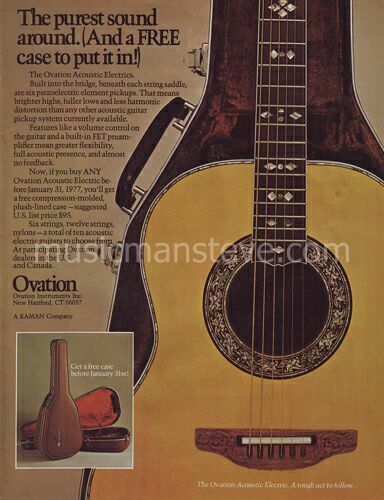 The ad offered a free Ovation hard case with any Ovation bought before January 1977! 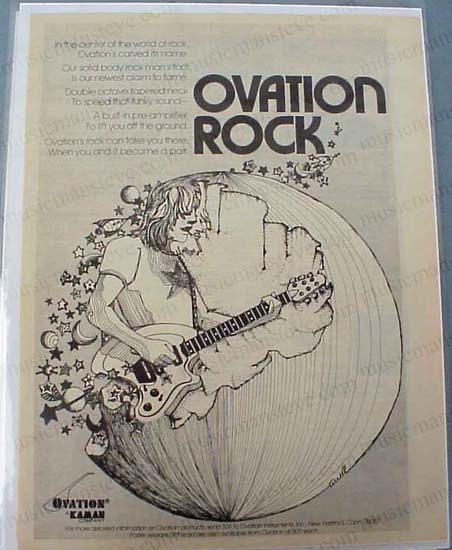 1975 OVATION GUITAR PRINT AD shown in the photo is an original print ad from a 1979 magazine that measures approximately 8 1/2" x 11" and is suitable for framing. 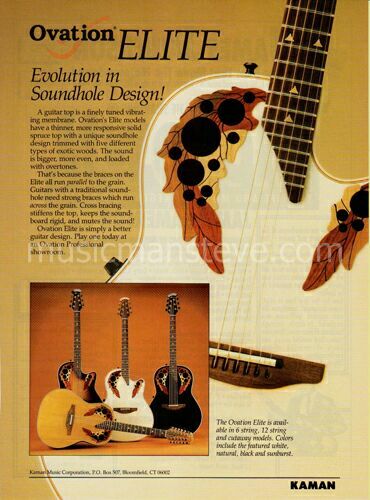 This is a cool early ad for OVATION's solid body guitars....byline is "Ovation Rock"
1982 VATION ADAMAS II GUITAR AD shown in the photo. 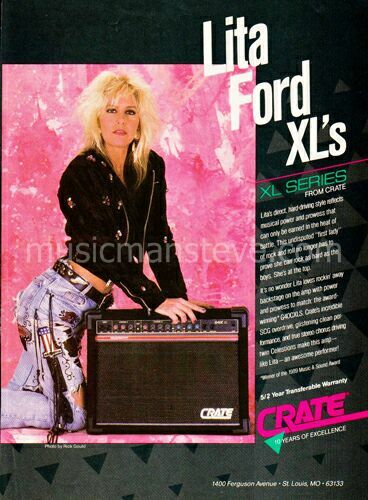 This is an original print ad from a 1982 magazine that measures approximately 8" x 11" and is suitable for framing. 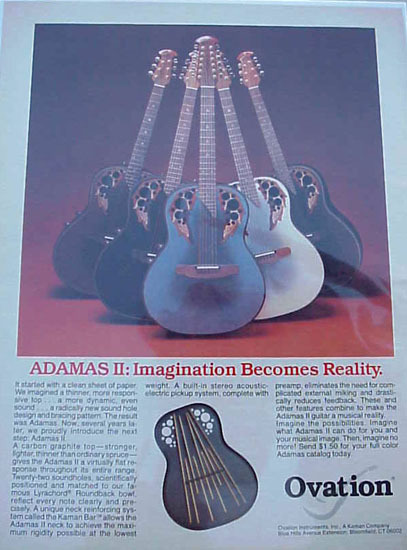 This is a cool vintage ad for OVATION showing 5 Adamas II guitars in color. 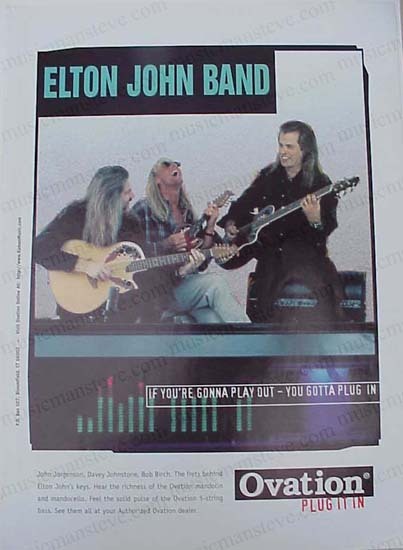 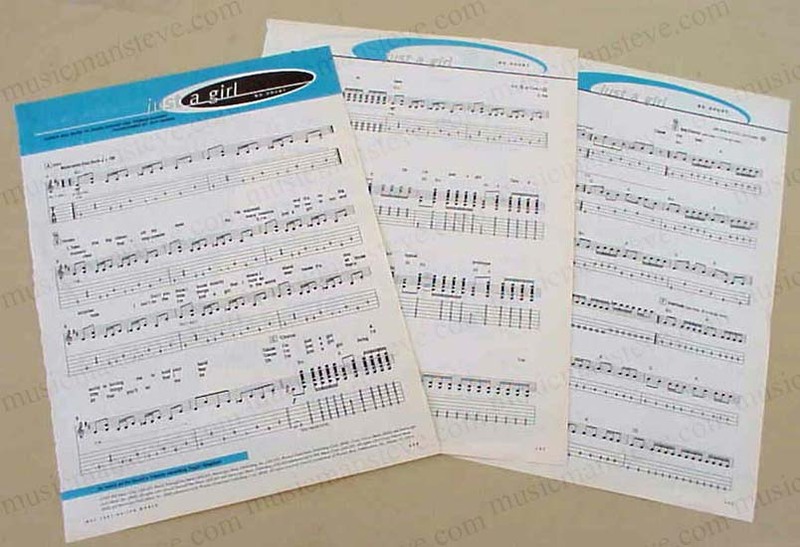 1997 OVATION GUITAR PRINT AD shown in the photo is an original print ad excerpted from a 1997 magazine that measures approximately 8" x 11" ..John Jorgenson, Davey Johnstone, Bob Birch and Ovation guitars. 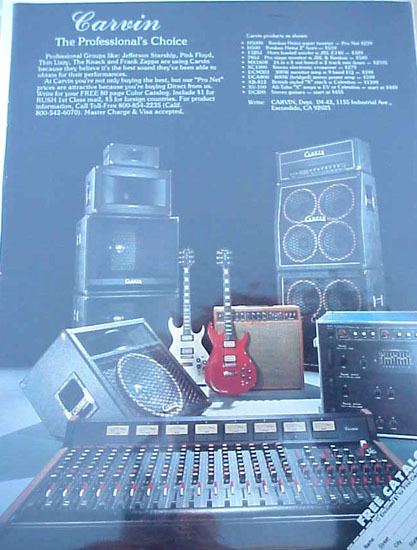 1978 PEAVEY ELECTRONICS AD featuring LYNYRD SKYNYRD shown in the photo. 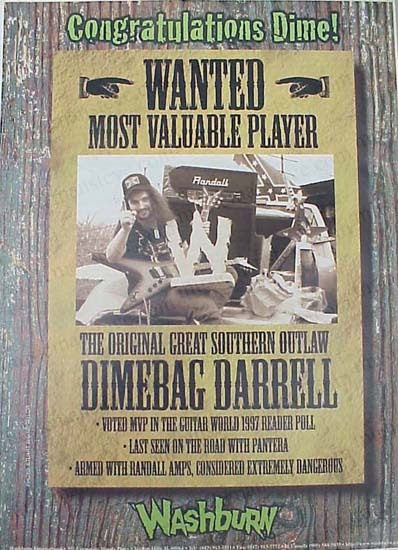 This is an original print ad from a 1978 magazine that measures approximately 8" x 10 3/4" and is suitable for framing. 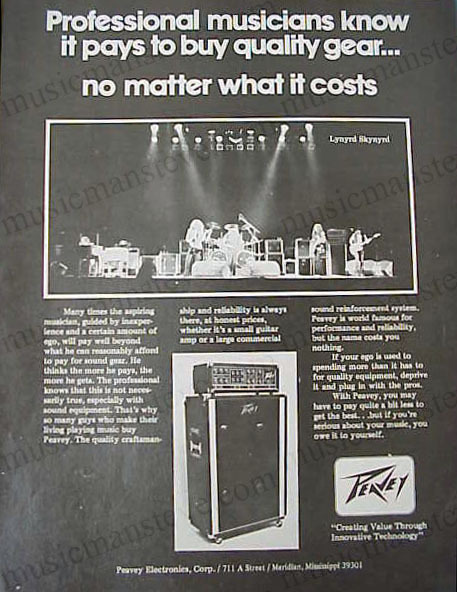 This is a cool early ad with an insert showing LYNYRD SKYNYRD on stage with Peavey gear. 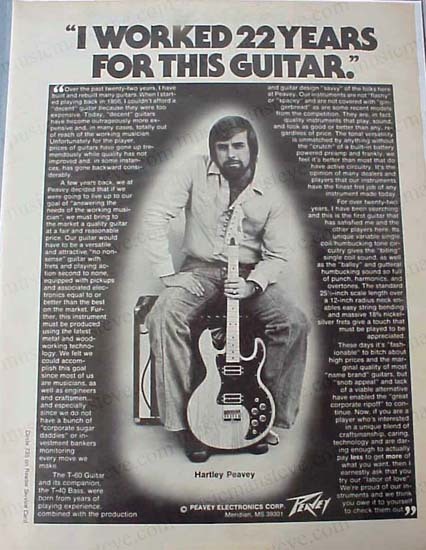 The ad line is "Professional musicians know it pays to buy quality gear..."..
1979 PEAVEY ELECTRONICS PRINT AD shown in the photo is an original print ad from a 1979 magazine that measures approximately 8 1/2" x 11" and is suitable for framing. 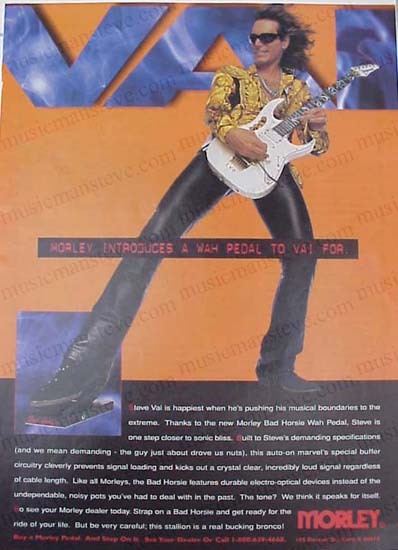 This is a cool early ad for PEAVEY ELECTRONICS featuring Hartley Peavey with a T-60 guitar... the byline "I Worked 22 Years For This Guitar..."
1990 PEAVEY BASS PRINT AD featuring RUDY SARZO and his SIGNATURE Peavey BASS shown in the photo. 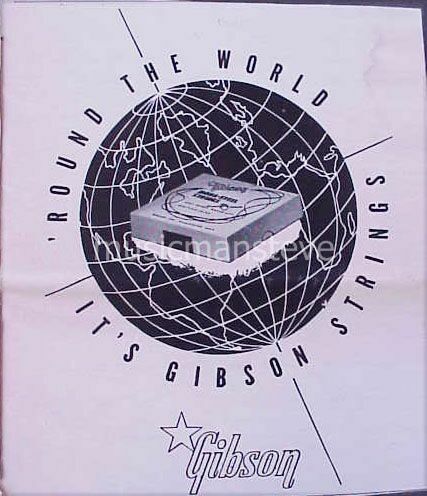 This is an original print ad from a 1990 magazine that measures approximately 8" x 10 3/4" and is suitable for framing. 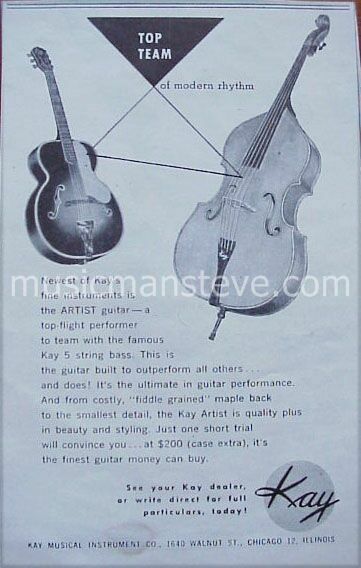 This is a cool early ad showing Rudy Sarzo playing this bass. 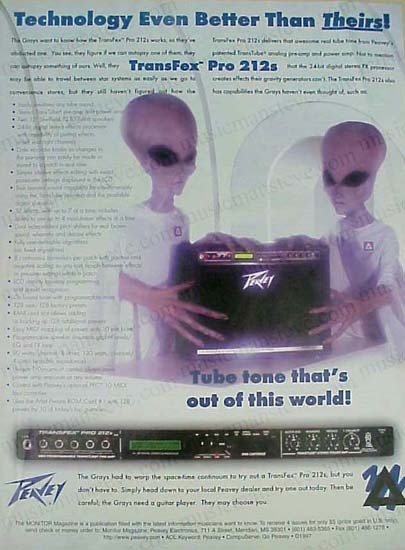 The ad line is "THE AMERICAN BASS HEARD 'ROUND THE WORLD"..
1997 PEAVEY AMPS PRINT AD shown in the photo is an original print ad excerpted from a 1997 magazine that measures approximately 8" x 11" ..TransFex Pro 212s Amps. 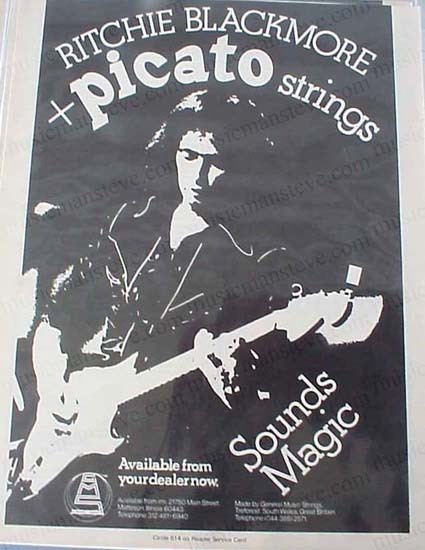 1979 PICATO STRINGS PRINT AD shown in the photo is an original black and white print ad from a 1979 magazine that measures approximately 8 1/2" x 11" and is suitable for framing. 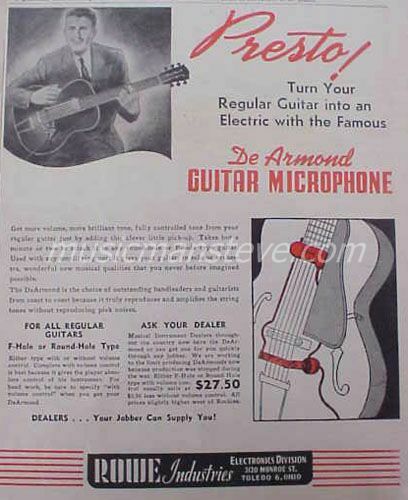 This is a cool early ad for PICATO STRINGS featuring endorser RITCHIE BLACKMORE with byline.."Sounds Magic.."
1947 PREMIER "66" TREMOLO AMP AD shown in the photo is an original print ad from a 1947 magazine that measures approximately 7 1/2" x 8 1/2" and is suitable for framing. 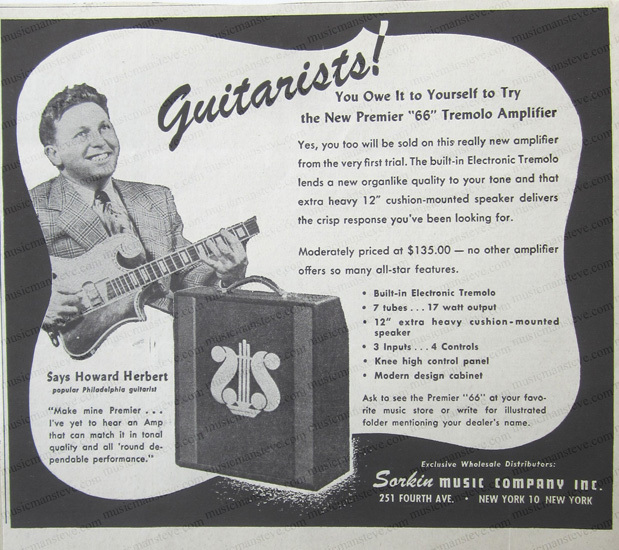 This is a cool early ad for PREMIER AMPS by Sorkin Music Company showing endorser HOWARD HERBERT playing an off the wall Premier guitar! 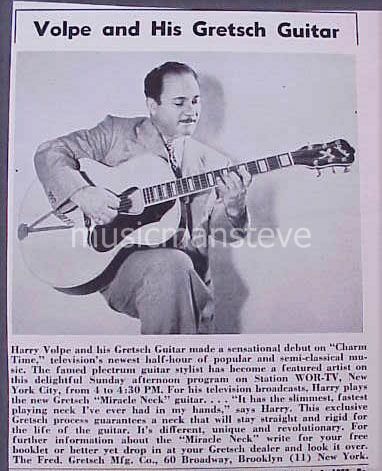 byline is "Guitarists! 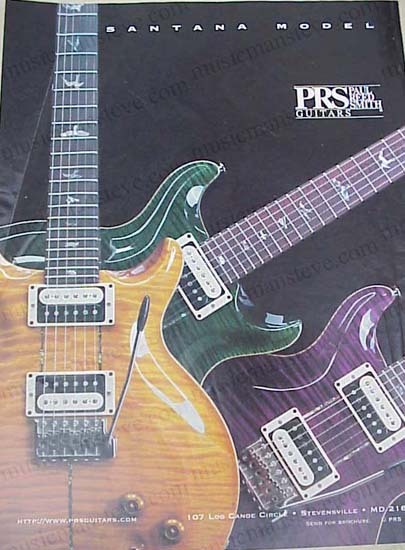 You Owe In to Yourself to Try the New Premier "66" Tremolo Amplifier.."
1997 PRS GUITARS PRINT AD shown in the photo is an original print ad excerpted from a 1997 magazine that measures approximately 8" x 11" ..Artist Series III. 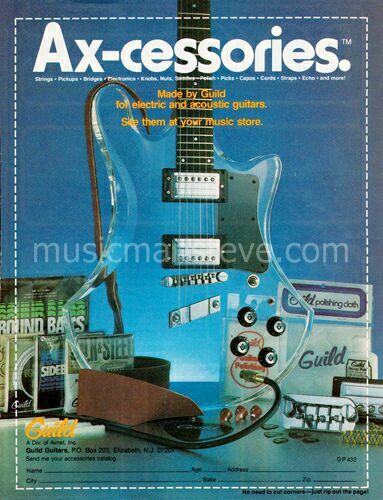 1977 RANDALL INSTRUMENTS PRINT AD featuring J.D. 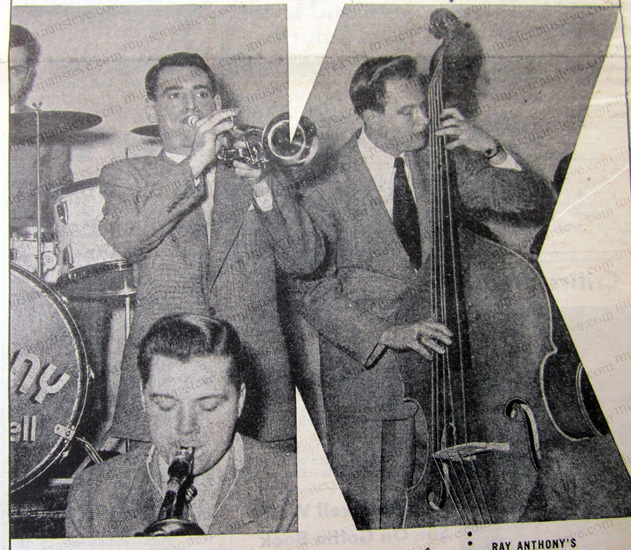 WALTERS & BUDDY CHURCH shown in the photo. 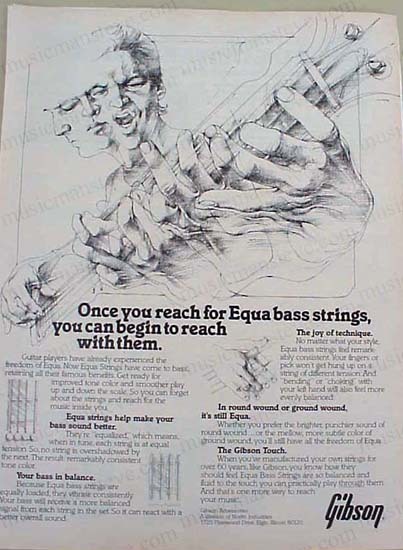 This is an original print ad from a 1977 magazine that measures approximately 8" x 10 3/4" and is suitable for framing. 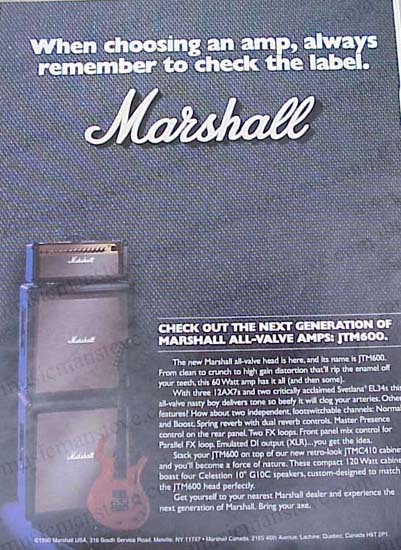 This is a cool early ad for Randall Amps featuring J.D. 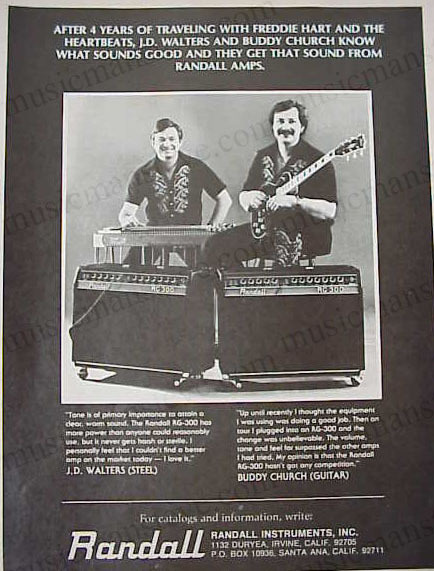 WALTERS & BUDDY CHURCH endorsing Randall RG-300 amps. 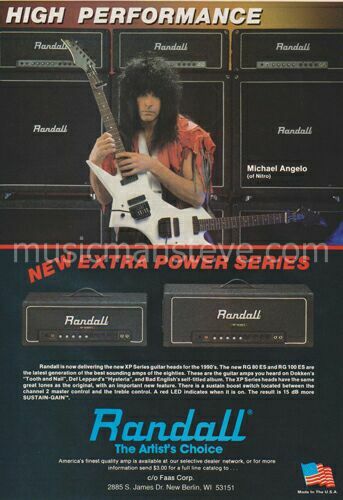 1978 RANDALL AMPS PRINT AD shown in the photo. 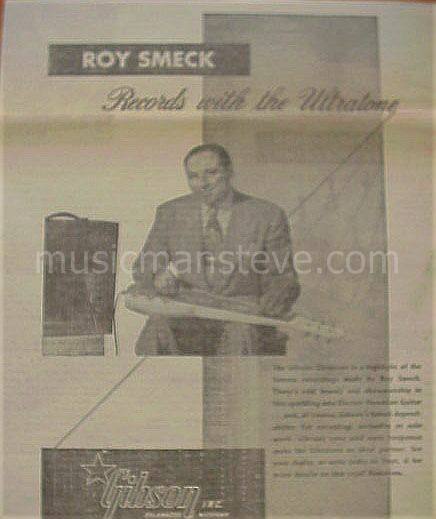 This is an original print ad from a 1978 magazine that measures approximately 8" x 10 3/4" and is suitable for framing. 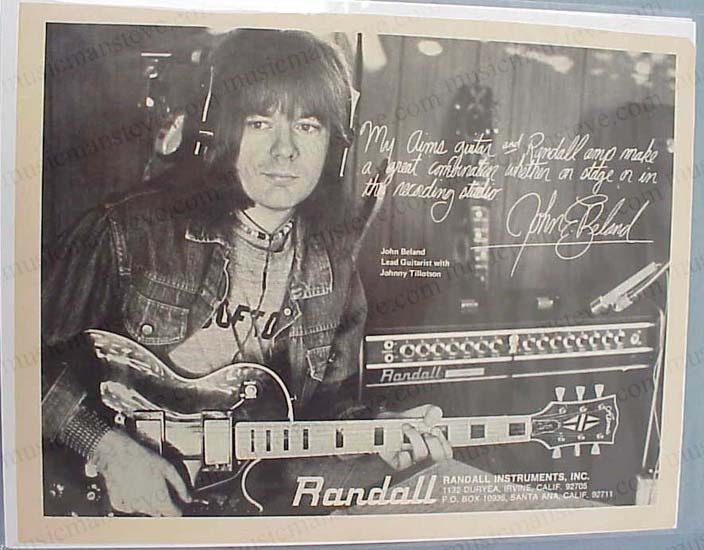 This is a cool early ad for Randall Amps featuring Jefferson Kewley with a TRAVIS BEAN guitar. .
1978 RANDALL INSTRUMENTS PRINT AD shown in the photo. 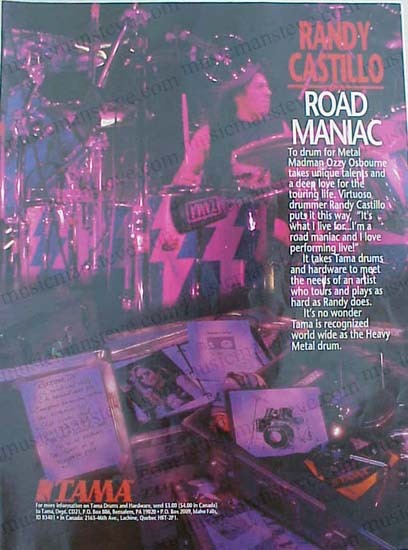 This is an original print ad from a 1978 magazine that measures approximately 8" x 10 3/4" and is suitable for framing. 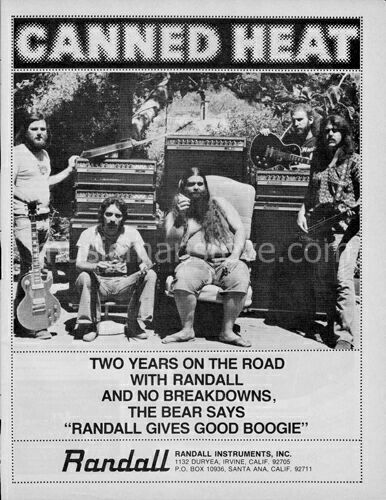 This is a cool early ad for Randall Amps featuring CANNED HEAT "Randall Gives Good Boogie". 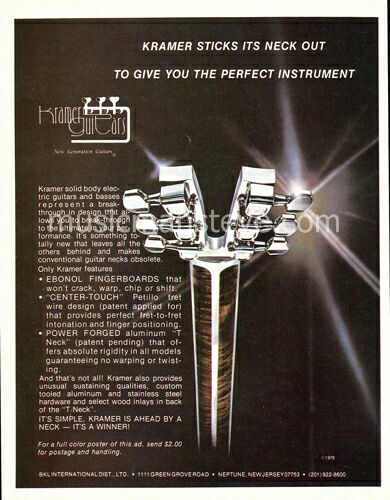 1979 RANDALL INSTRUMENTS PRINT AD shown in the photo. 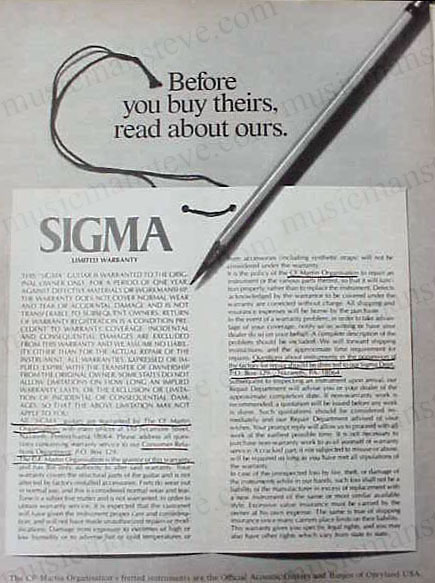 This is an original print ad from a 1979 magazine that measures approximately 8 1/2" x 11" and is suitable for framing. 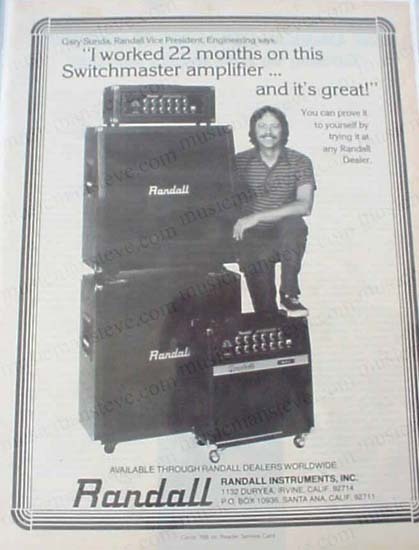 This is a cool early ad for Randall Amps featuring Gary Sunda, Randall Vice President, Engineering... "I worked 22 months on this Switchmaster amplifier...."
1975 RANDALL INSTRUMENTS PRINT AD shown in the photo is an original print ad from a 1975 magazine that measures approximately 8 1/2" x 11" and is suitable for framing. 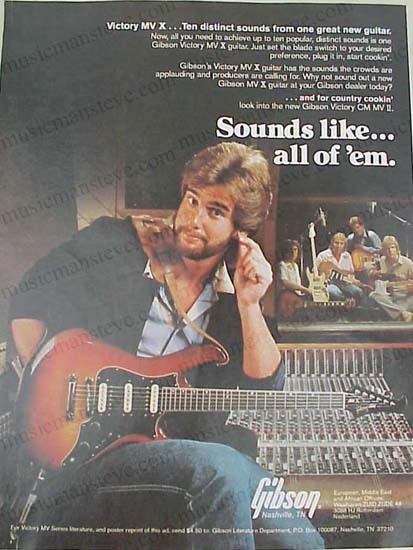 This is a cool early ad for RANDALL INSTRUMENTS featuring Randall Amp endorser JOHN BELAND with AIMS guitar..
1982 RHODES Keyboard PRINT AD shown in the photo. 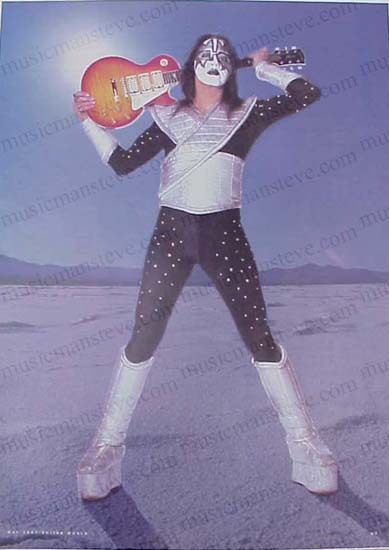 This is an original print ad from a 1982 magazine that measures approximately 8 1/4" x 11" and is suitable for framing. 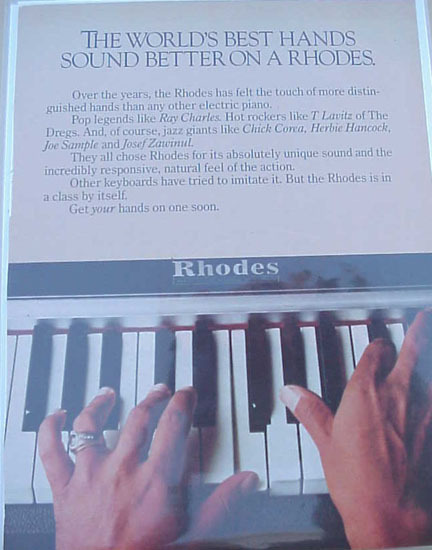 This is a cool vintage ad for RHODES listing many endorsers. 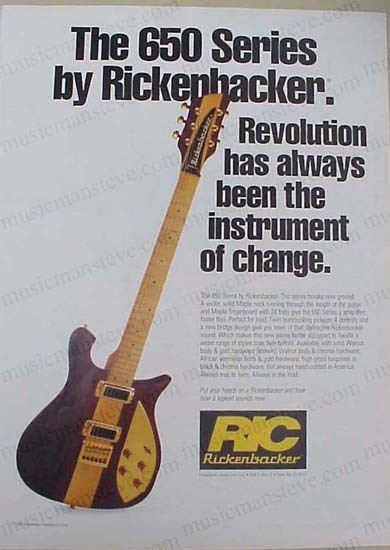 1997 RICKENBACKER 650 GUITAR PRINT AD shown in the photo is an original print ad from a 1997 magazine that measures approximately 8" x 11" ..650 Series, "Revolution has always been the instrument of change". 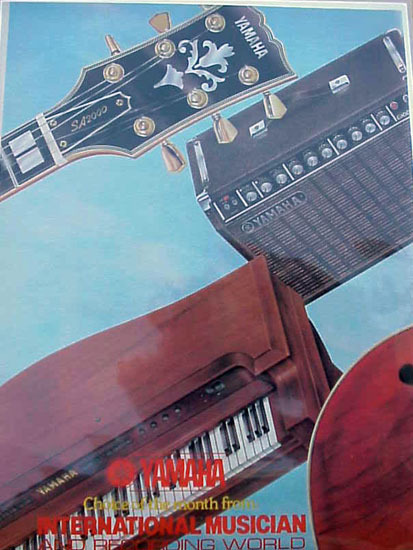 1979 ROLAND PRINT AD shown in the photo is an original print ad from a 1979 magazine that measures approximately 8 1/2" x 11" and is suitable for framing. 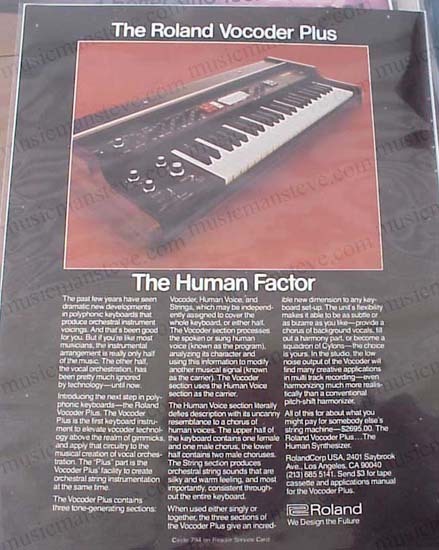 This is a cool early ad for ROLAND featuring the ROLAND VOCODER PLUS... the byline "The Human Factor..."
1979 SCHECTER GUITAR RESEARCH PRINT AD shown in the photo is an original print ad from a 1979 magazine that measures approximately 8 1/2" x 11" and is suitable for framing. 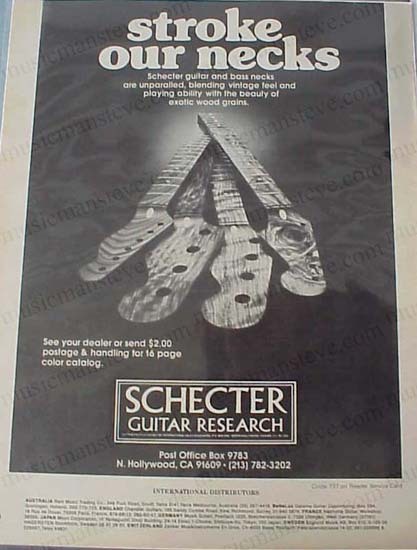 This is a cool early ad for SCHECTER showing their exotic wood grain guitar necks with the byline "stroke our necks..."
1982 SCHECTER SHOP PRINT AD shown in the photo is an original print ad from a 1982 magazine that measures approximately 8" x 11" ..Schecter Guitar Research & network shops. 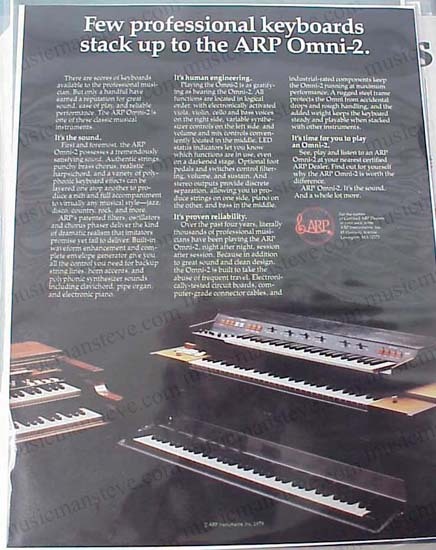 1982 SEQUENTIAL CIRCUITS PRINT AD shown in the photo. 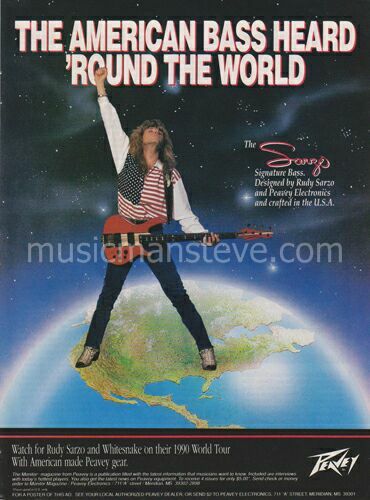 This is an original print ad from a 1982 magazine that measures approximately 8" x 11" and is suitable for framing. 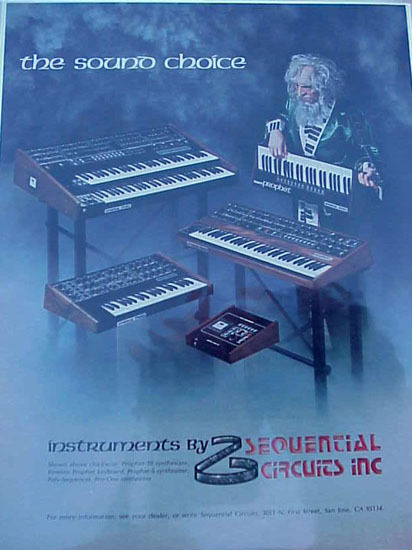 This is a cool vintage ad for SEQUENTIAL CIRCUITS featuring Prophet Synthesizers. 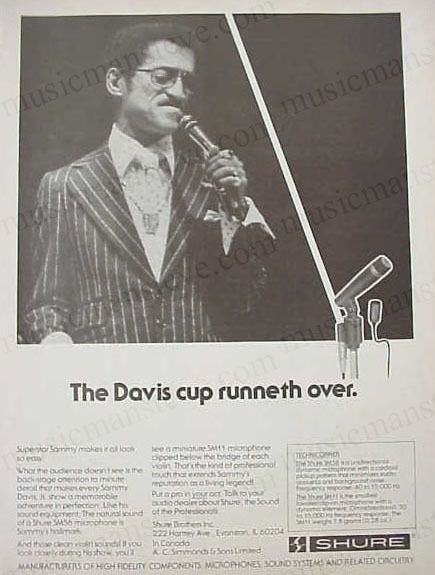 1977 SHURE MICROPHONE AD features SAMMY DAVIS JR. shown in the photo. 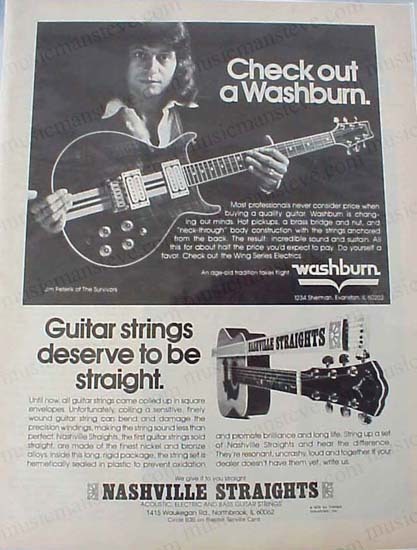 This is an original print ad from a 1977 magazine that measures approximately 8" x 10 1/2" and is suitable for framing. 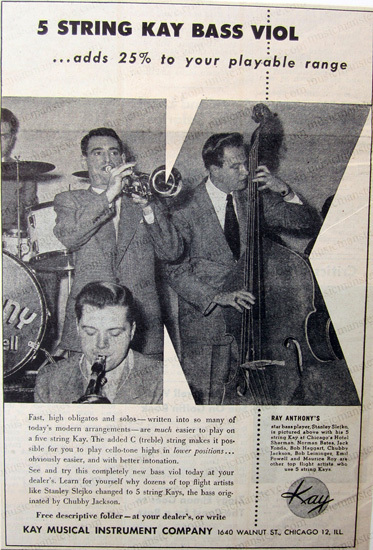 Features Sammy Davis Jr with a Shure mic offered at this time.... byline is "The Davis cup runneth over."..... 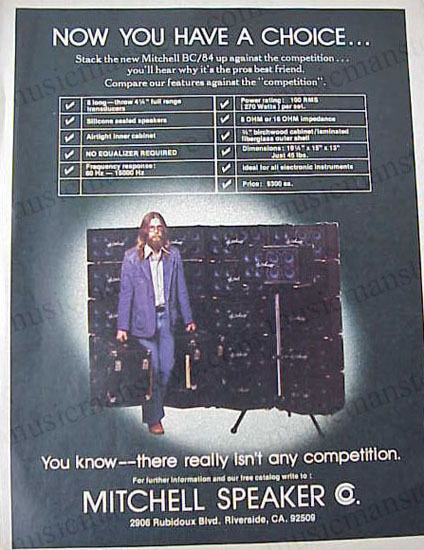 ..
1978 SHURE BETA PRINT AD shown in the photo. 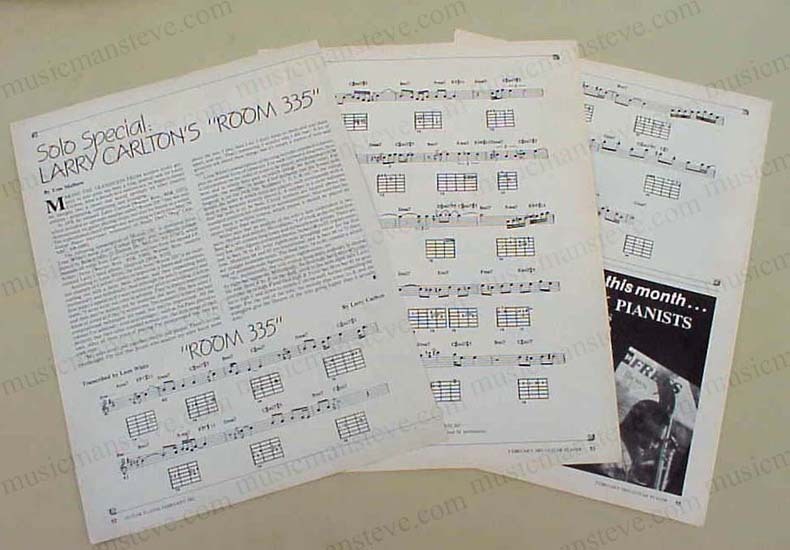 This is an original print ad from a 1978 magazine that measures approximately 8" x 10 3/4" and is suitable for framing. 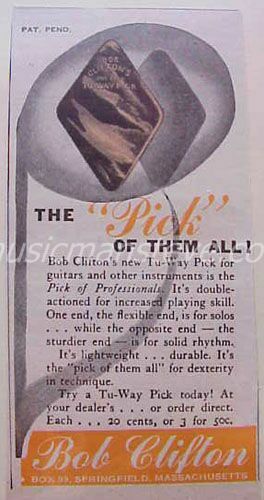 This is a cool early ad for SHURE with ad-line "Choose Your Vocal Microphone the Way Little Feat Does....as if your Career Depended on it" . 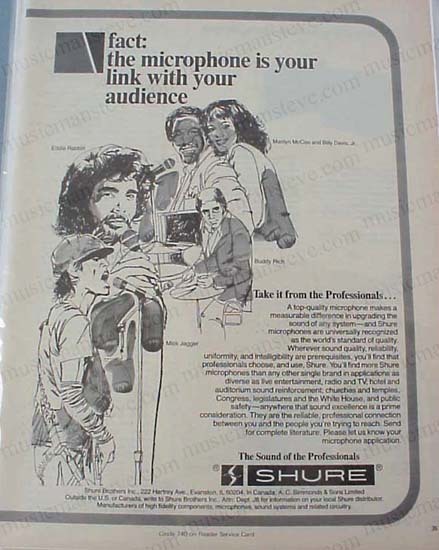 1979 SHURE MICROPHONE AD features Mick Jagger, Buddy Rich, Eddie Rabbitt, Marilyn McCoo and Billy Davis, Jr shown in the photo. 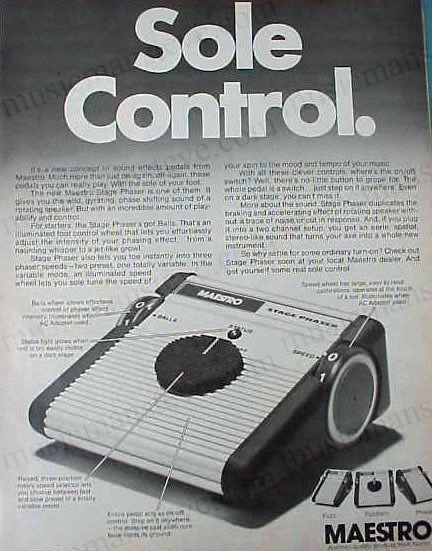 This is an original print ad from a 1979 magazine that measures approximately 8 1/2" x 11" and is suitable for framing..byline is "Take it from the Professionals"..... ..
1982 SHURE LOUDSPEAKERS PRINT AD shown in the photo is an original print ad from a 1982 magazine that measures approximately 8" x 11" .."chamber music...Shure style"...cool pin-up to frame. 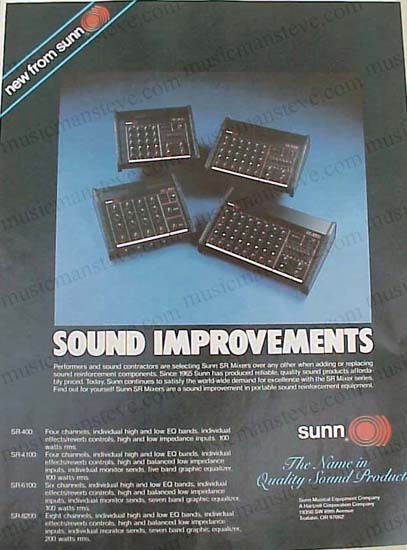 1982 SUNN MUSICAL EQUIPMENT PRINT AD shown in the photo is an original print ad from a 1982 magazine that measures approximately 8" x 11" .."Sound Improvements"...pin-up to frame. 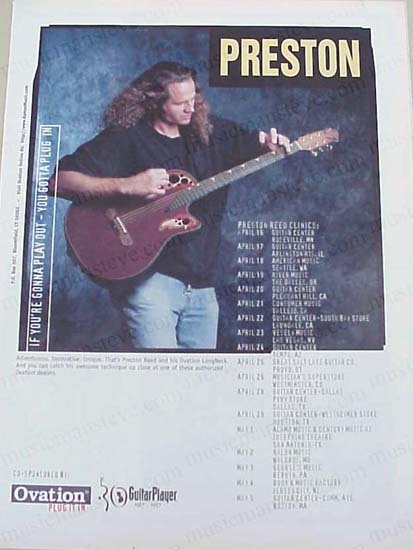 1997 TACOMA GUITARS PRINT AD shown in the photo is an original print ad from a 1997 magazine that measures approximately 8" x 11" ..Shows 5 flattop models. 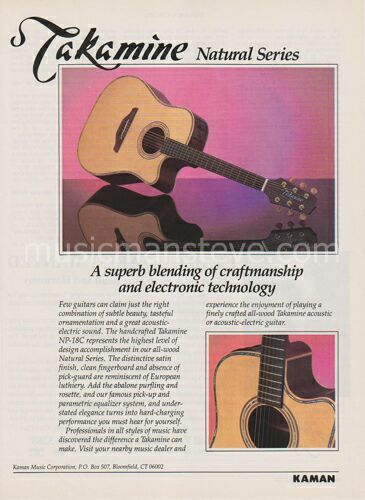 1990 TAKAMINE PRINT AD from the KAMAN MUSIC CORP shown in the photo. 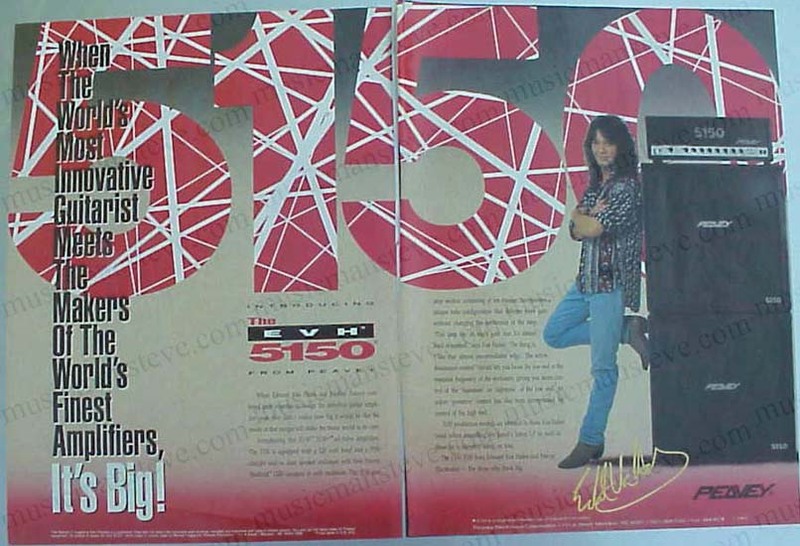 This is an original print ad from a 1990 magazine that measures approximately 8" x 10 3/4" and is suitable for framing. 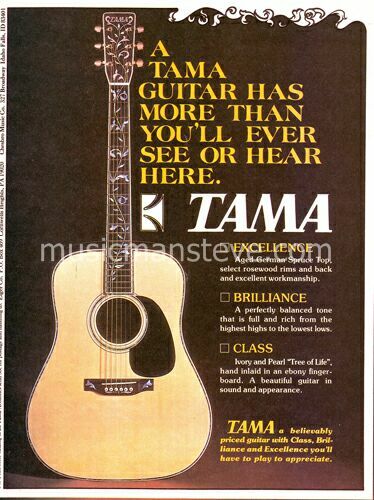 This is a cool early ad showing the cutaway flattop acoustic NATURAL SERIES guitars.The ad line is "A SUPERB BLENDING OF CRAFTMANSHIP AND ELECTRONIC TECHNOLOGY"..
1976 TAMA Guitar PRINT AD shown in the photo. 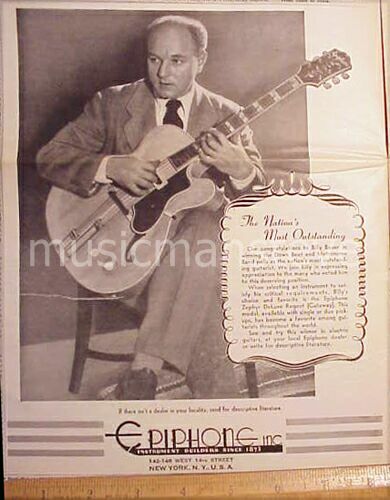 This is an original print ad from an old magazine that measures approximately 8" x 10 1/2" and is suitable for framing. 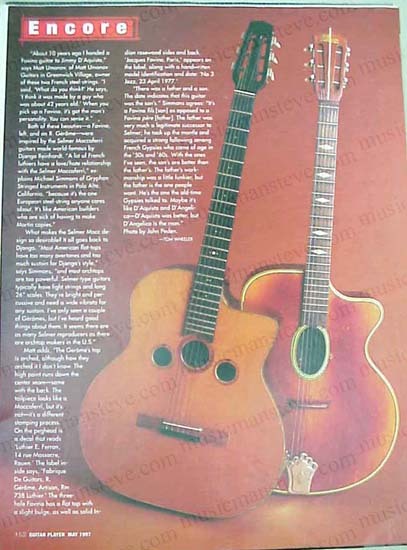 Shows the fancy "tree of life" inlaid acoustic. 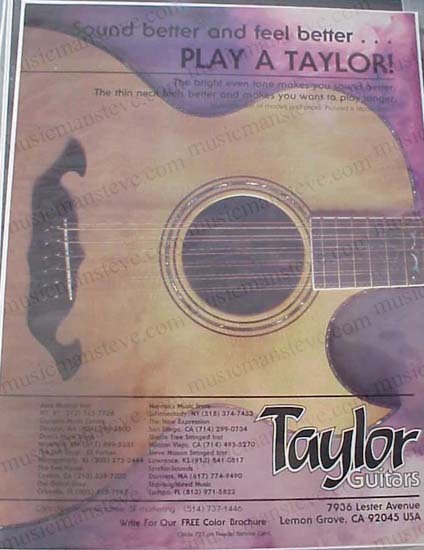 1979 TAYLOR GUITAR PRINT AD shown in the photo is an original print ad from a 1979 magazine that measures approximately 8 1/2" x 11" and is suitable for framing. 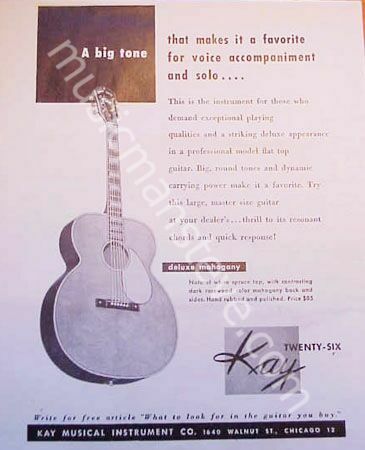 This is a cool early ad for TAYLOR GUITAR featuring a Taylor cutaway flattop... the byline "Sound better and feel better....Play a Taylor!" 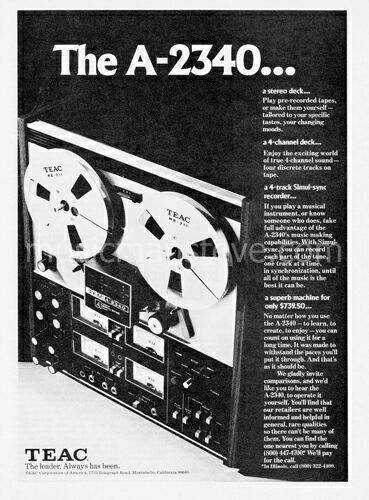 1978 TEAC STEREO TAPE RECORDER PRINT AD shown in the photo. 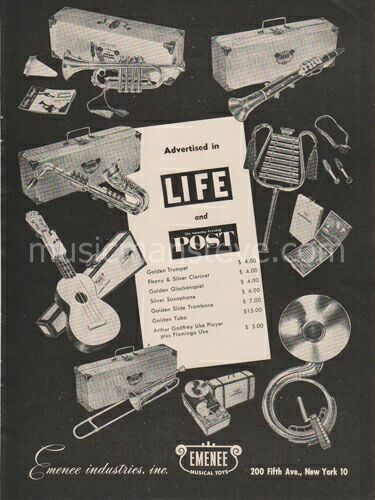 This is an original print ad from a 1978 magazine that measures approximately 8" x 10 3/4" and is suitable for framing. 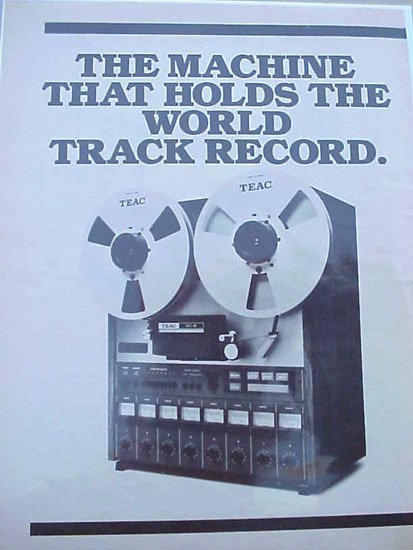 This is a cool early ad by TEAC showing the A-2340 4-channel Stereo reel to reel tape deck..
1978 TEAC REEL TO REEL PRINT AD shown in the photo. 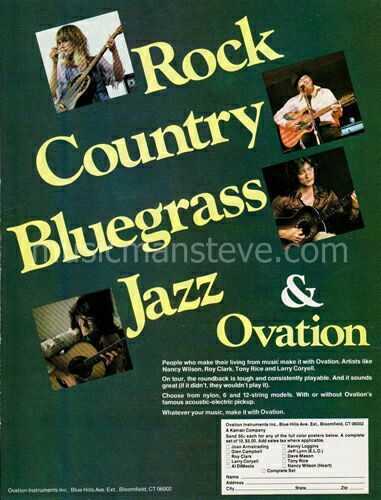 This is an original print ad from a 1978 magazine that measures approximately 8" x 10 3/4" and is suitable for framing. 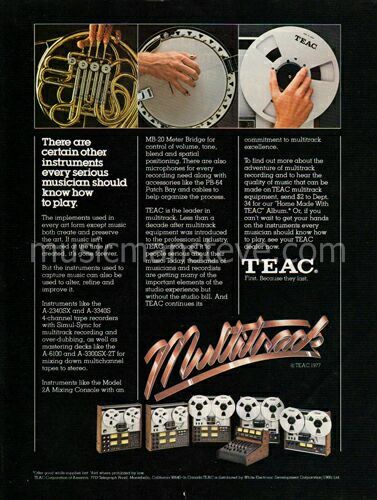 This is a cool early ad featuring TEAC Reel to Reel multitrack recorders. 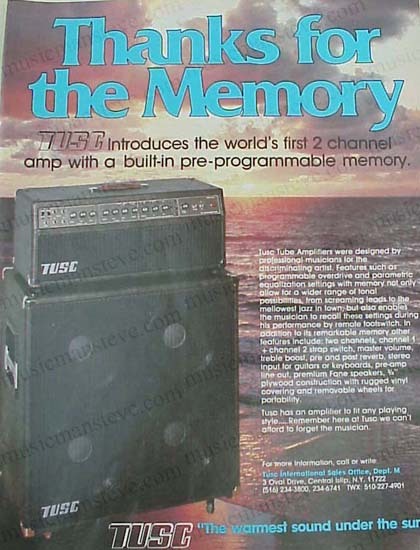 1982 TUSC TUBE AMPLIFIERS PRINT AD shown in the photo is an original print ad from a 1982 magazine that measures approximately 8" x 11" ...nice amp pin-up to frame. 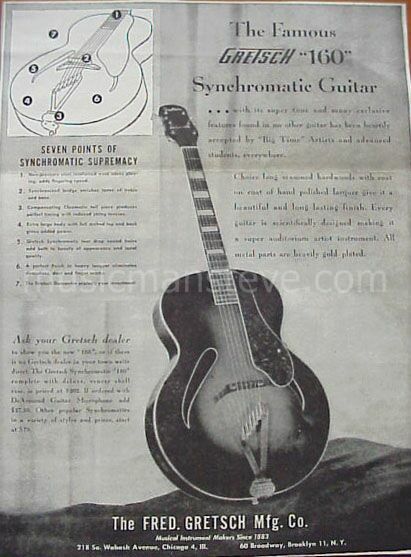 1950 VALCO "Electronic Guitars" PRINT AD shown in the photo is an original small format print ad from a 1950 magazine that measures only 2" x 1 3/4" and is suitable for framing. 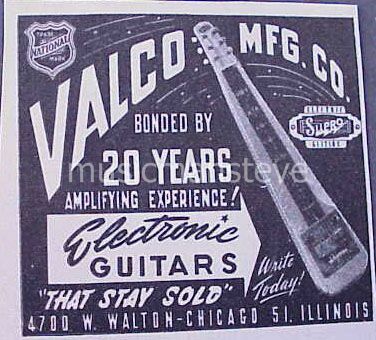 This is a cool early ad by the Valco Mfg Co (Chicago makers of National and Supro guitars at the time) showing a vintage lap steel...byline is "Electronic Guitars That Stay Sold"
1947 VEGA ELECTRIC GUITAR PRINT AD shown in the photo is an original print ad from a 1947 magazine that measures approximately 6 1/2" x 7 1/2" and is suitable for framing. 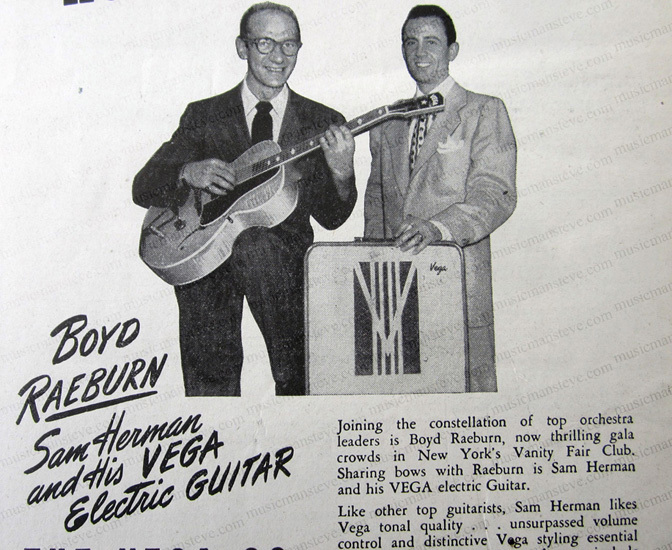 This is a cool early ad for VEGA showing SAM HERMAN and his VEGA along with Boyd Raeburn orchestra leader... byline is "Headed for Fame!.." 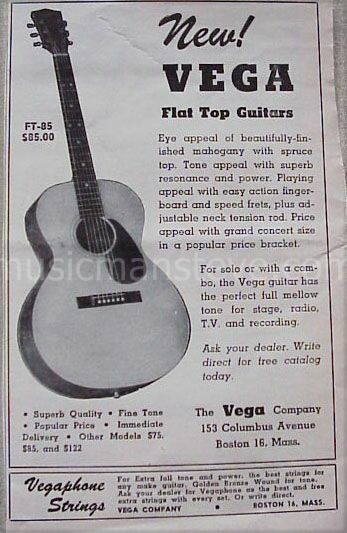 1951 VEGA FT-85 FLAT TOP GUITAR PRINT AD shown in the photo is an original print ad from a 1951 magazine that measures approximately 4" x 6 1/2" and is suitable for framing. 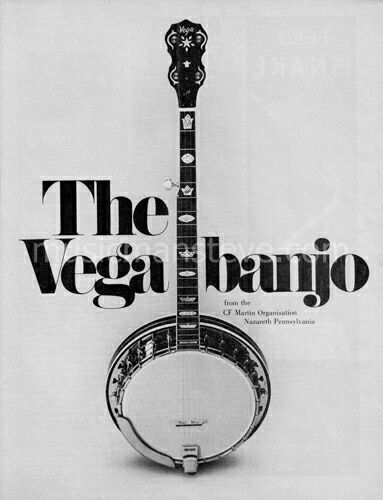 This is a cool early ad by the Boston Vega Company showing the new Vega Flat Top Guitar FT-85 offered at the time... "...for stage, radio, T.V and recording"
1978 VEGA BANJO PRINT AD shown in the photo. 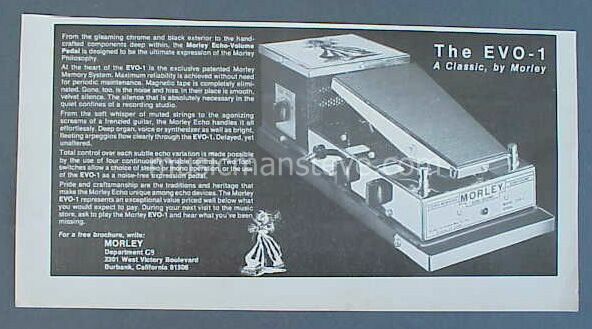 This is an original print ad from a 1978 magazine that measures approximately 8" x 10 3/4" and is suitable for framing. 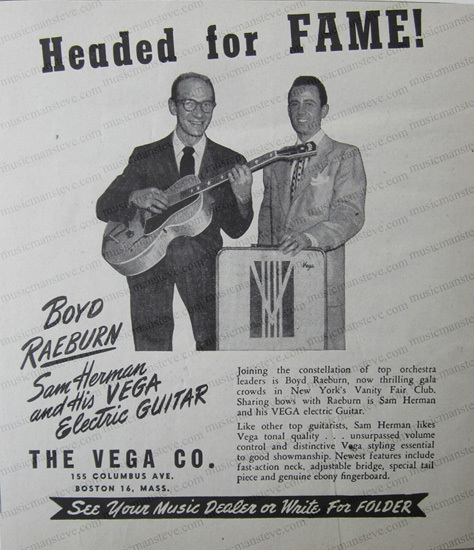 This is a cool early ad by the CF Martin Organisation (makers of Vega banjos at the time) showing a Vega 5 string banjo (VIP model I believe). .
VOICE BOX PRINT AD shown in the photo. 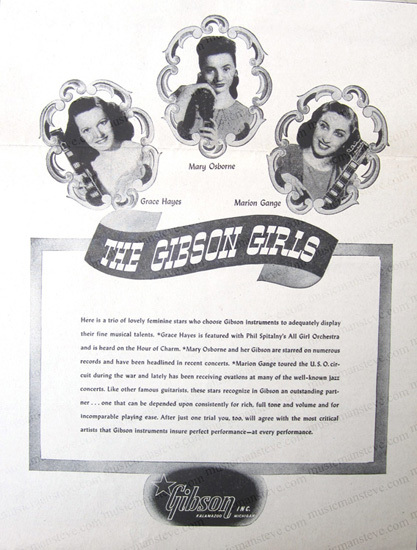 This is an original print ad from an old magazine that measures approximately 8" x 11" and is suitable for framing. 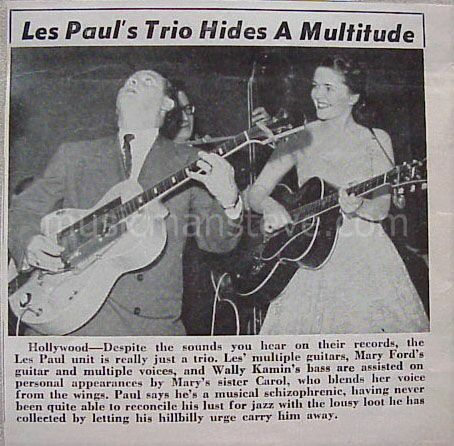 Shows Voice Box being used by a Les Paul guitarist back in the day. 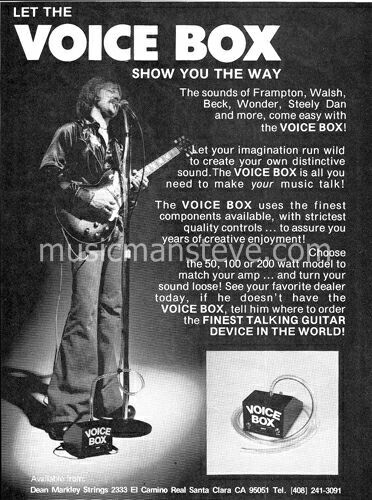 "LET THE VOICEBOX SHOW YOU THE WAY"
1982 VOX AMPLIFIER PRINT AD shown in the photo is an original print ad from a 1982 magazine that measures approximately 8" x 11" ..WARNING! 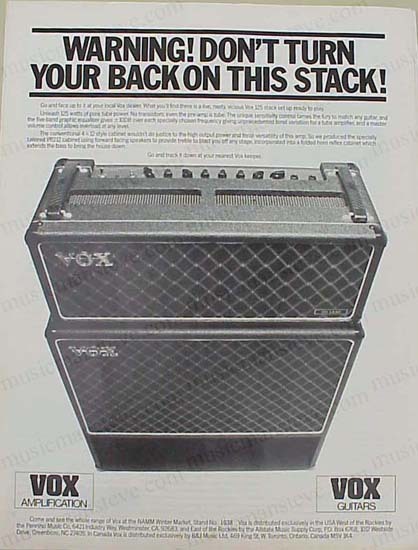 Don't turn your back on this STACK!.shows Vox 125 Stack. 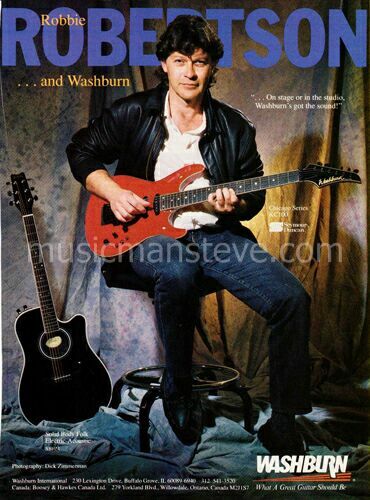 1982 WASHBURN GUITARS PRINT AD shown in the photo is an original print ad from a 1982 magazine that measures approximately 8" x 11" ..Micky Moody & Festival Series guitar. 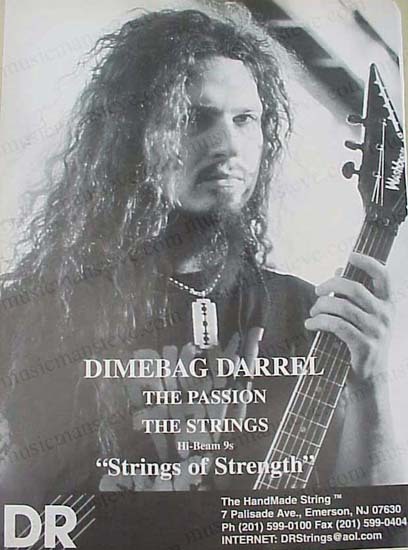 1997 WASHBURN GUITAR PRINT AD shown in the photo is an original print ad from a 1997 magazine that measures approximately 8" x 11" ..features DIMEBAG DARRELL "CONGRATULATIONS DIME". 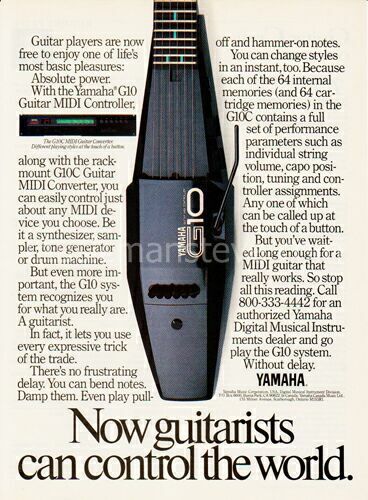 1978 YAMAHA GUITARS PRINT AD shown in the photo. 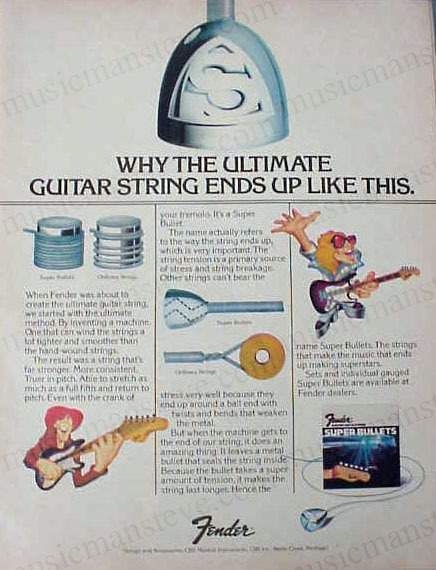 This is an original print ad from a 1978 magazine that measures approximately 8" x 10 3/4" and is suitable for framing. 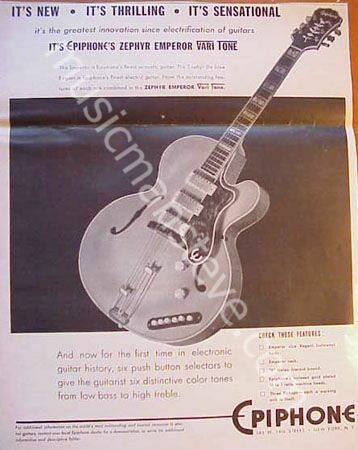 This is a cool early ad for YAMAHA that shows a flame top solid body electric with ad-line "Anything But Standard" (clearly a dig at Gibson...) . 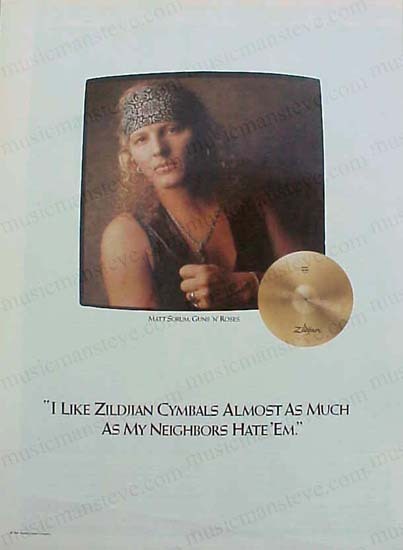 1997 ZILDJIAN CYMBALS PRINT AD shown in the photo is an original print ad excerpted from a 1997 magazine that measures approximately 8" x 11" ..features MATTT SORUM of GUNS N' ROSES "I Like Zildjian Cymbals Almost As Much As My Neighbors Hate 'Em"